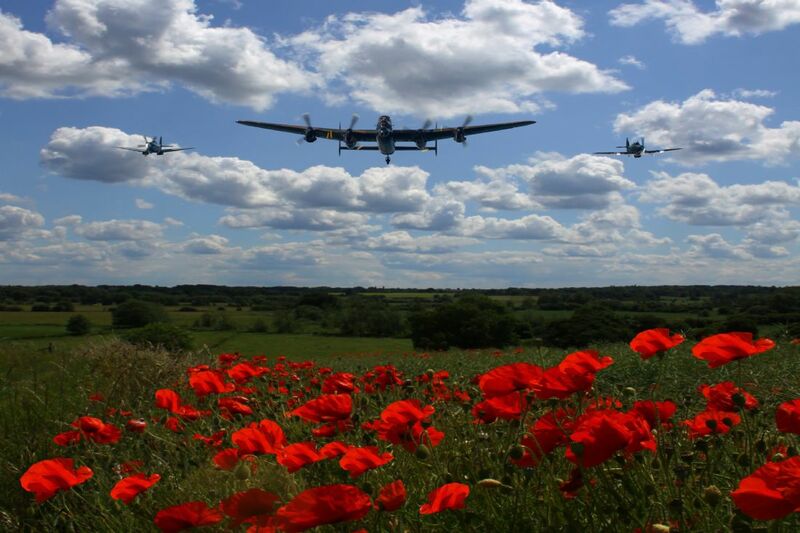 The Battle of Britain Memorial Flight doing a flypast over a field of poppies in the South Oxfordshire countryside near Reading. created using my own photos. 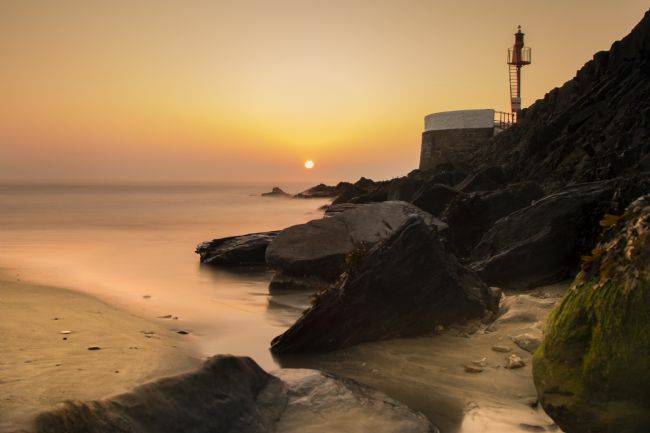 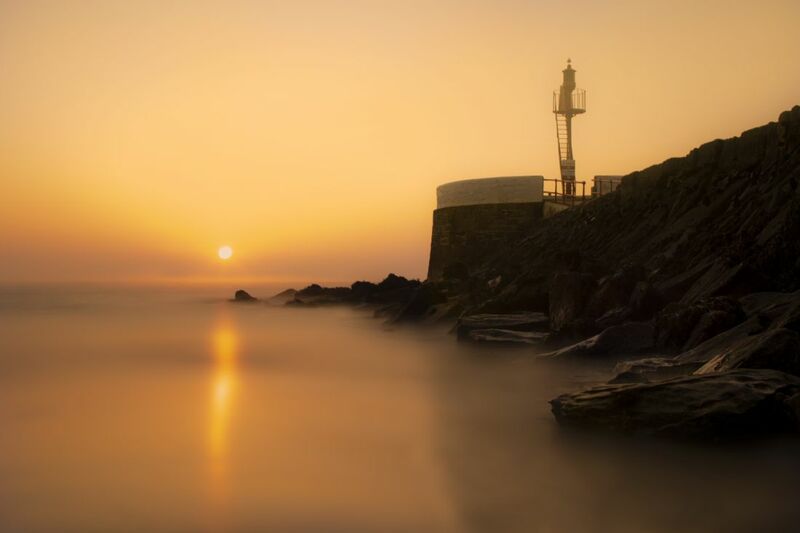 The sun rising at Looe Beach, this image of the sunrise at Looe was taken early on a February morning by the Banjo pier near the harbour mouth. 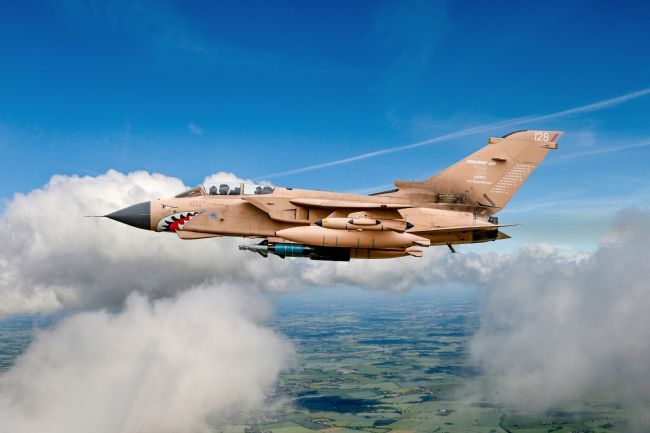 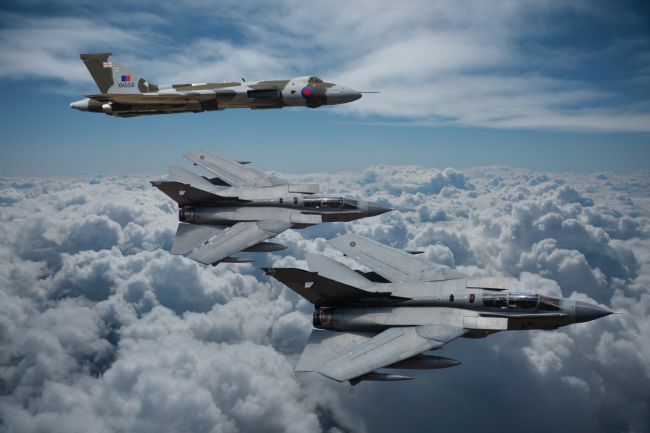 Three Tornado GR4 based at RAF Marham depicted here on a farewell photo sortie of the three special paint scheme GR4 consisting of the Camo GR4, the 31 Squadron Goldstar GR4, and the 9B Squadron Bat tail GR4, the Tornado GR4 has been in service with the RAF for 36 years now having entered service in the early 1980's. This image was created as a tribute to the Panavia Tornado GR4 using 4 of my images combined in editing software to commemorate the impending retirement of the type from RAF service. 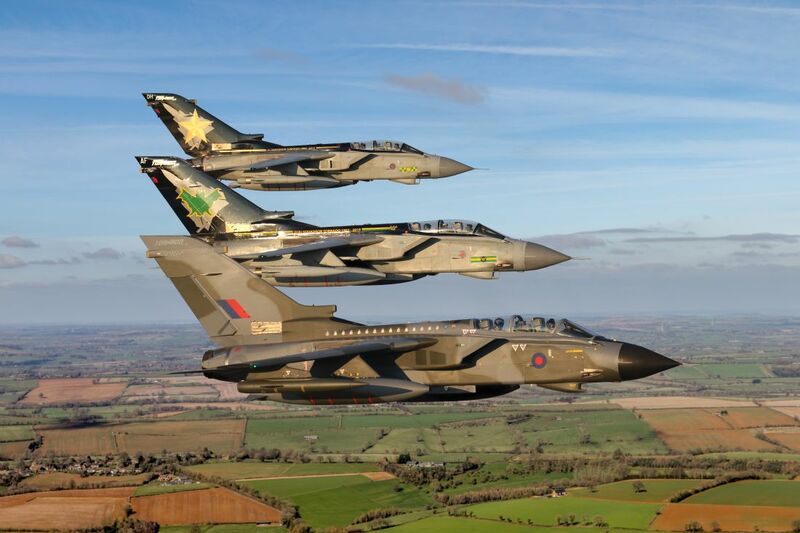 Three Tornado GR4 based at RAF Marham returning from a farewell photo sortie of the three special paint scheme GR4 consisting of the Camo GR4, the 31 Squadron Goldstar GR4, and the 9B Squadron Bat tail GR4, the Tornado GR4 has been in service with the RAF for 36 years now having entered service in the early 1980's. 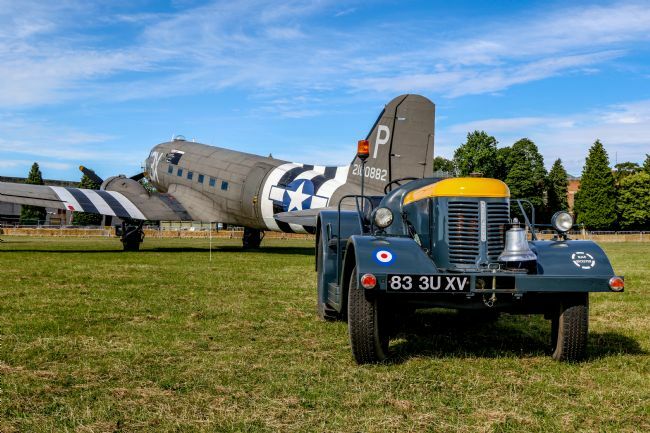 A David Brown Aircraft Towing Tractor parked in front of DC3 Dakota with the nose art 'Drag Em Oot' 3X, taken at Bicester Heritage C&C Show. 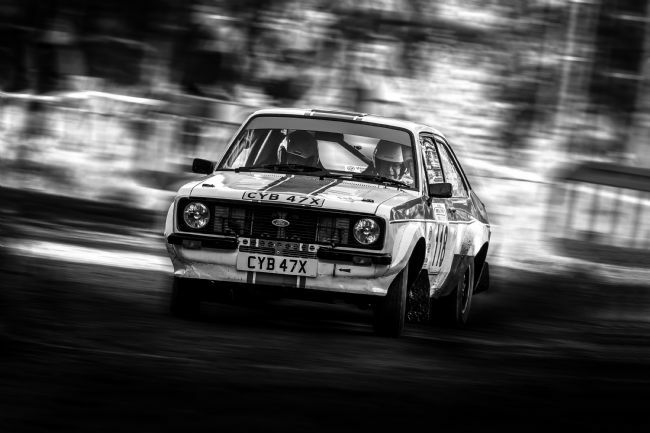 I have kind permission from Bicester Heritage to make prints available of these subjects. 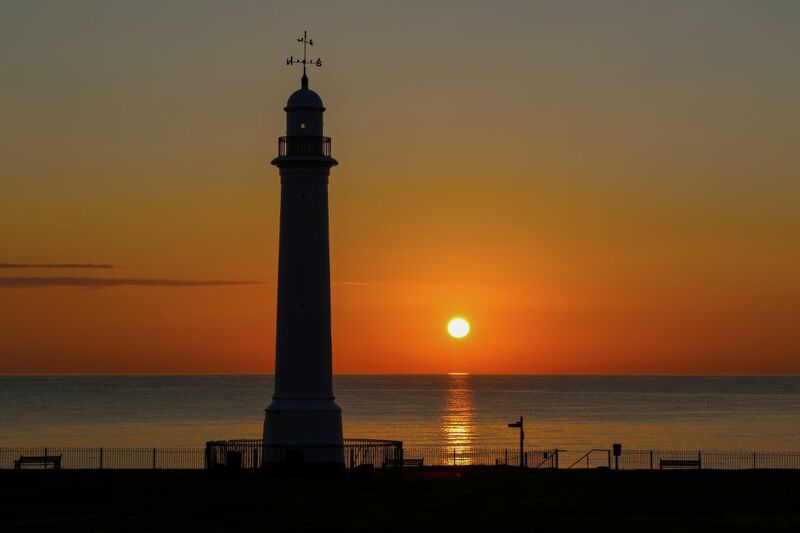 The Sun rises at Roker Pier in Sunderland while fisherman try for an early morning catch. 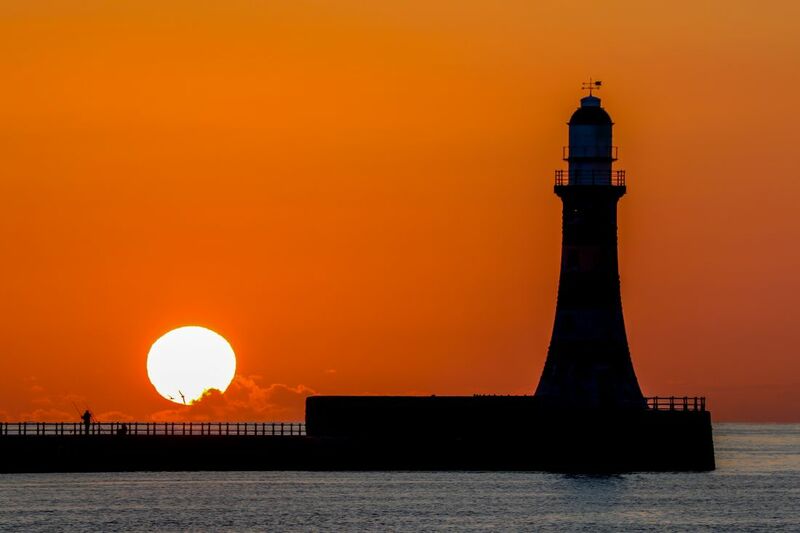 This sunrise was caught in the early hours at Roker beach from near the Bungalow Cafe car park. 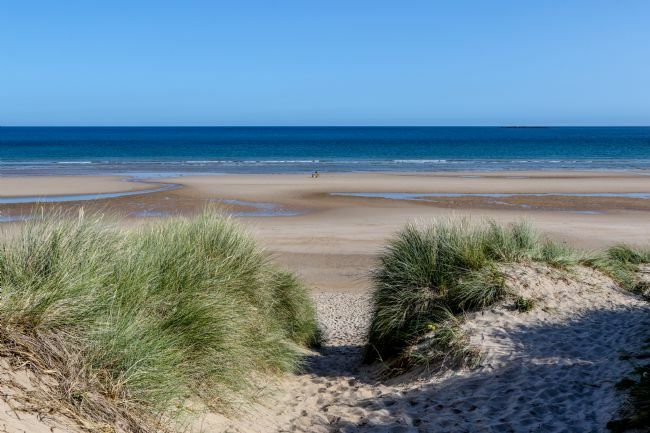 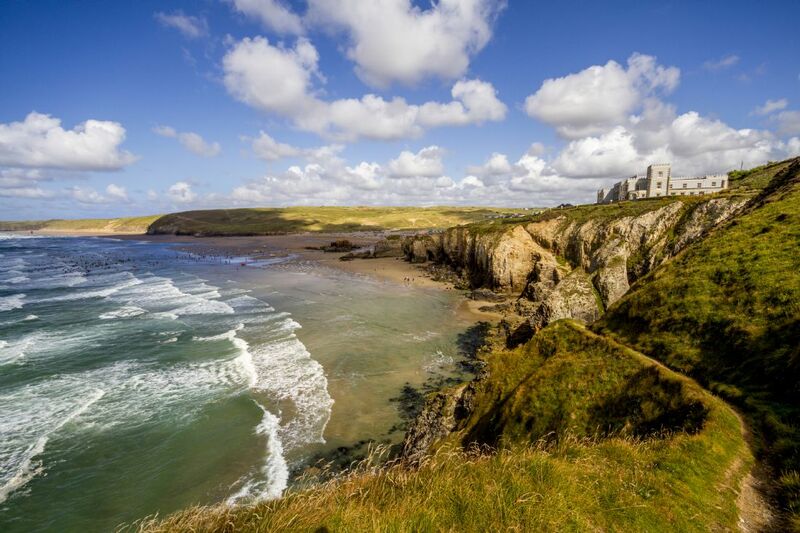 The Sand Dunes leading down to the beach at at Bamburgh Castle in Northumberland, the Beach is exceptionally pretty and clean, with the Farne Islands just to the left of this area. 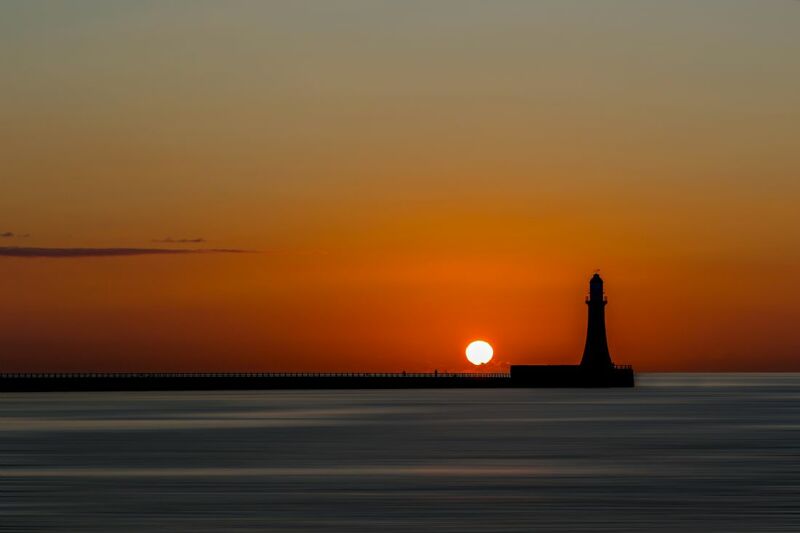 The Sun rising up at Roker Pier in Sunderland with a couple of fisherman and sea birds flying past the sun. This sunrise was caught in the early hours at Roker beach from near the Marina car park. Eurofighter Typhoon in D Day markings performing its display routine at Waddington air show 2014. The Avro Vulcan Bomber in a Flypast with the Royal Air Force Red Arrows, there have been few opportunities in the Vulcan Bomber XH558 final year of flight to photograph this iconic Avro Vulcan bomber with the Red Arrows display team so was very happy to photograph this event and use the images in this . 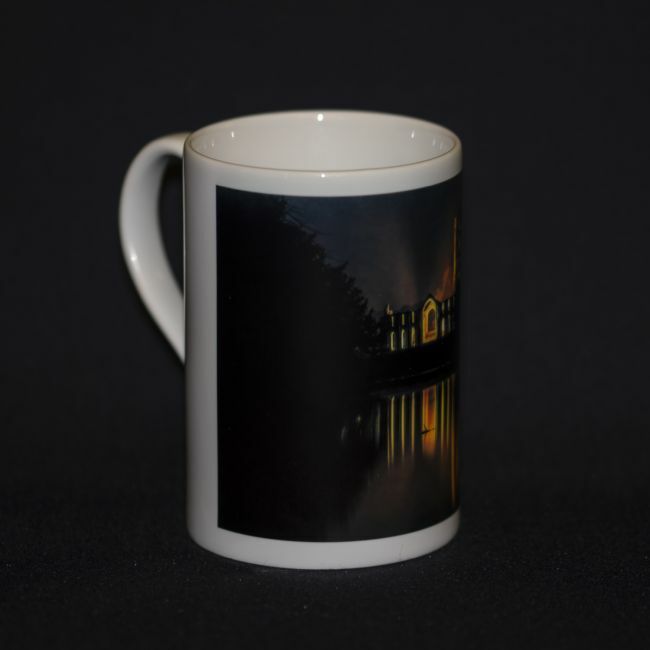 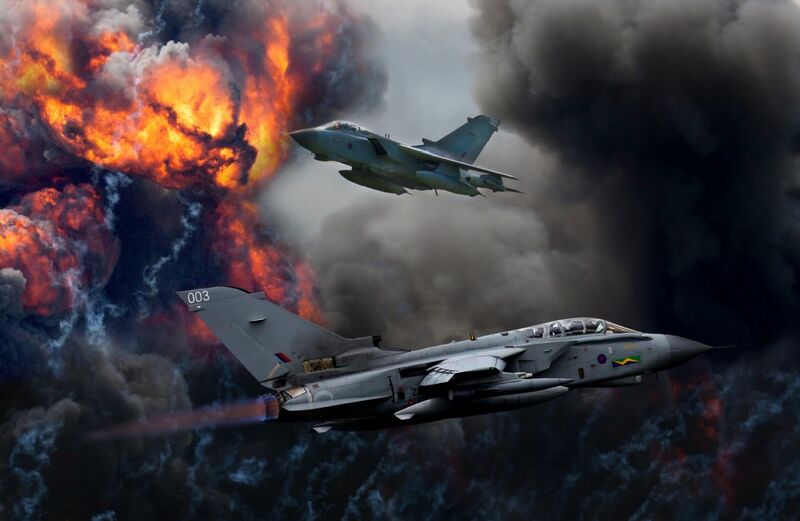 Composite image created using my photographs and background with kind permission PH images. 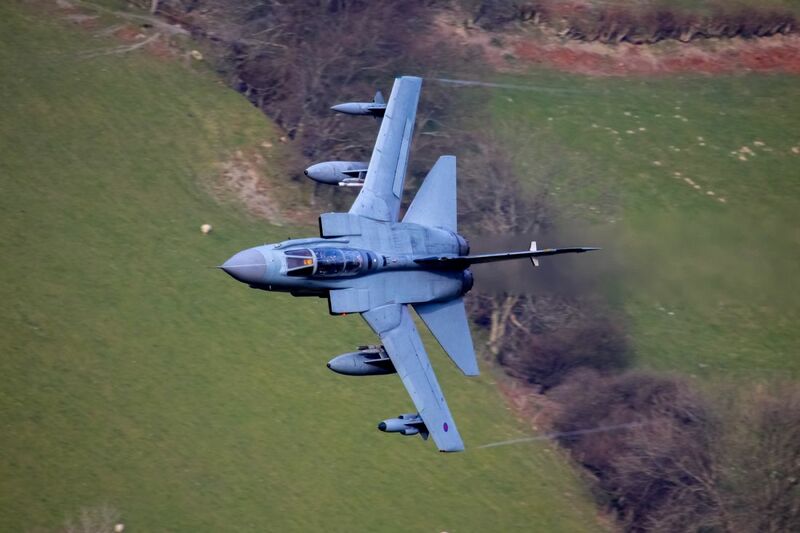 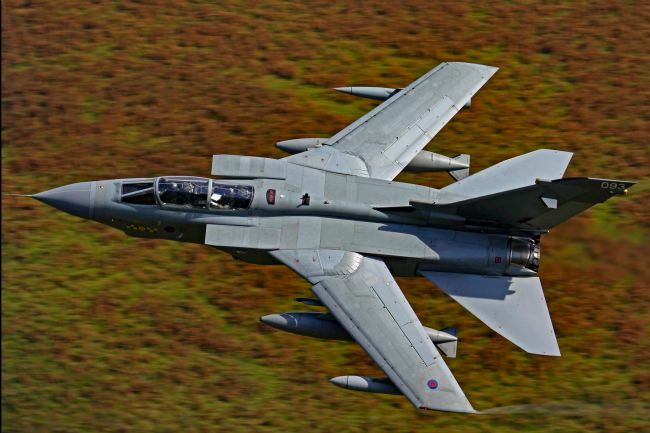 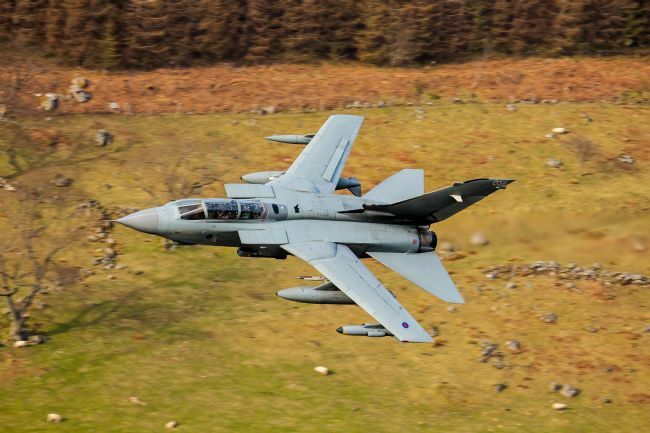 A Tornado GR4 gets low down during a low level training sortie in the Valleys of Snowdonia, This Tornado GR4, a RAF Marham airframe along with many others will be retired from service very soon. Panavia Tornado GR4 powers through the Mach Loop in Wales on a low level training sortie. 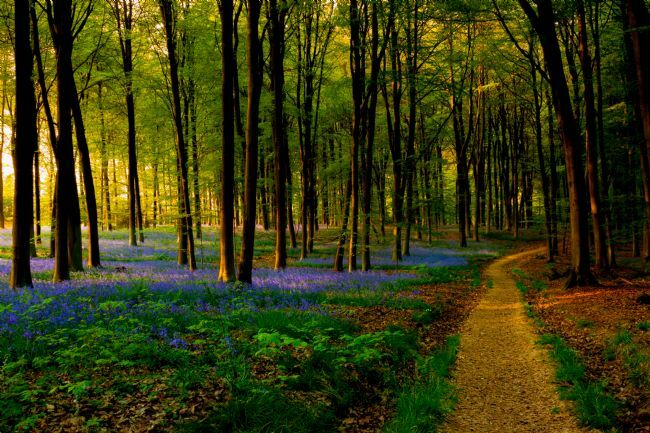 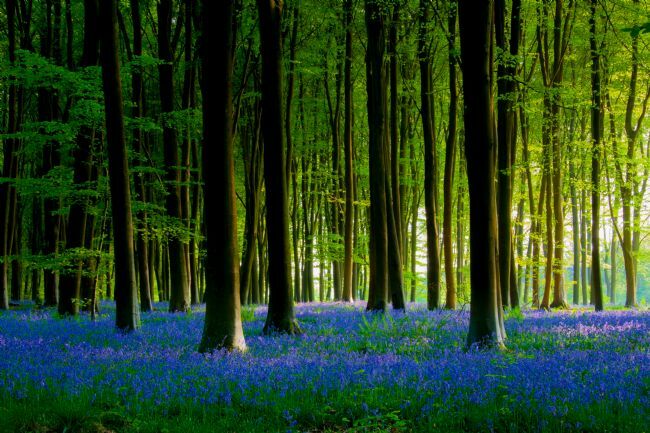 A beautiful carpet of Bluebells in a woodland near Micheldever with the suns rays coming in from the left as the sun was beginning to set in this popular bluebell woodland. 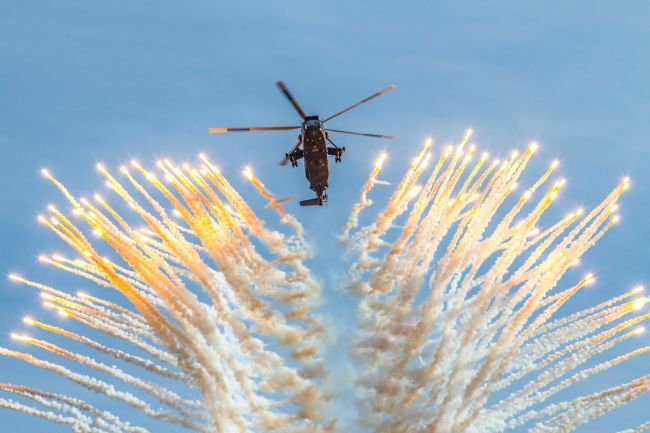 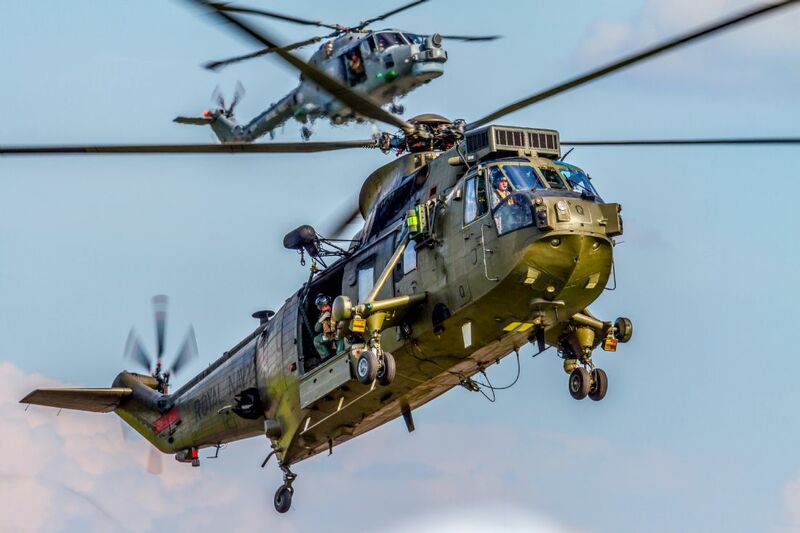 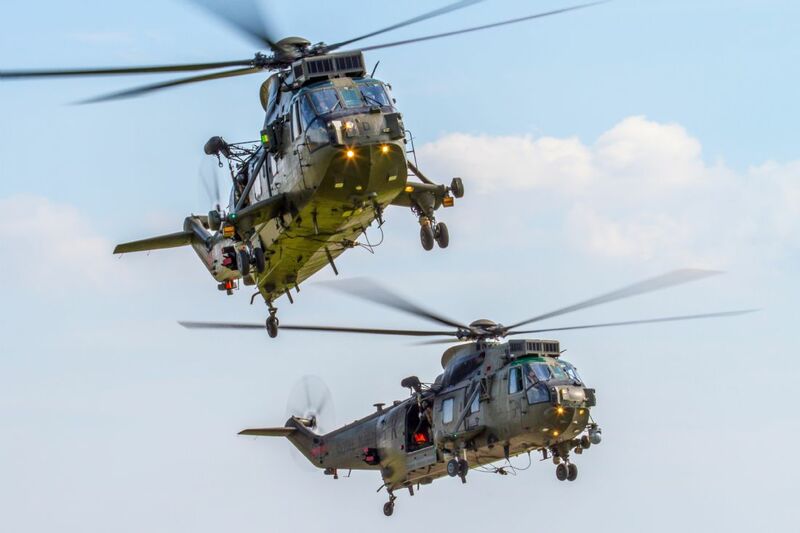 A Royal Navy Sea King and Lynx helicopters during the role demonstration at RNAS Yeovilton in Somerset 2014. 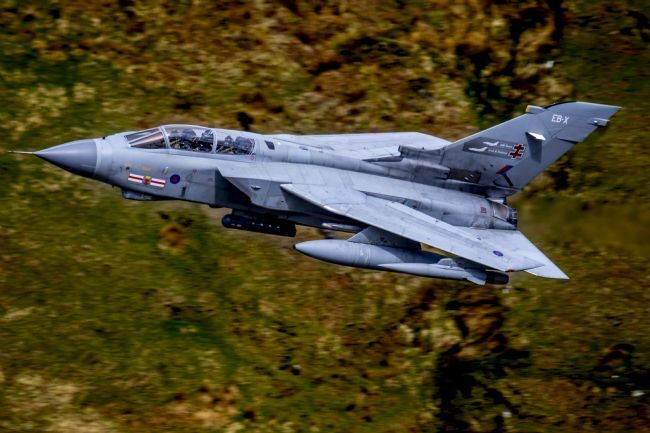 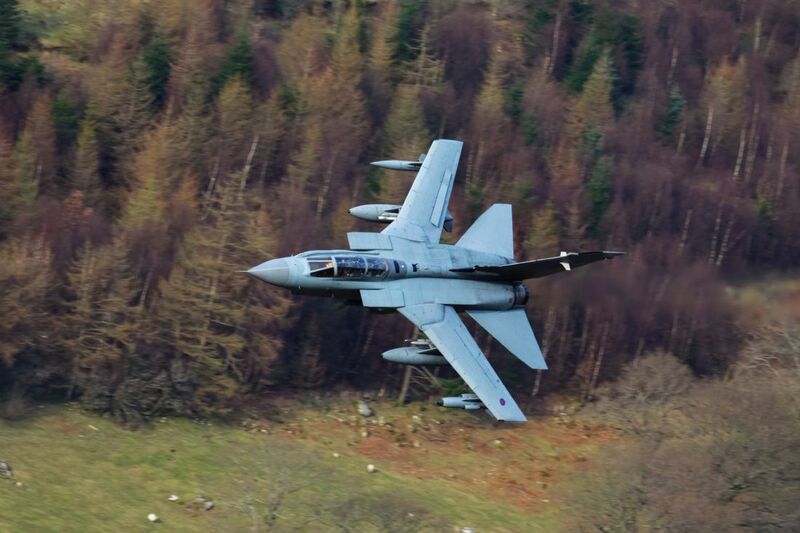 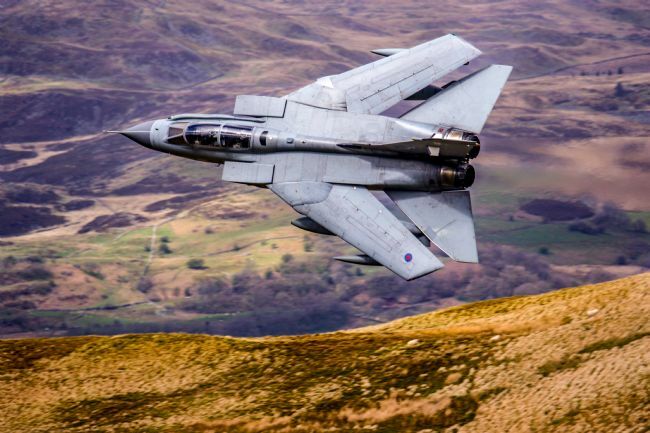 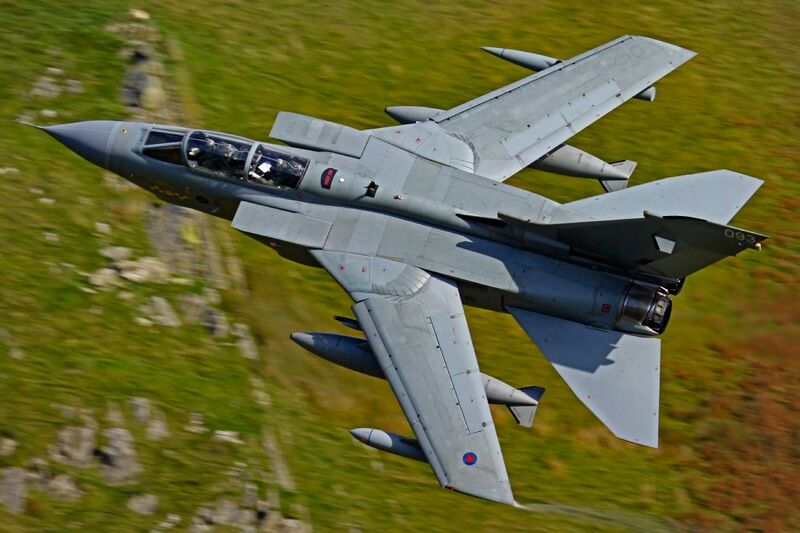 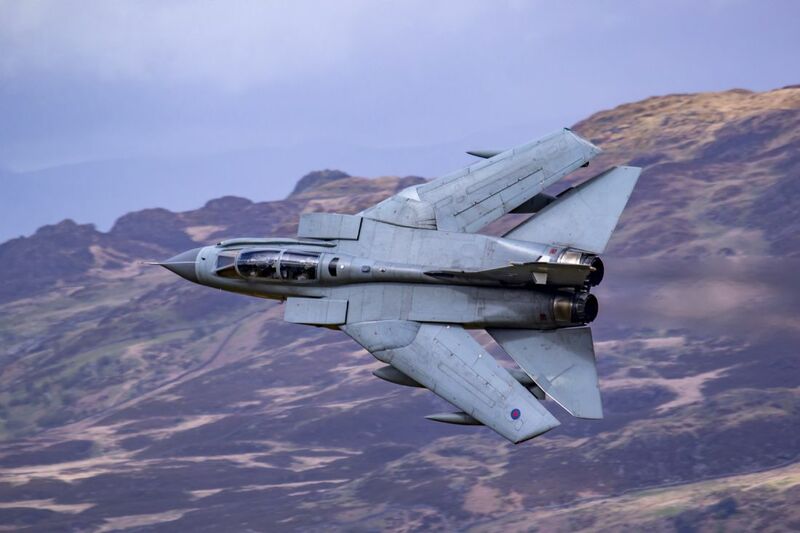 A Tornado GR4 flying at low level through the mountain areas of Snowdonia. 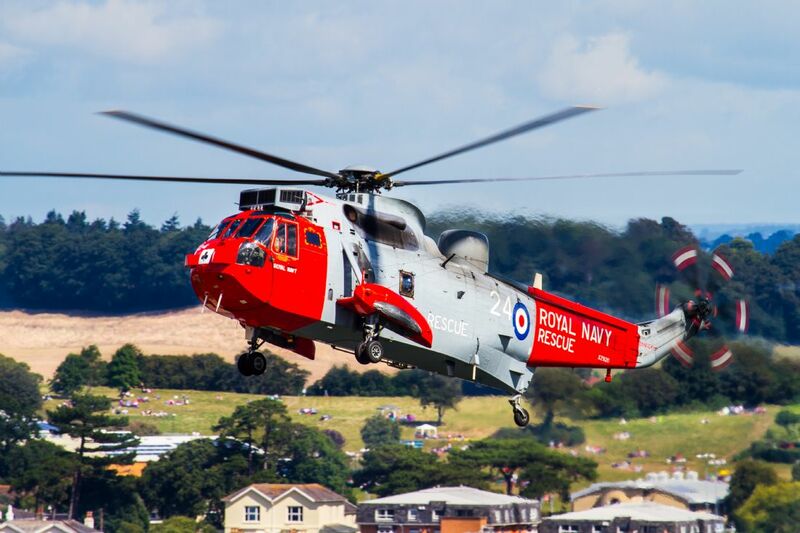 One of the RNAS Yeovilton Sea King helicopters ZE467 which took part in the air display at the Naval base in 2014. This variant of the Sea King was also known as the Junglie and was used by the Royal Marinw Commando Unit. 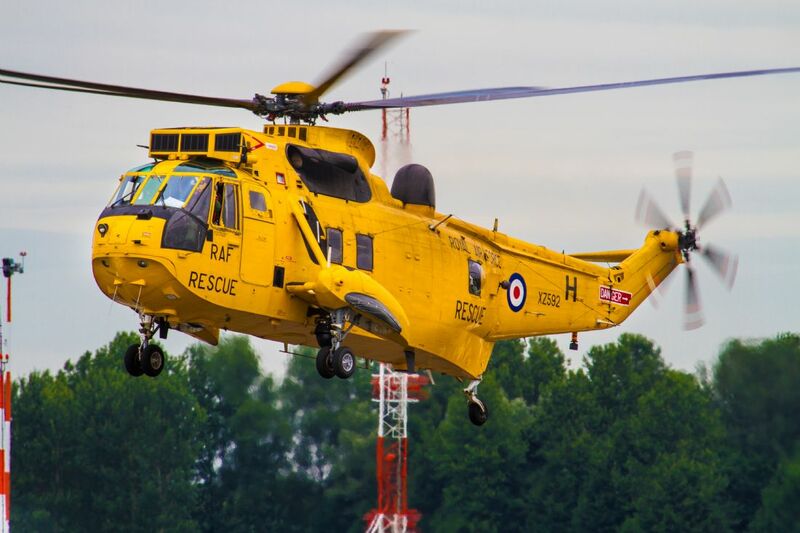 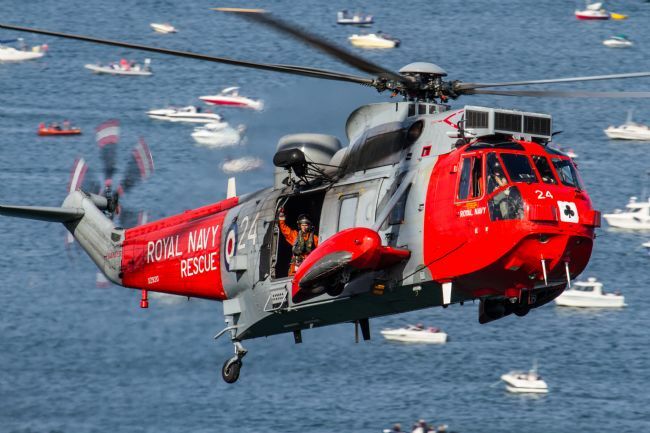 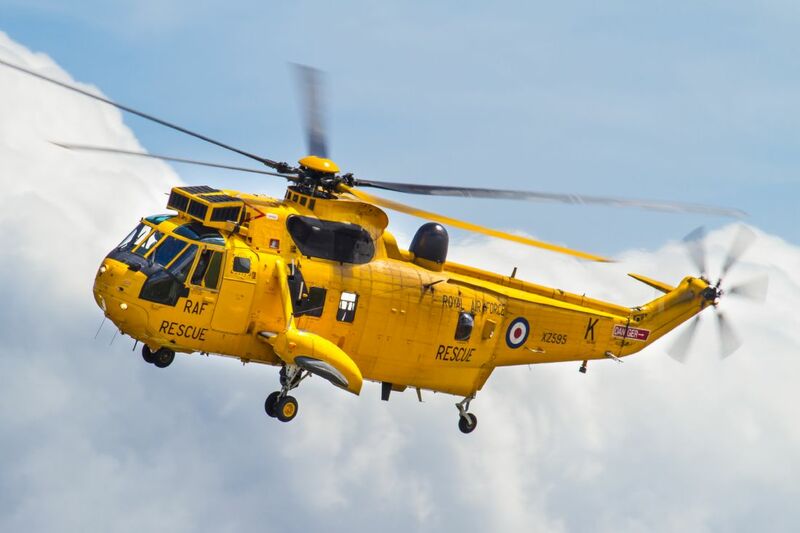 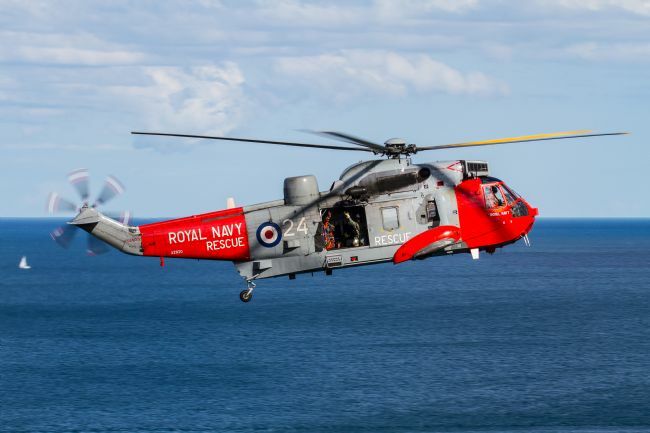 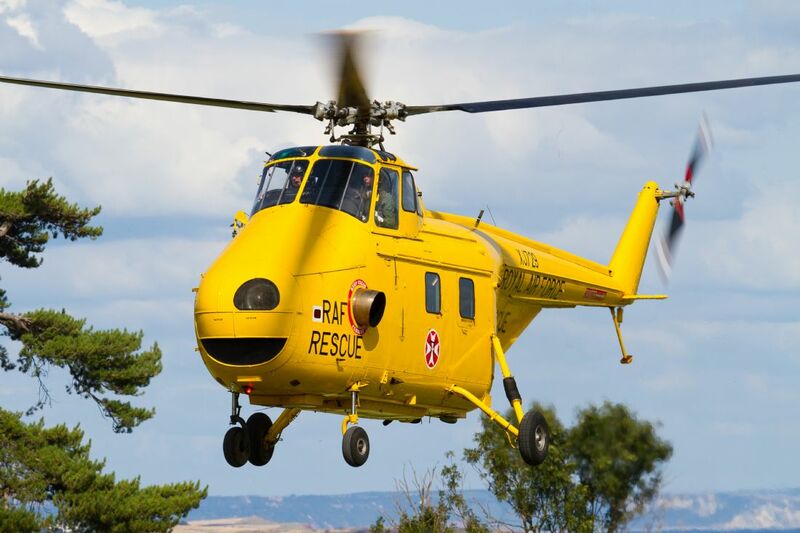 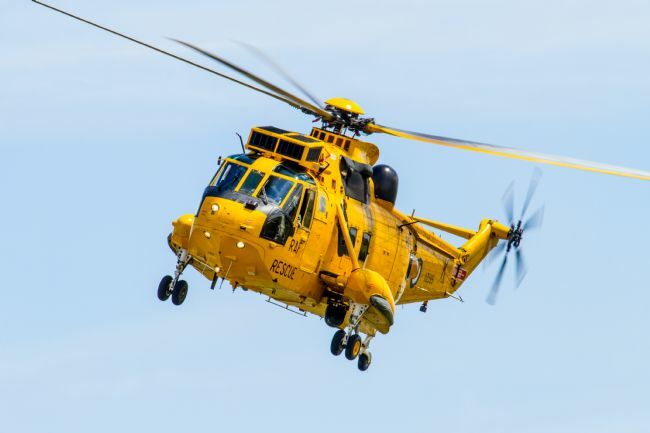 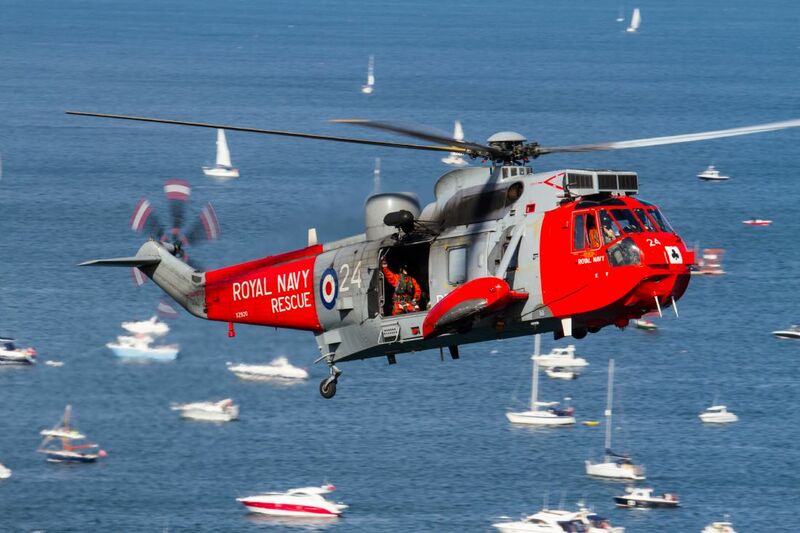 An RAF Seaking search and Rescue helicopter of 22 Squadron. 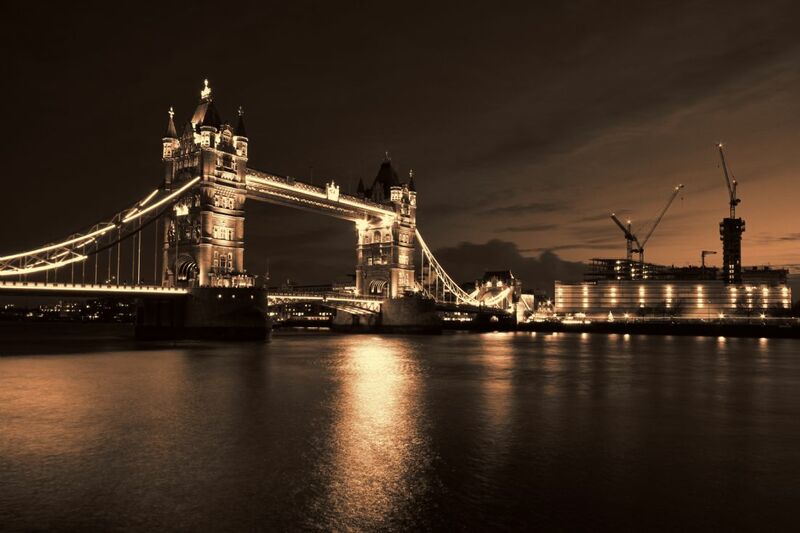 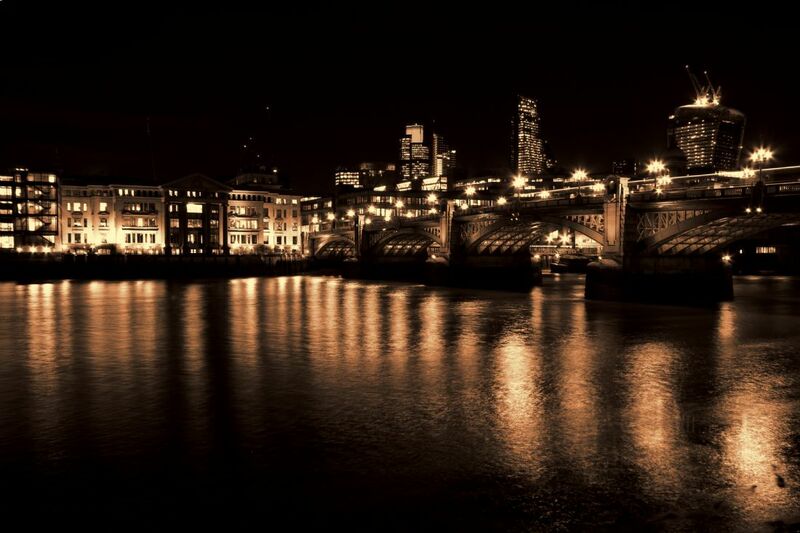 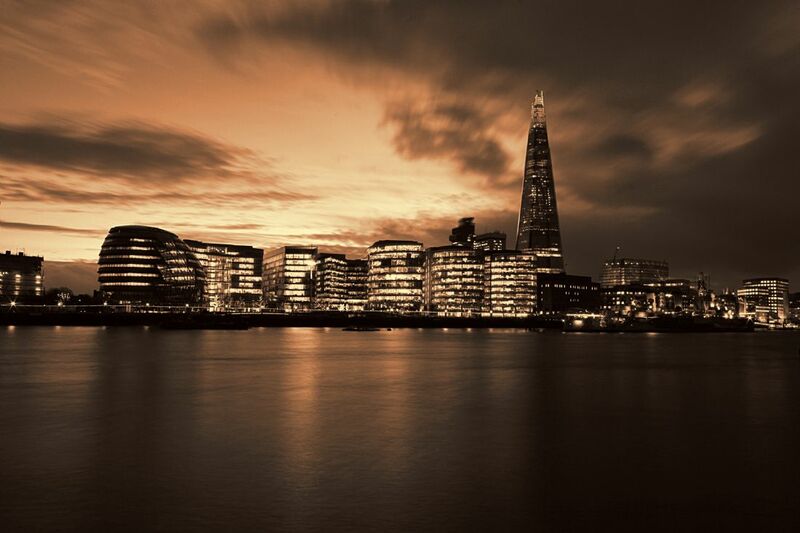 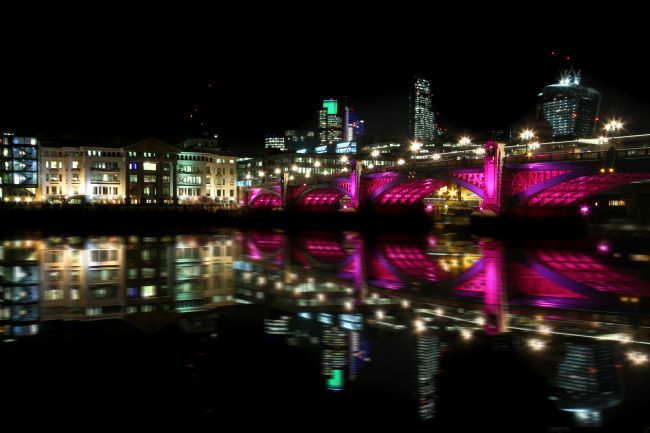 London bridge with pink lighting with the walkie talkie and cheesegrater buildings in the background, reflection added for desired effect. 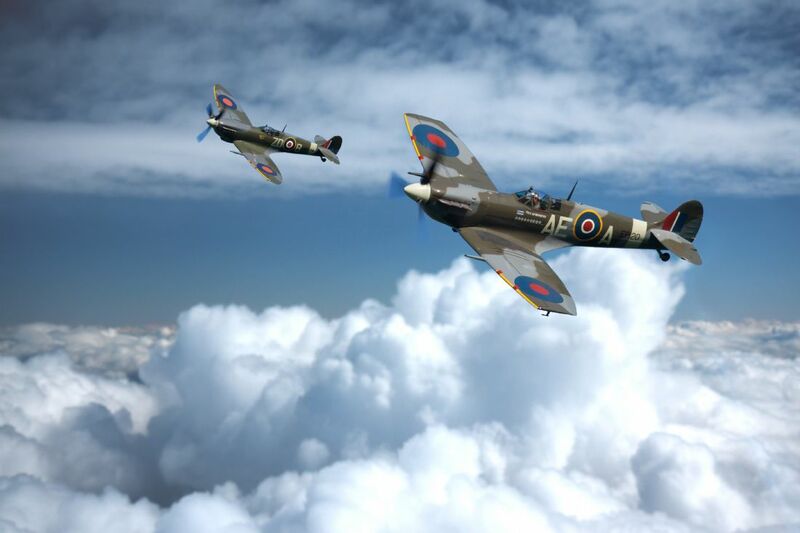 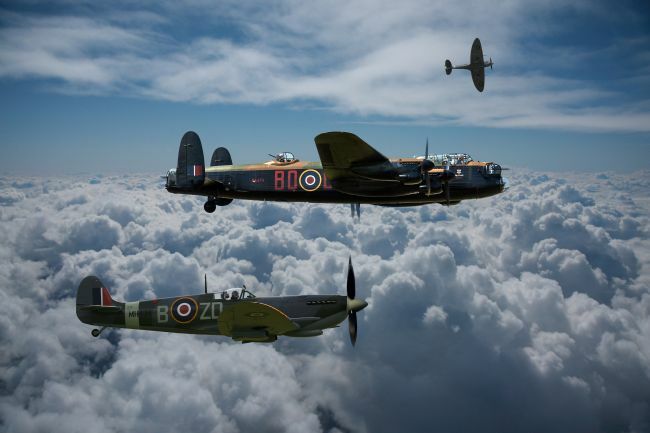 A pair of Spitfire depicted in flight above the cloudscape image created from my Spitfire images over a broken cloud background. 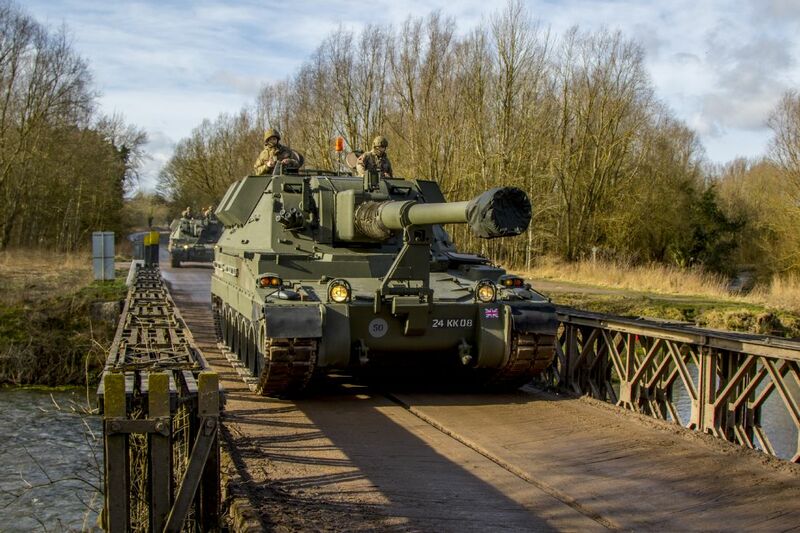 A Vickers shipbuilding and Engineering AS90 Gun Equipment 155 mm L131 crossing a Bailey Bridge on Salisbury Plain, this one was either on it's way to a training exercise or returning from one. 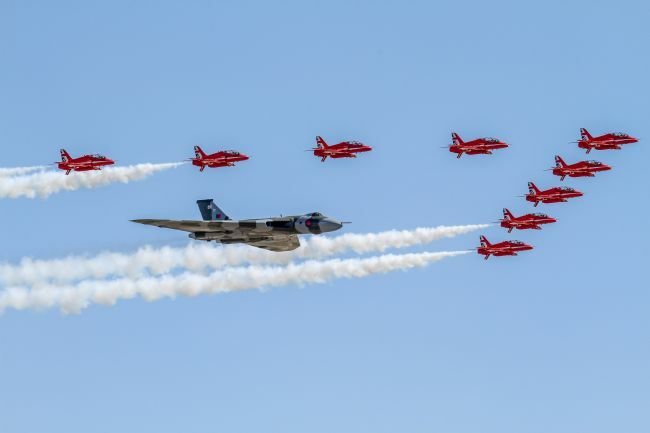 Avro Vulcan Bomber in a Flypast with the Royal Air Force Red Arrows, there have been few opportunities in the Vulcan Bomber XH558 final year of flight to photograph this iconic Avro V bomber with the Red Arrows display team so was very happy to photograph this event. A trio of Spitfires depicted low over the sea during a beautiful sunset in this composite image using my Spitfire images and the background with kind permission. 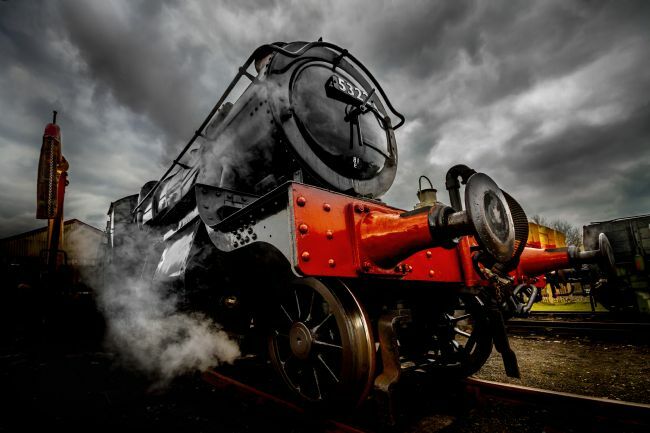 A former Great Western Railway British Railways steam locomotive idling on the track with puffs of steam. 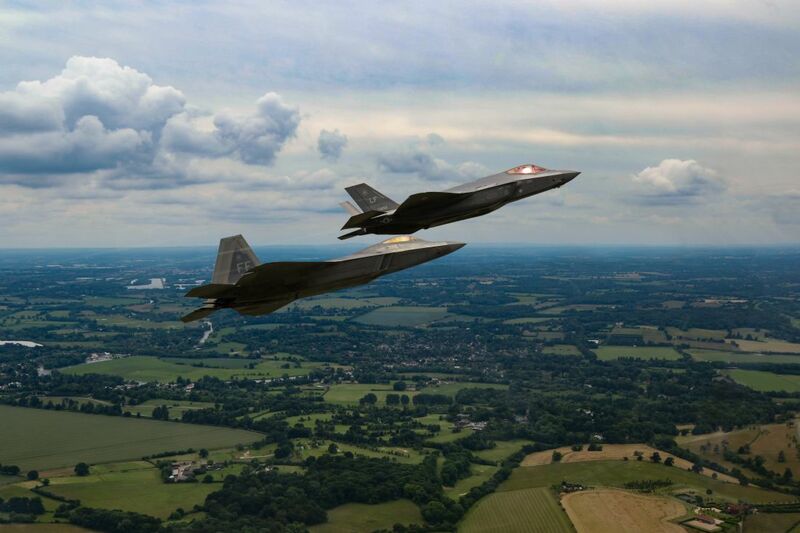 F35 and F22 which appeared as a display pair at RIAT 2016, the jets were edited into a background of a photo I got of the Chilterns from a flight to give the image an air to air of the F22 and F35. 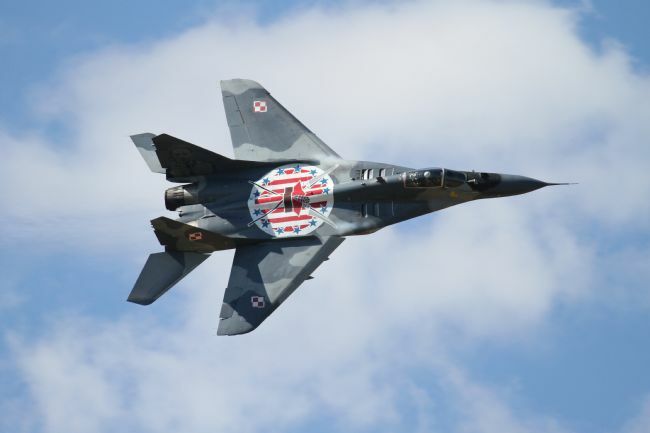 The Mikoyan MiG-29 NATO reporting name Fulcrum is a twin-engine jet fighter aircraft designed and Developed by the Mikoyan design bureau as an air superiority fighter during the 1970s, This example displaying at RIAT 2015 and belonging to the Polish Air Force with a superb emblem on the aircraft upper body with legendary fighter pilots painted on the vertical stabilizers. 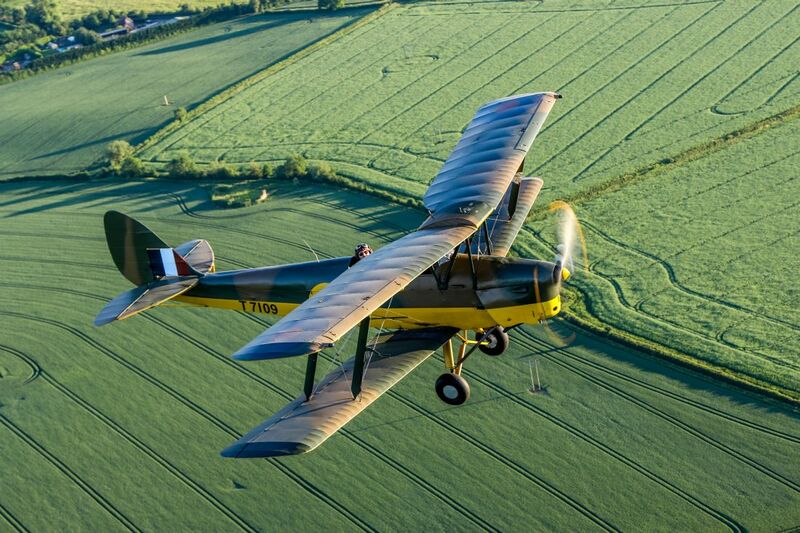 An air to air photograph of a Tiger Moth taken over the countryside near to the Bicester Heritage WW2 airfield where this Tiger Moth is beased. 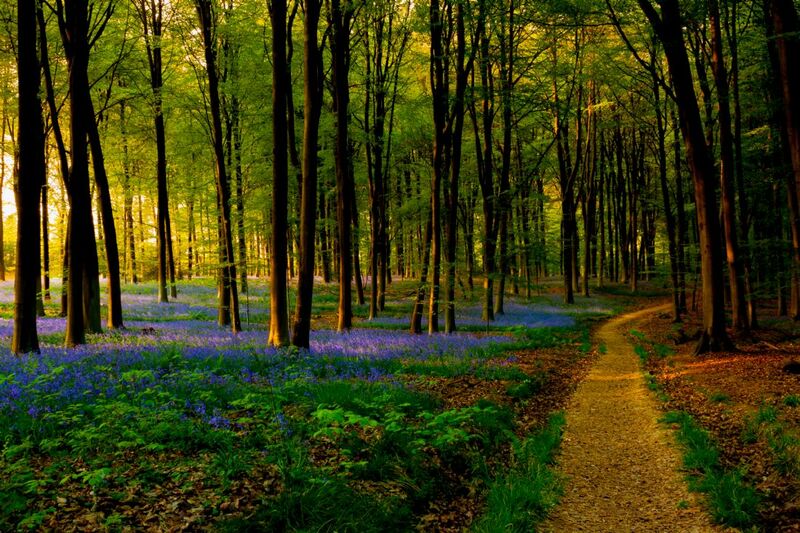 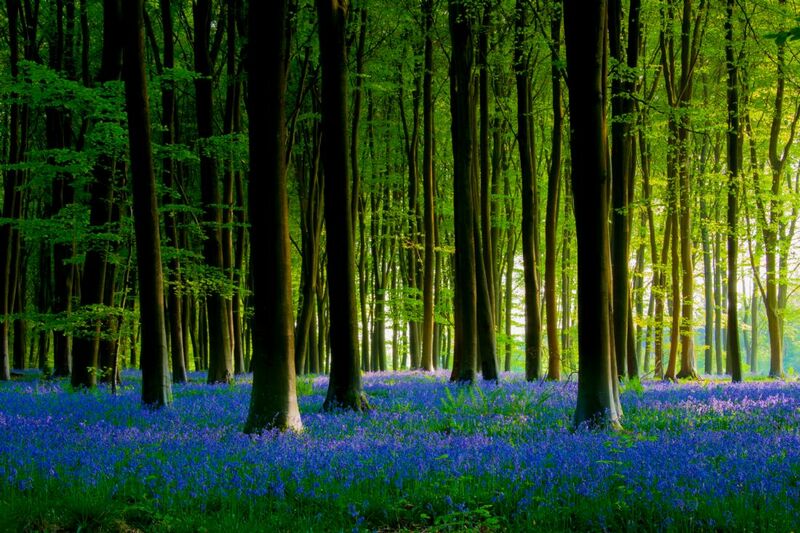 Bluebell wood in Micheldever with a stunning carpet of bluebells against the background of the tree trunks with the Rays of light very lightly accentuated. 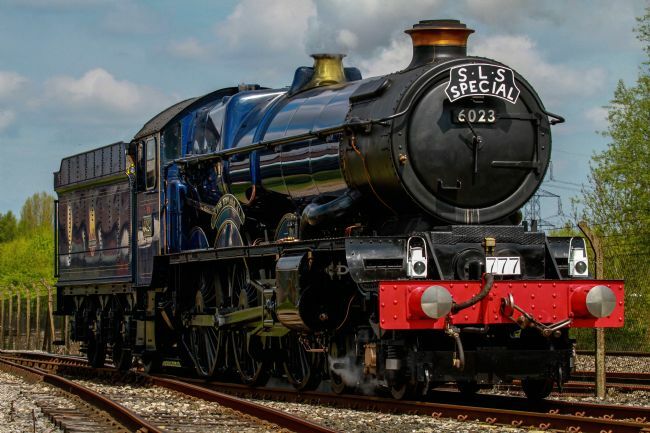 King Edward II Steam Train on a nice slow pass not long after her first time out on the tracks after a full refurbishment. 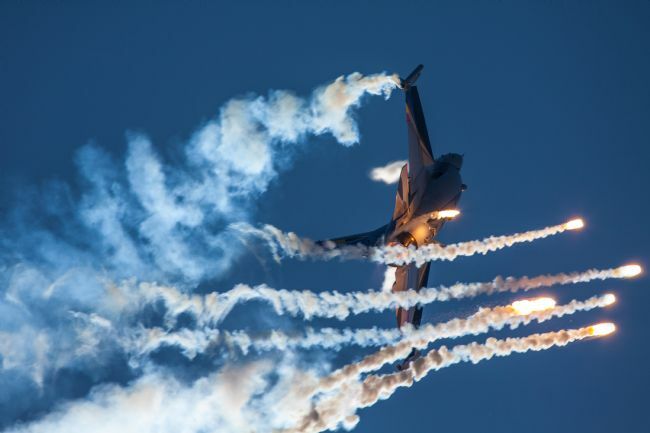 The belgian air force fires of it's flares at the duxford air show, this is the 3rd in the sequence of shots of the F16 of the Belgian air component firing its flares at Duxford as the F16 pulled a high G manoeuvre into the vertical. 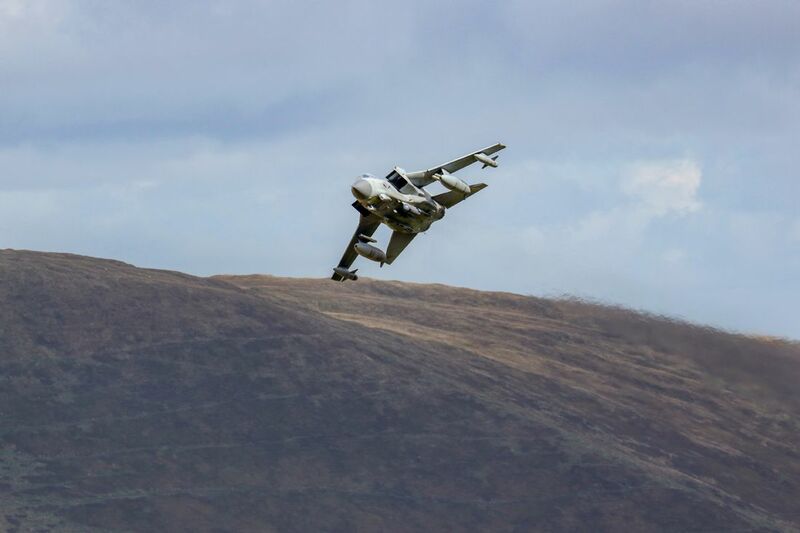 BAE Systems Harrier GR9 Jump Jet ZD437 powers through the Mach loop in Wales on a low level training sortie. 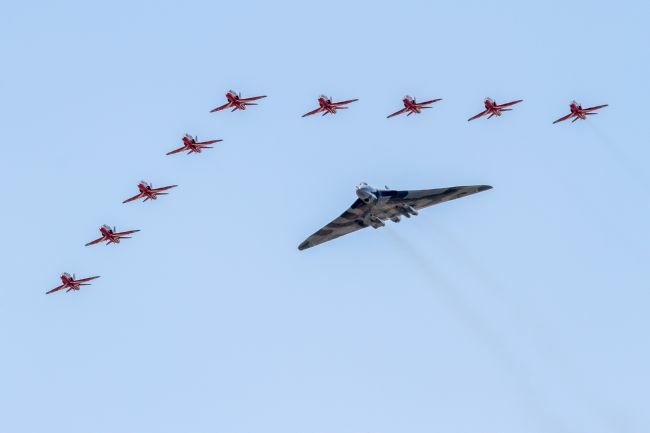 The Avro Vulcan Bomber in a Flypast with the Royal Air Force Red Arrows, there have been few opportunities in the Vulcan Bomber XH558 final year of flight to photograph this iconic Avro V bomber with the Red Arrows display team so was very happy to photograph this event. In the upper part of the picture is the spare jet carrying a photographer of the Royal Air Force. 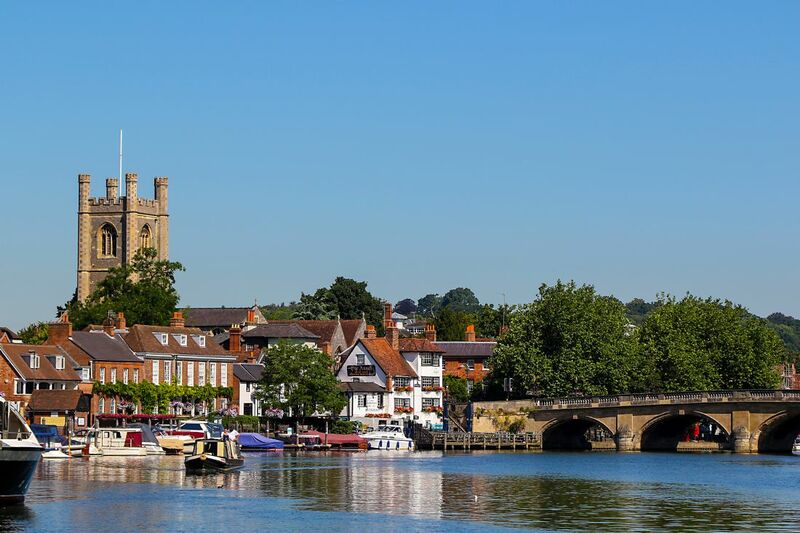 The picturesque town of Henley on Thames famed for its annual Henley Royal Regatta, with Henley Church, the Angel on the Bridge and the Henley Bridge on a lovely summers day. 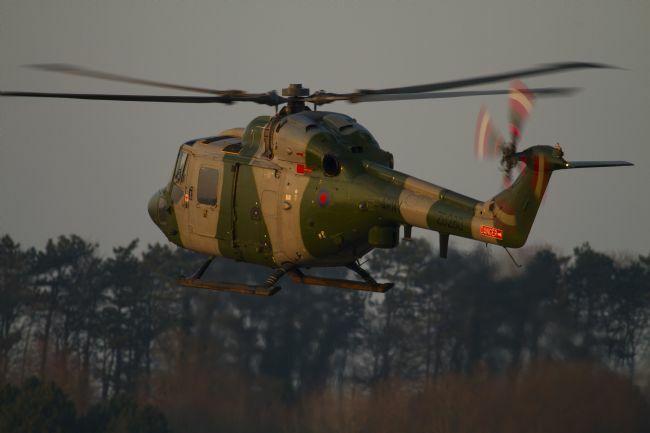 An Army Air corps Lynx AH7 during the late evening as the sun was setting on Salisbury Plain, the Army Air corps Lynx AH7 has since retired from service as have other marks of this workhorse helicopter and the Lynx still holds the speed record for a rotor. 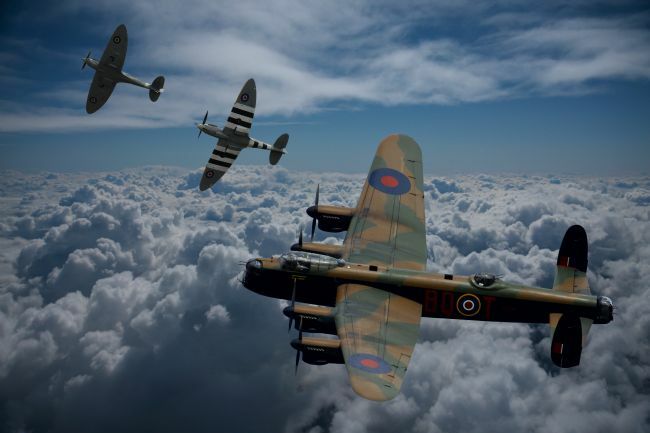 Two Spitfires breaking away from a Lancaster Bomber in this depiction of a low flight across the South Oxfordshire countryside, this digital montage contains my Spitfire shots lancaster bomber and a poppy field. 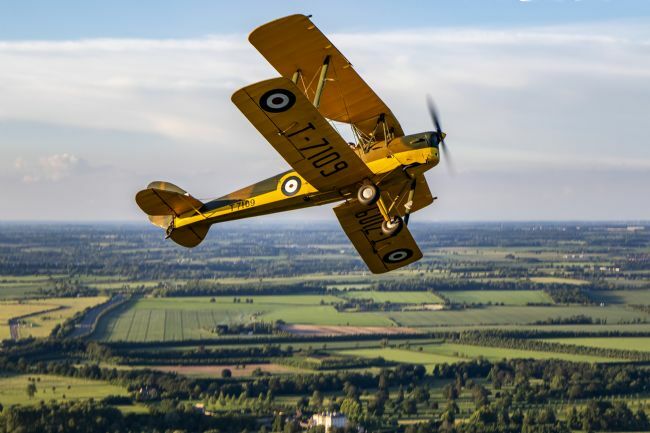 A DeHavilland Tiger Moth breaks away from a formation flight over Oxfordshire, this particular model G-AOIM India Mike was used as an elementary basic trainer during World War 2 and was built at Morris Motors in Cowley. 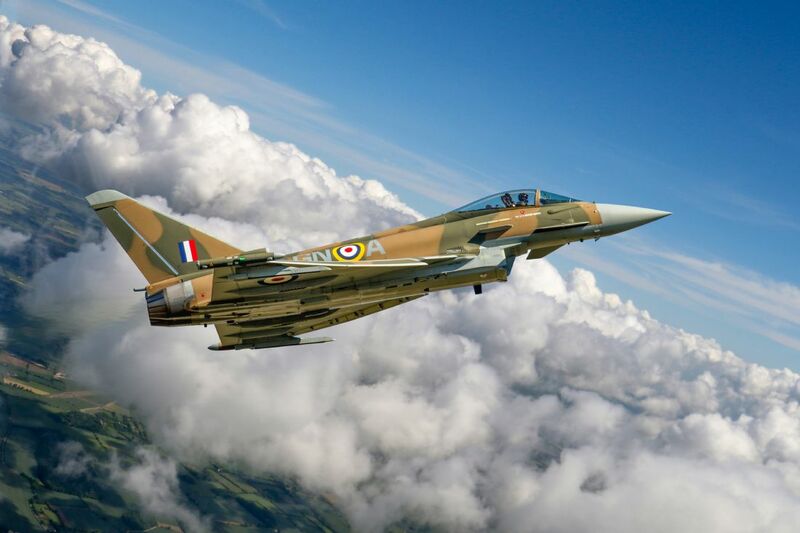 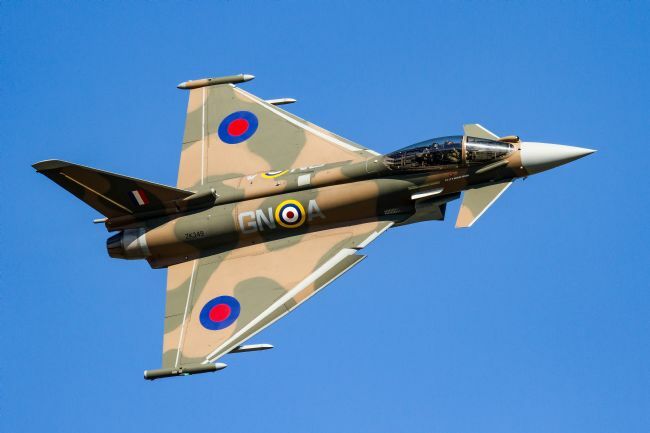 The Battle of Britain Eurofighter Typhoon displays at Royal International Air Tattoo 2015, here the Typhoon photographed on its own but it was displaying with the BoB Spitfire from RAF Coningsby in Lincolnshire. 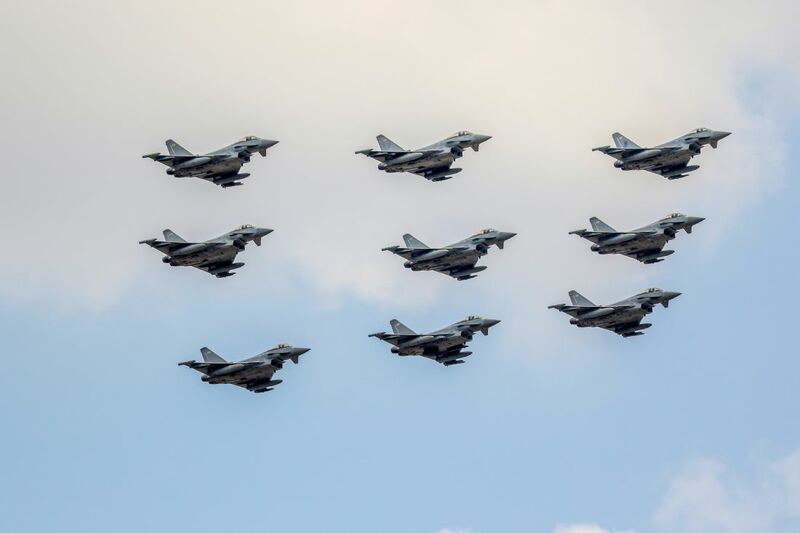 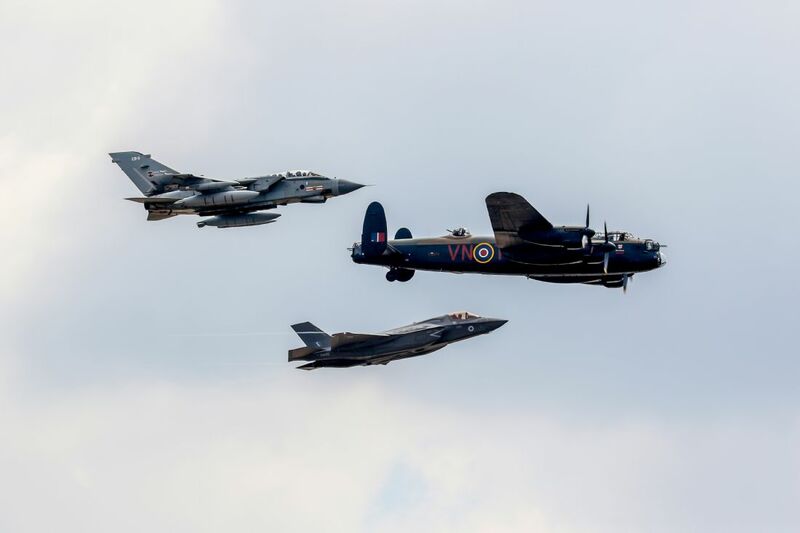 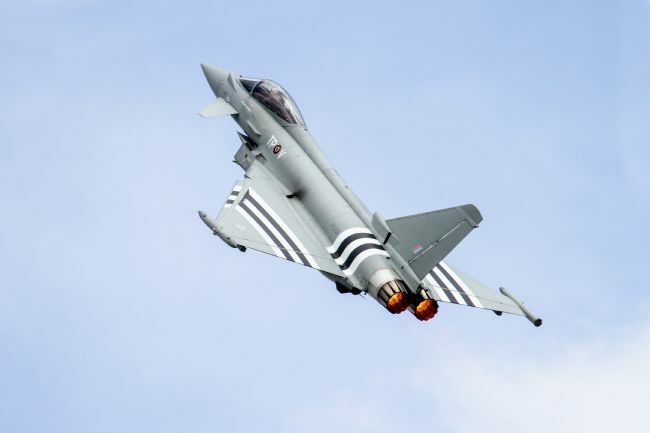 A Typhoon 9 ship flypast took place at RIAT 2018 to mark the RAF 100 celebrations, this was just one of the many special events organised to mark the Centenary celabrations of the RAF 100 years of service. 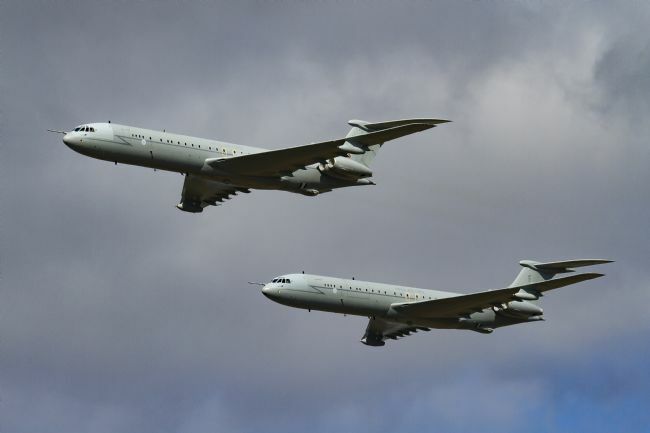 A pair of Vickers VC10 refuelling aircraft from the Royal Air Force in a formation flypast their base at Brize Norton for the final time on the official day of their retirement from service. 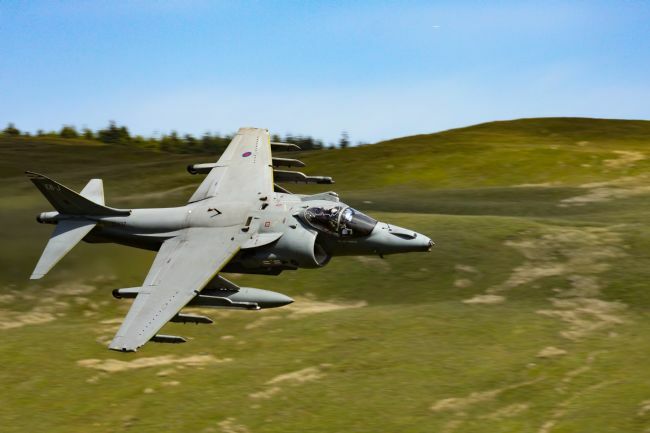 A Harrier GR9 jump jet on a low level training sortie in the hills of Wales just before the Harrier were all retired from service. 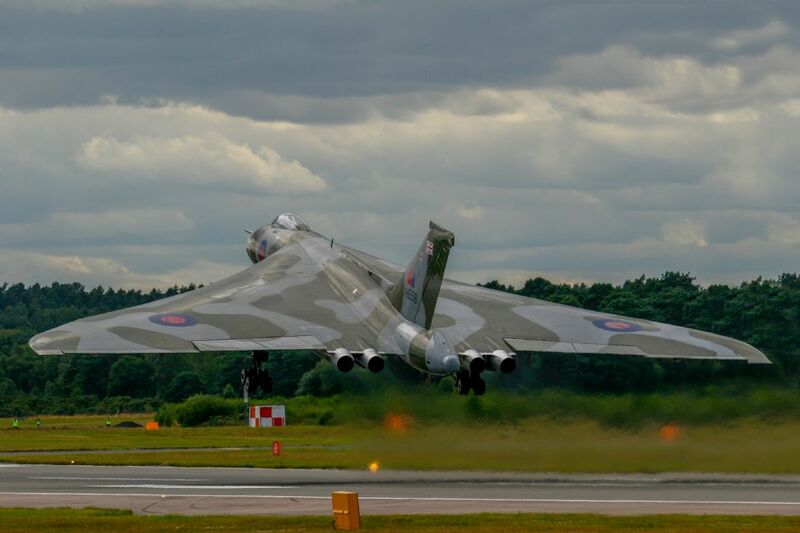 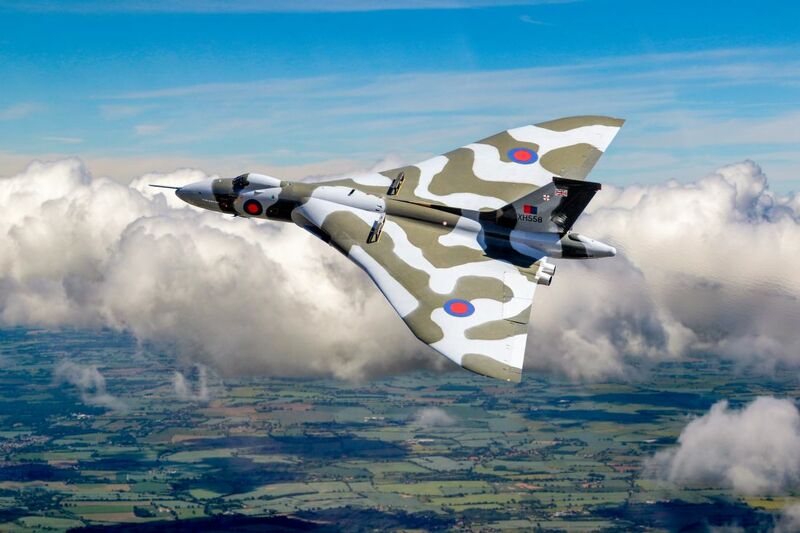 Avro Vulcan Bomber XH558 takes off from RIAT 2015 and the pilot immediately banks the aircraft hard to the right as the start to an exceptional display, the crew won the 'As the crow flies' trophy for best overall flying demonstration. 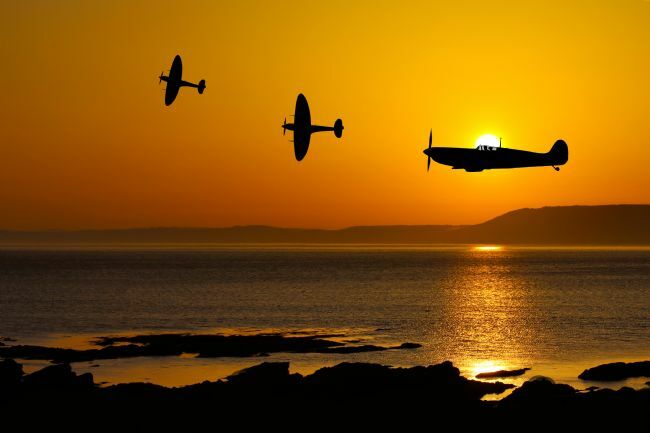 The commentators at the shows mirror the public sentiments saying don't cry because it's over, smile because it happened. 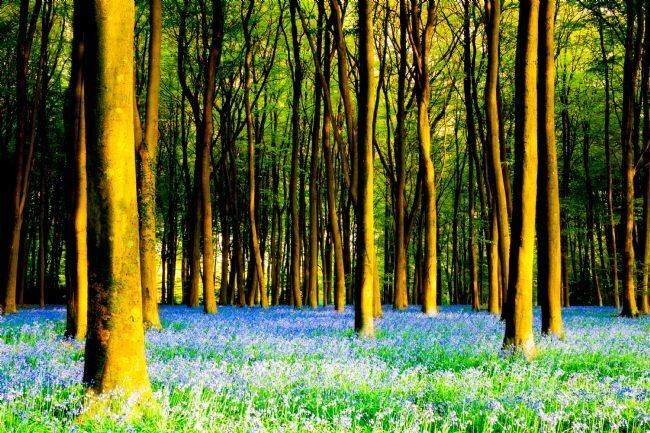 A quote from Dr Zeus. 2 Douglas DC3 Dakota`s in formation at IWM Duxford autumn air show, the DC3 Dakota is also known as the C47 skytrain, this particular pair have the D Day invasion markings. 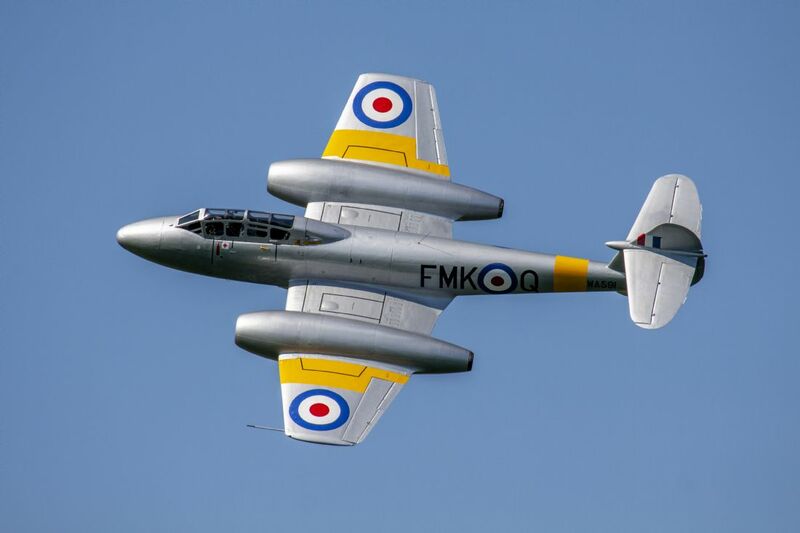 Gloster Meteor T7 WA591 at Duxford Jubilee Air Show 2012. 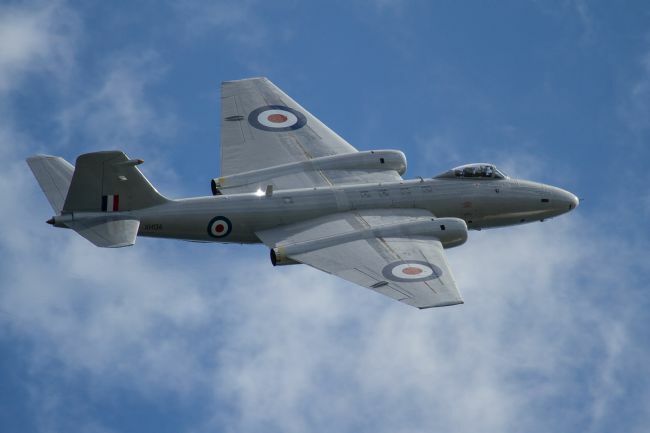 The Gloster Meteor was the first British jet fighter and the Allies first operational jet. Although the German Messerschmitt Me 262 was the worlds first operational jet, the Meteor was the first production jet as it entered production a few months before the Me 262. 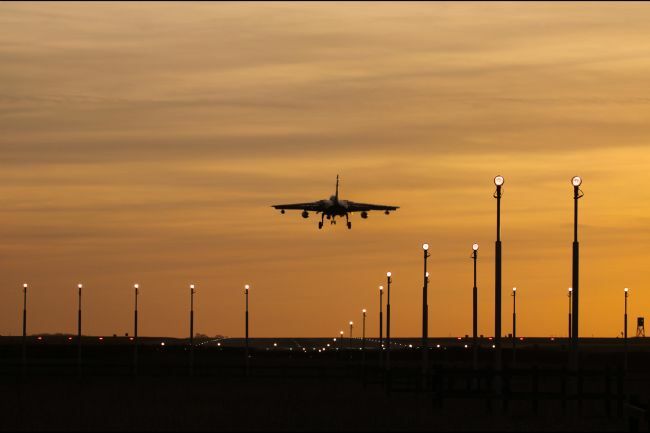 The Meteors development was heavily reliant on its ground-breaking turbojet engines, developed by Sir Frank Whittle and his company, Power Jets Ltd.
Panavia Tornado GR4 monster flight performing a touch and go during sunset at RAF Marham. 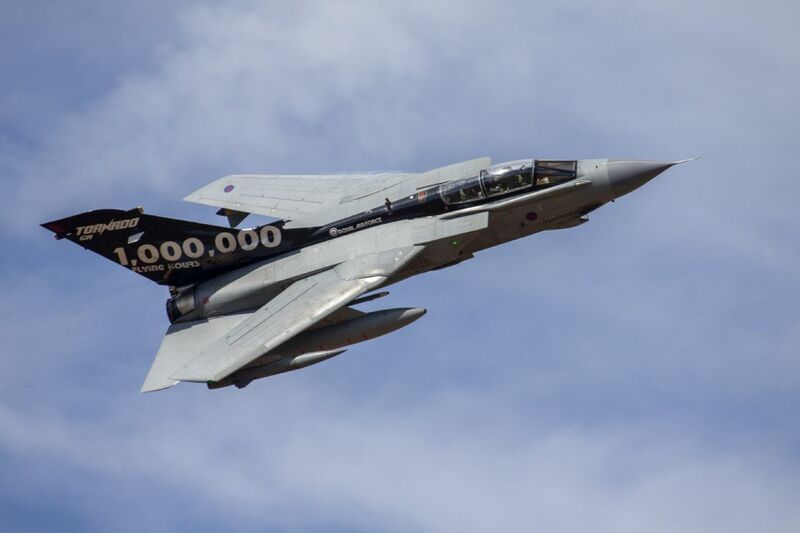 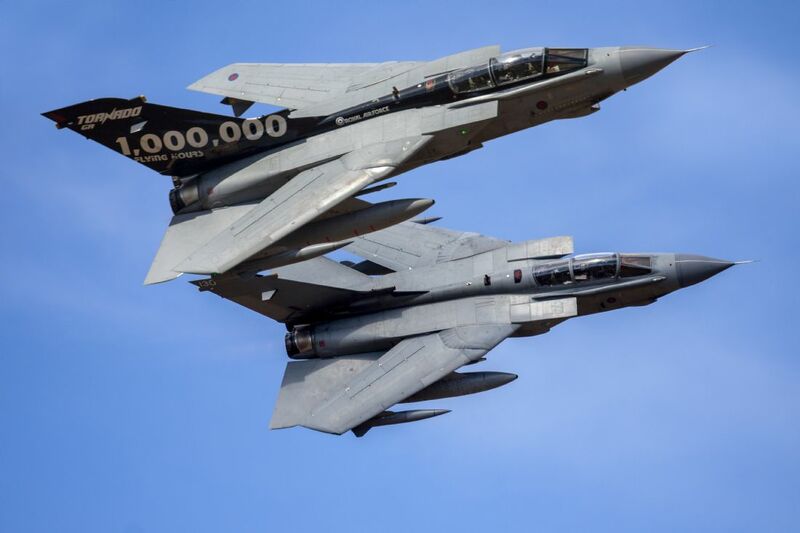 The Tornado GR4 is soon to be retired from RAF sevice. 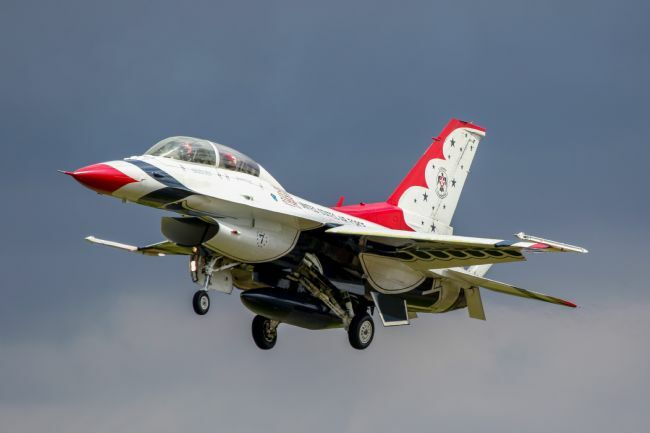 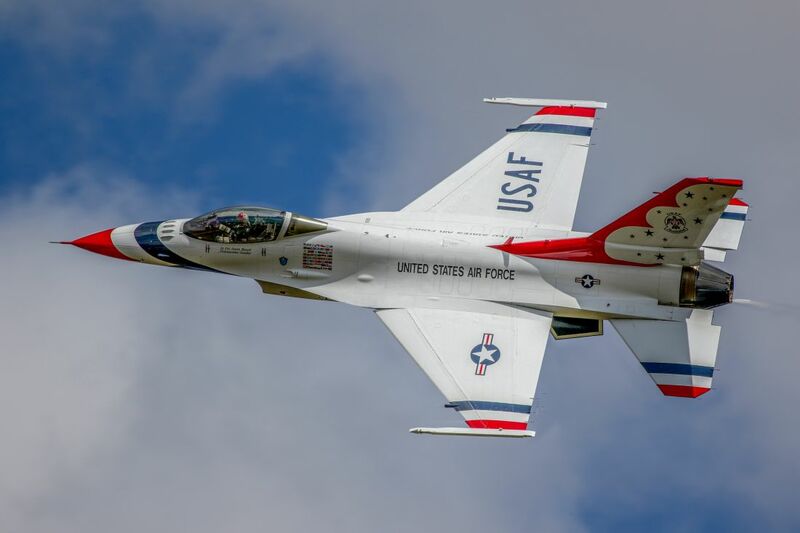 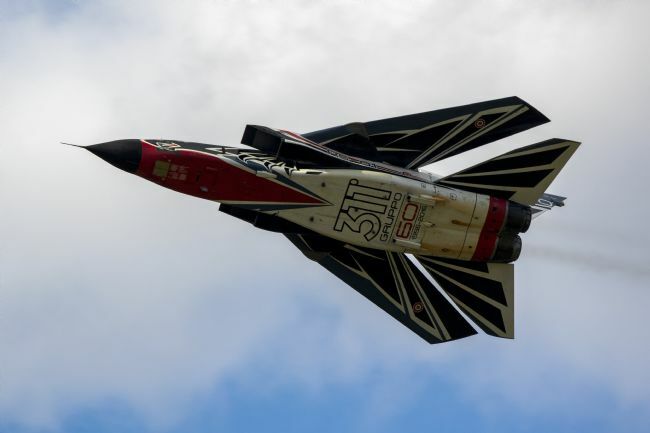 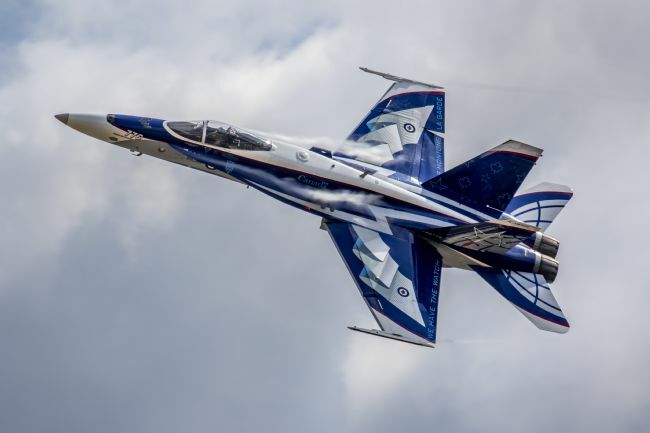 A United States Air Force F16 of the Thunderbirds display Team At RIAT 2017, the passenger for this ride was Tom Fletcher formerly of MvFly and now an author. 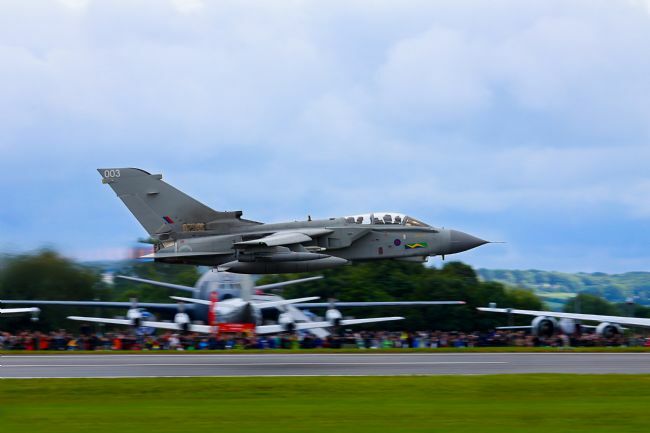 311 Gruppo Tornado GR4 of the Italian Air Force with wings swept to 67 degrees in a pass at RIAT air show at Fairford in Gloucestershire. 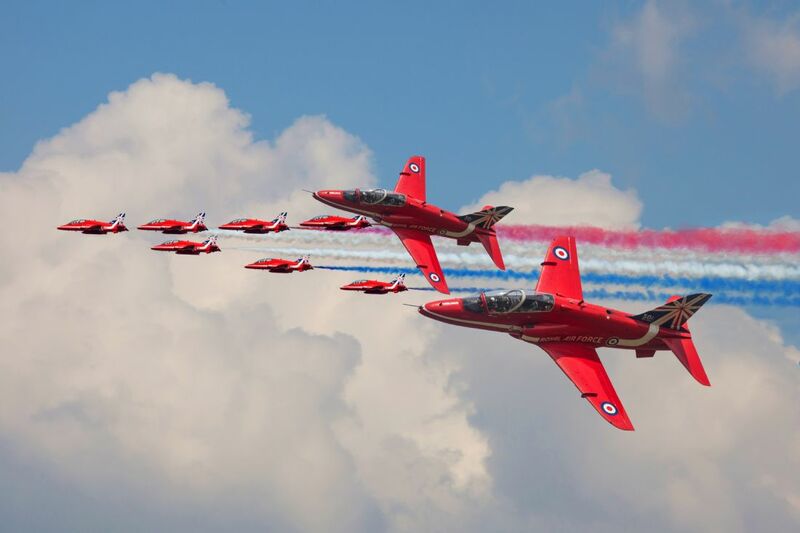 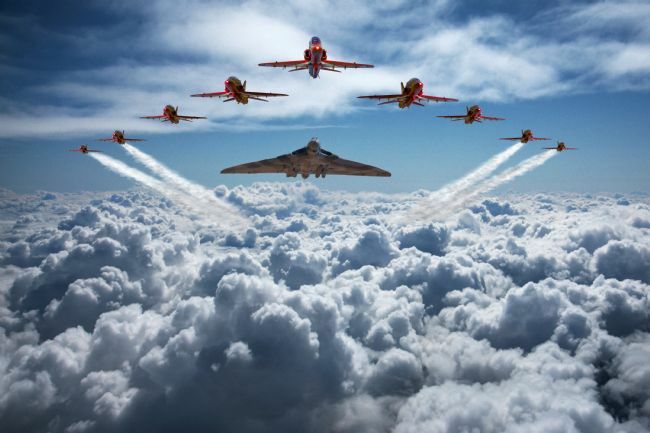 2014, the year of the RAF Red Arrows 50th anniversary would see capacity crowds welcome the display team to rapturous applause at each of the venues I attended, this image a combination from RAF Benson families day and Duxford. 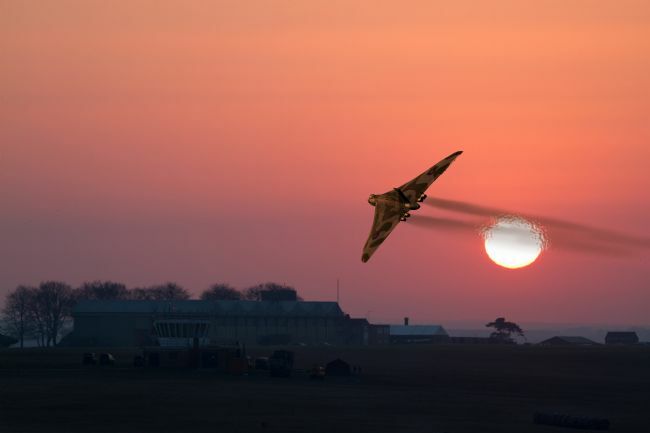 The iconic Avro Vulcan Bomber XH558 flying low and fast past the setting sun and about to buzz the control tower of an old airfield, the heat from the Vulcan bomber exhaust distorting the sun. Composite image from my photos. 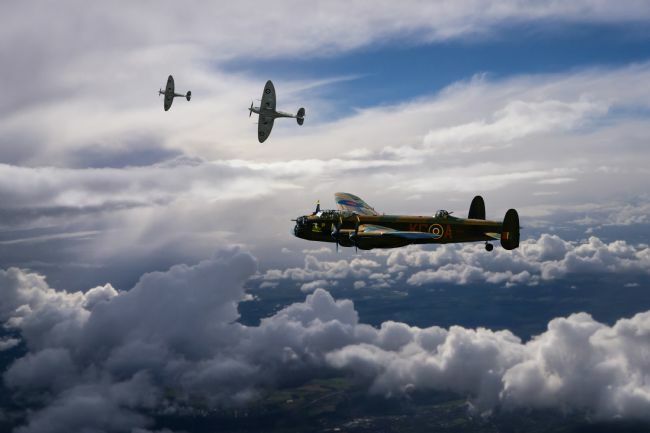 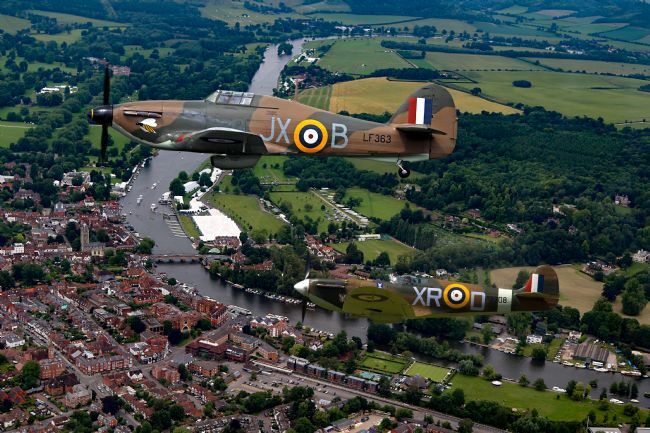 Two Spitfires banking away from an Avro Lancaster Bomber Thumper Mk3 City of Lincoln. 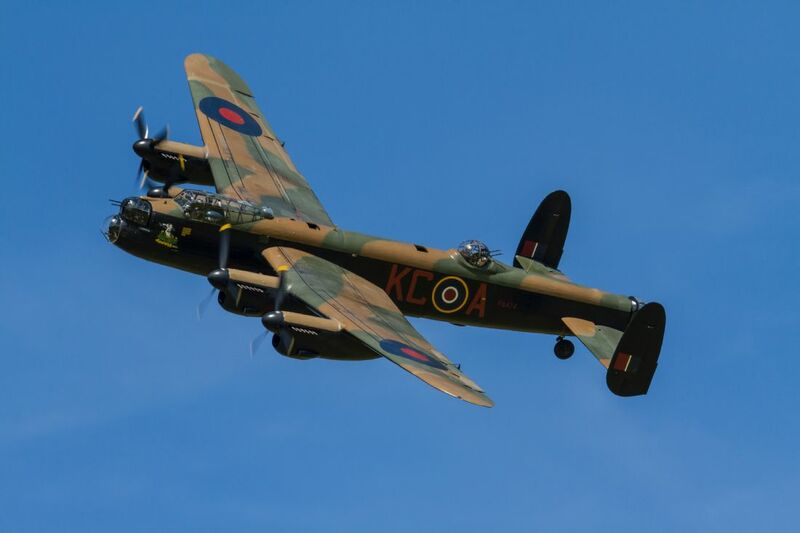 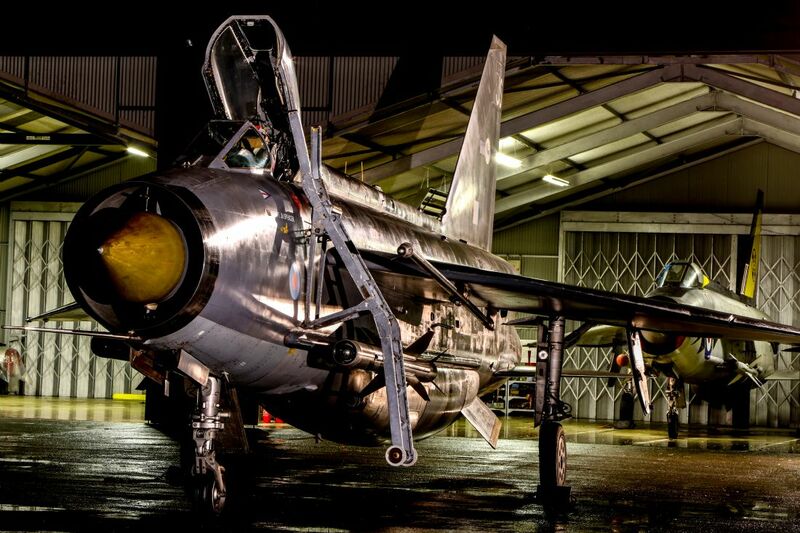 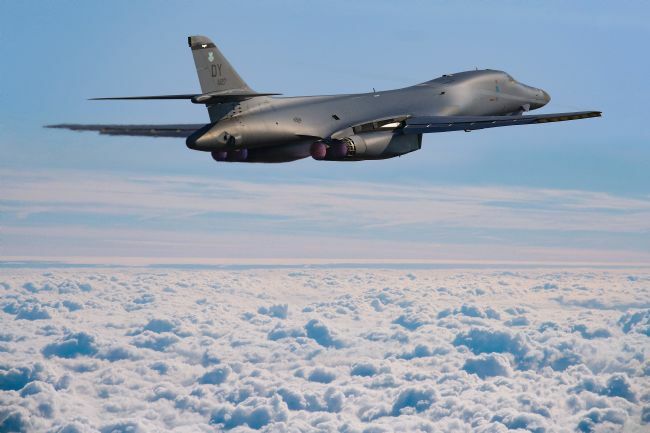 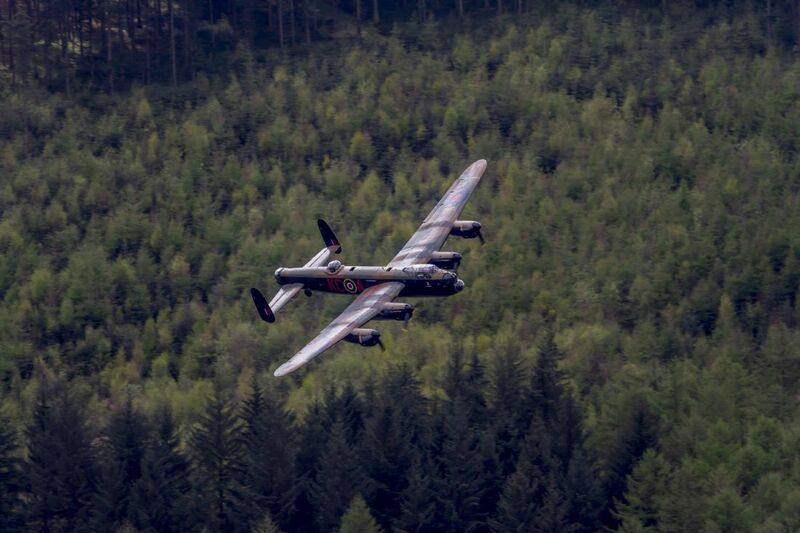 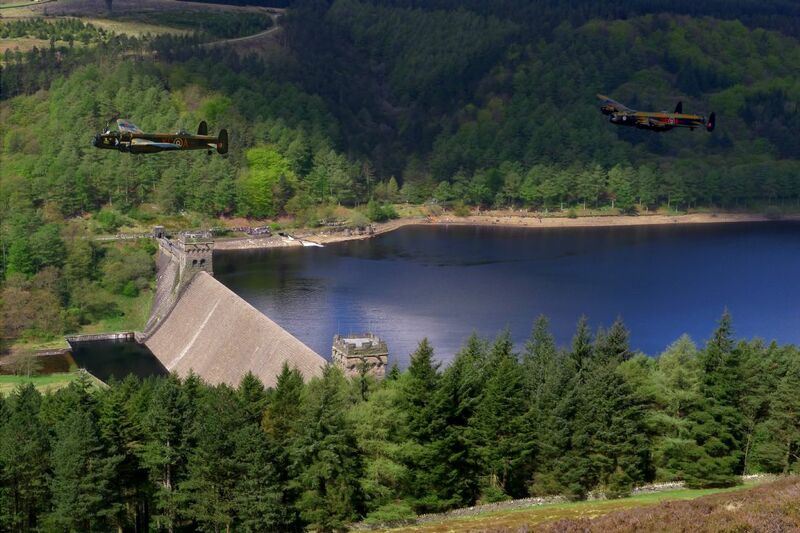 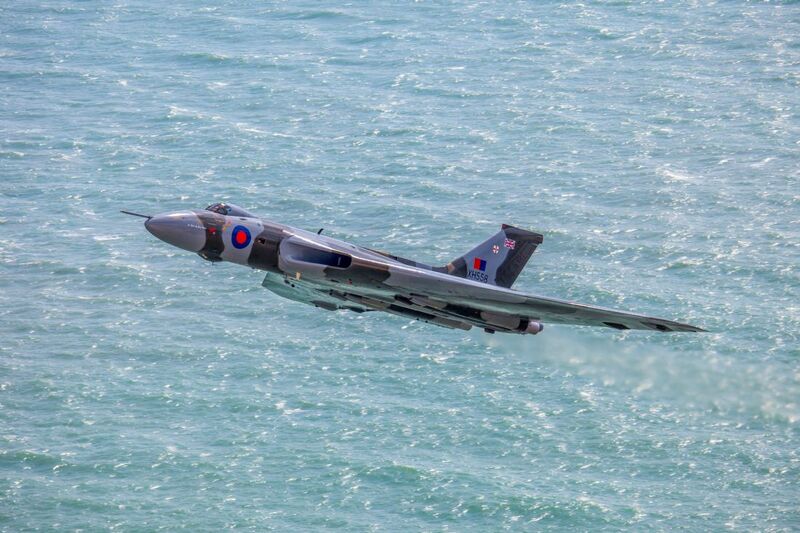 Created using my own aircraft photos, backgorund kind permission PH Images. A very close pass from a Royal Navy Sea King climbing out after the Air Sea Rescue demonstration with Exmouth RNLI at Dawlish Air Show 2014, the Sea King is soon to be retired from service. 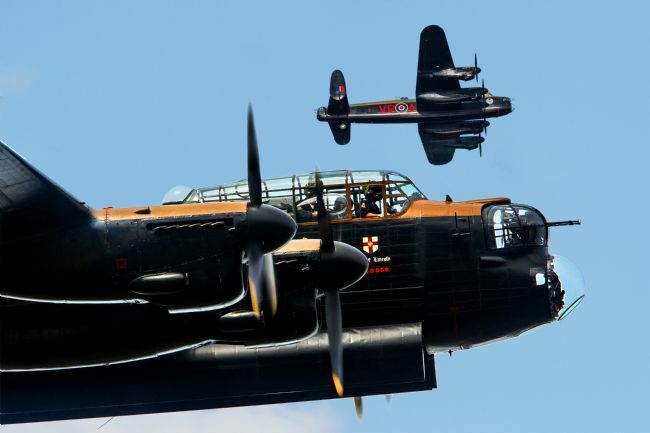 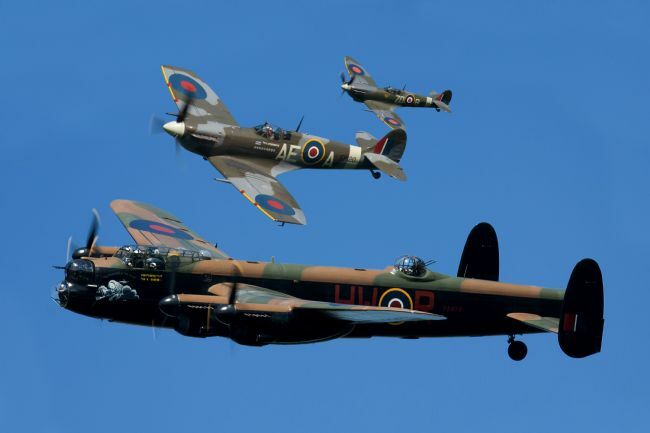 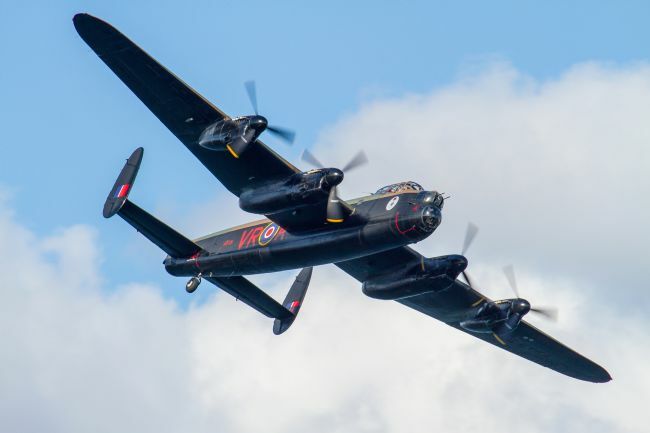 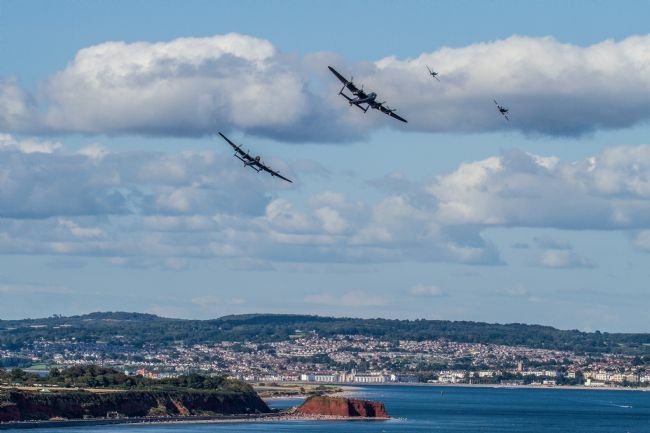 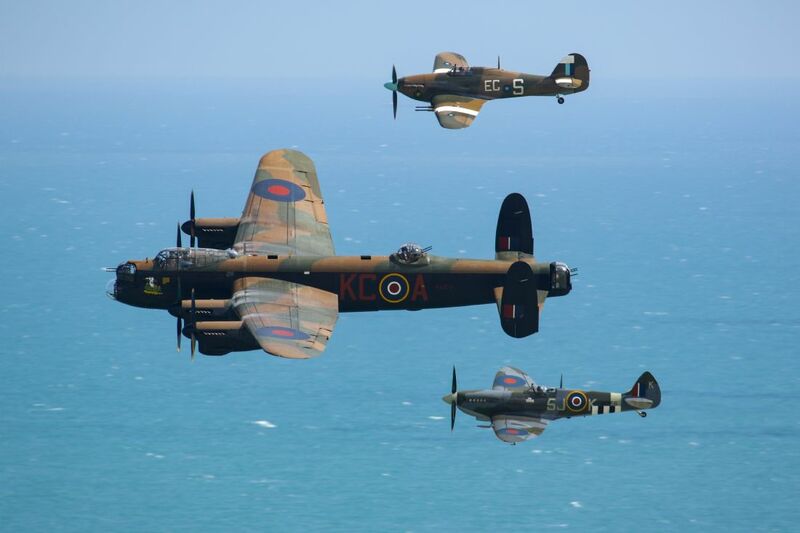 Lancaster Bombers Thumper Mk3 and Vera over Dawlish air show 2014, Vera accompanying the Lancaster bomber of the RAF BBMF with the BBMF Spitfire and Hurricane rejoining the formation. 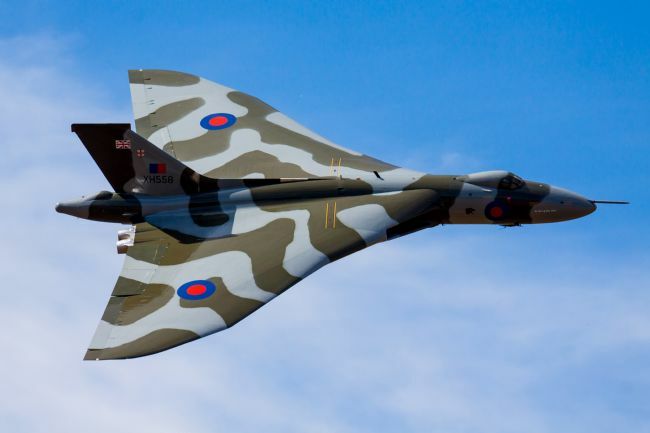 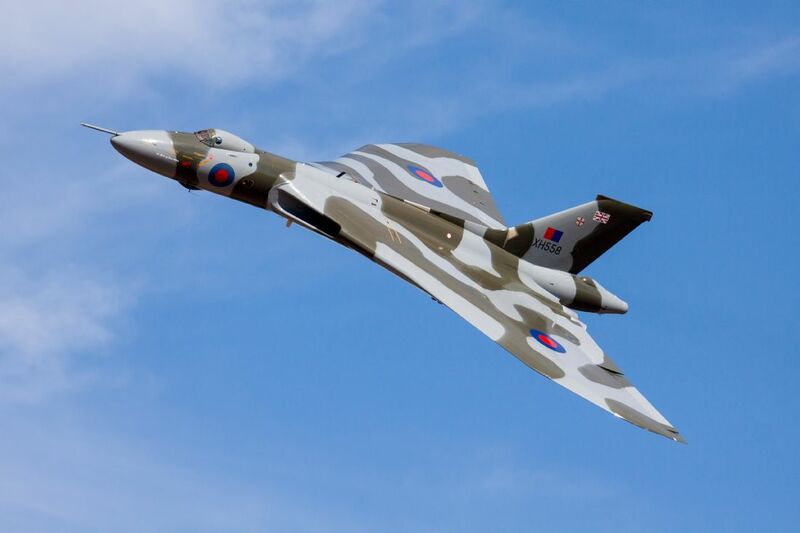 The majestic sight and sound of the mighty Vulcan Bomber XH558 impresses the crowd at RIAT with a display of manoeuvrability and noise from the four Olympus engines. 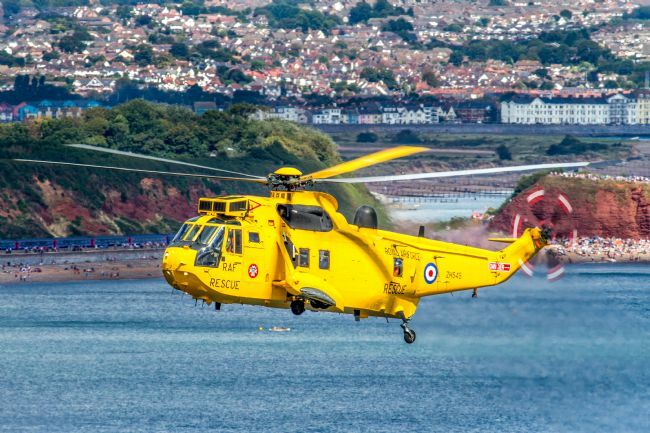 The Westland Sea King HAR3A ZH545 based at 22Sqn Chivenor, the RAF Sea King also nicknamed Budgie presumably due to it's distinctive highly visible yellow paint scheme and one blade was painted in matching colour to make the rotor visible as the primary operating area for the SAR Sea King is low level in and around coastline and cliffs it aids vision from above. 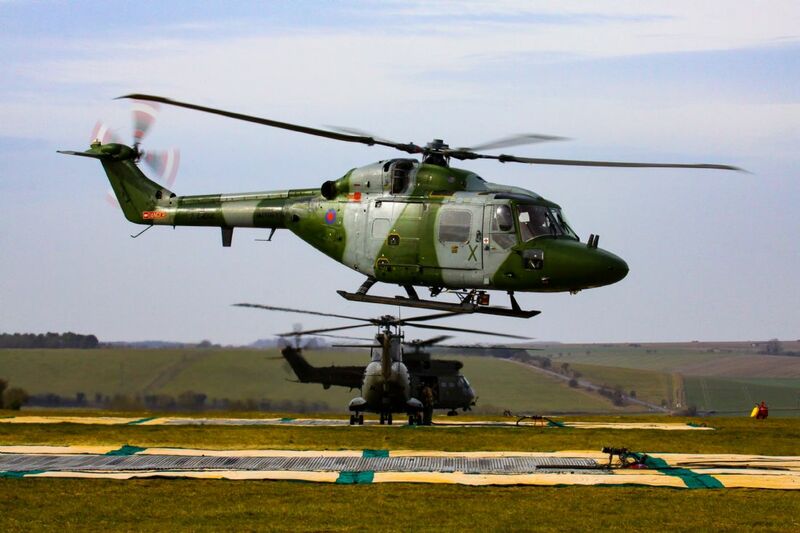 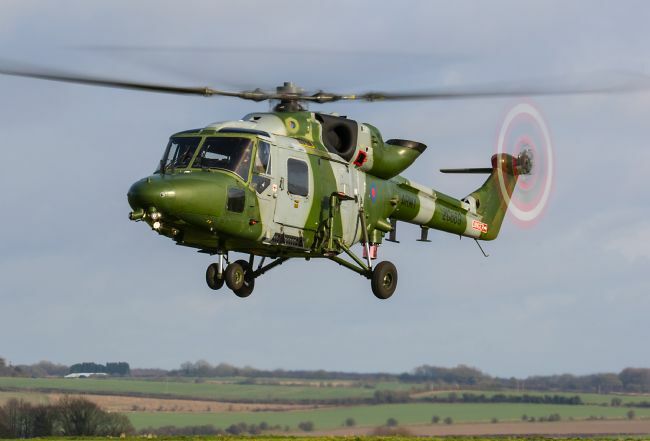 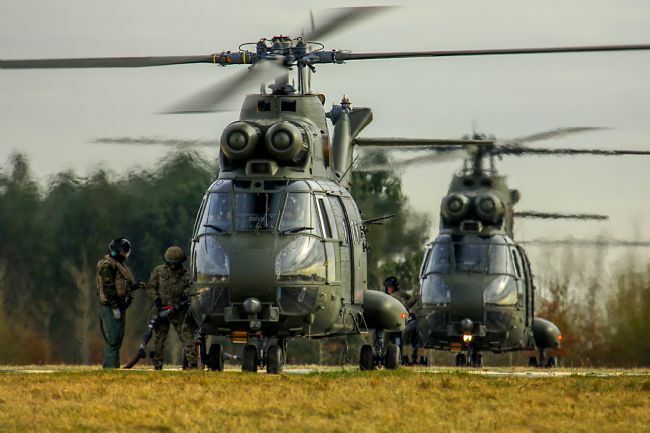 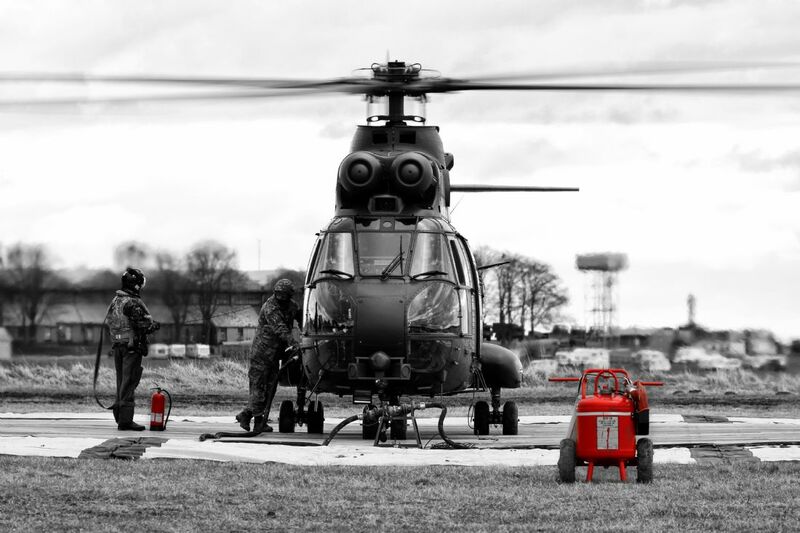 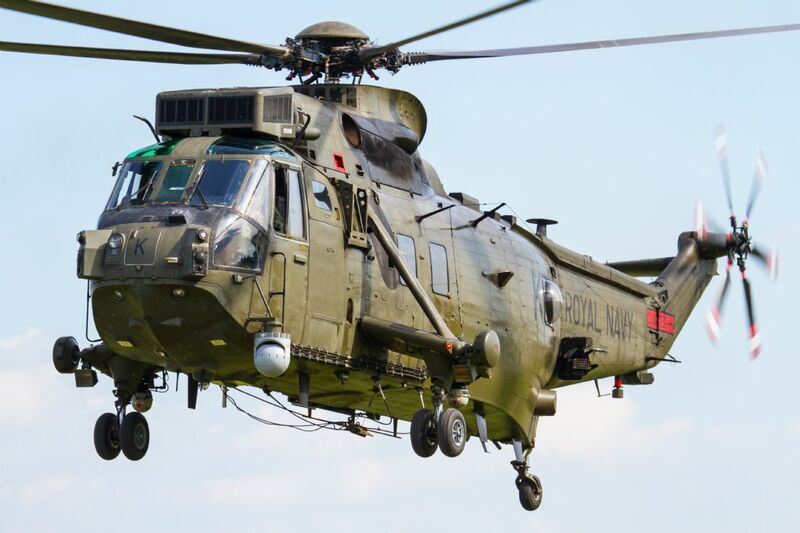 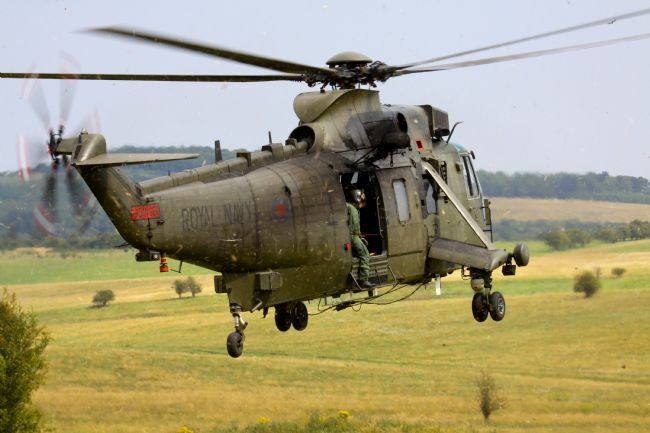 An Army Air Corps Lynx Mk9 on a training flight in Salisbury Plain in Wiltshire, a slow shutter speed was used to accentuate blur on the props and rotor. 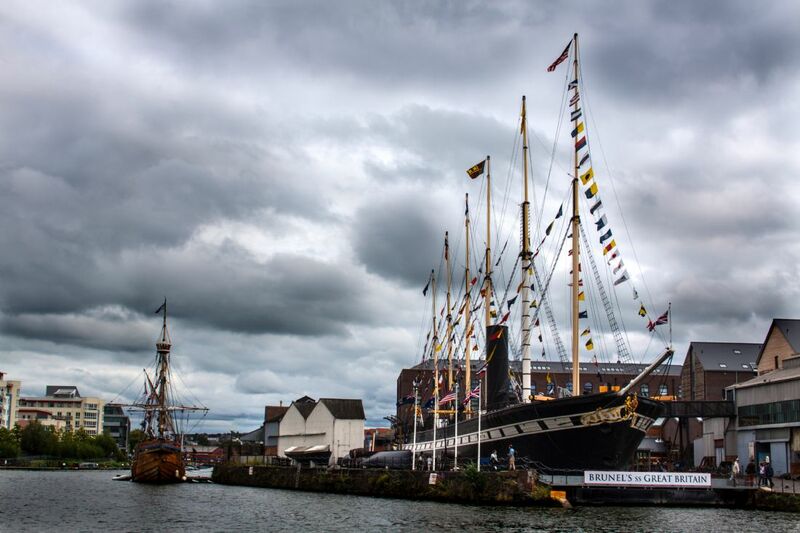 The steam sail ship SS great Britain in Bristol, built by brunel, the SS Great Britain is regard as one the most historically important ships in the world. 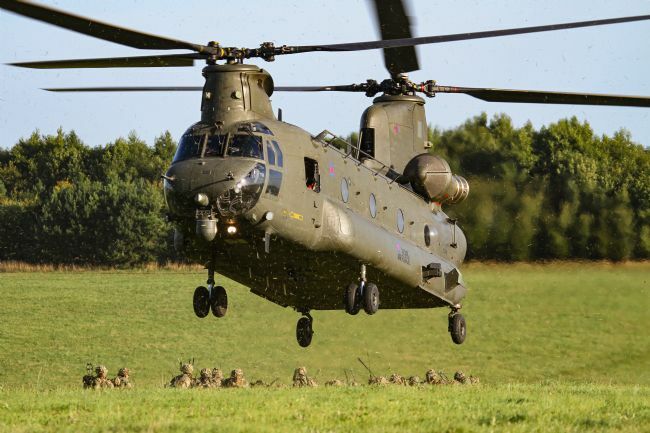 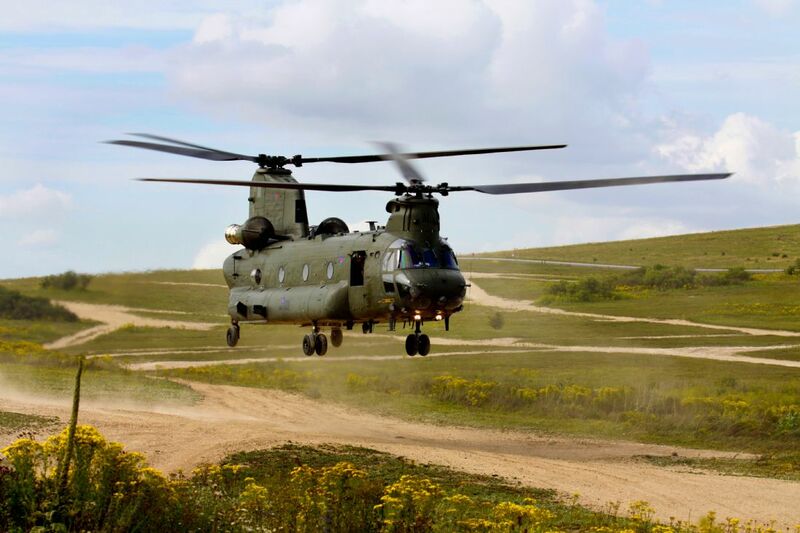 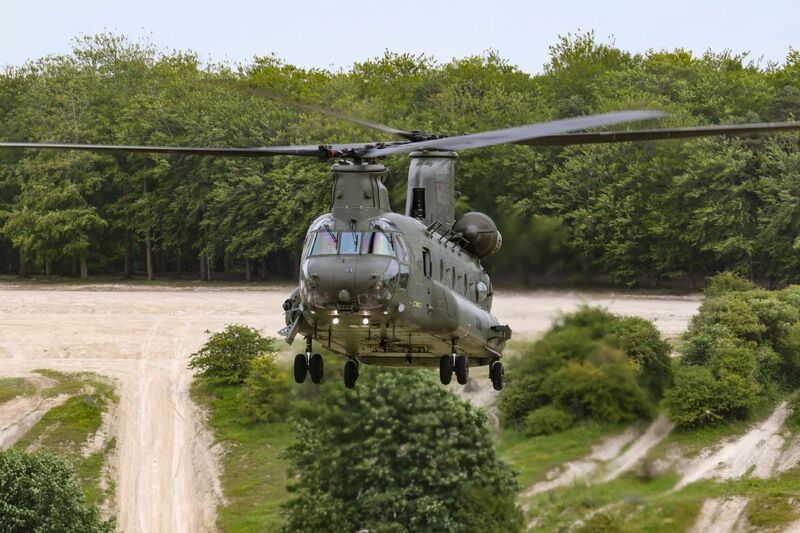 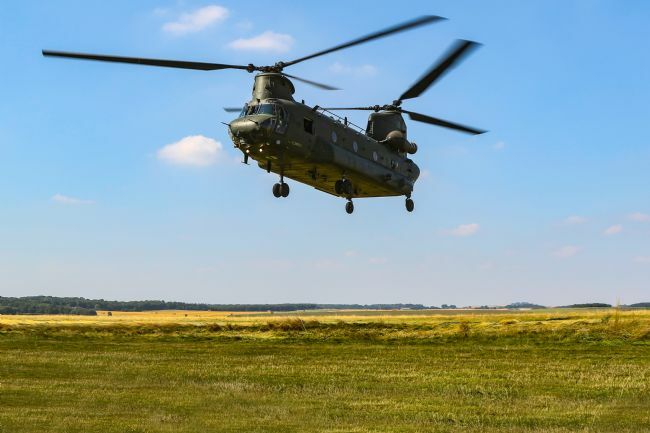 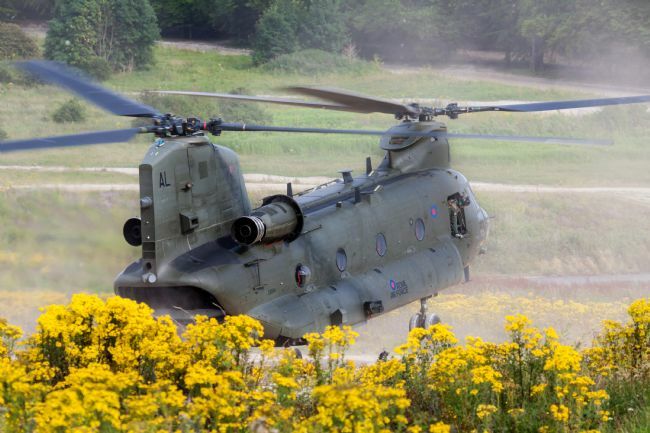 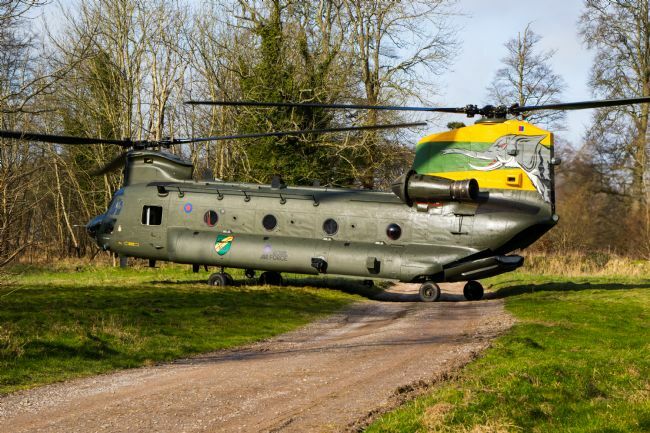 A 27 Squadron Chinook tandem rotor helicopter on Salisbury Plain in a woodland area, this chinook sporting a special tail and is affectionately called Nelly by photographers. 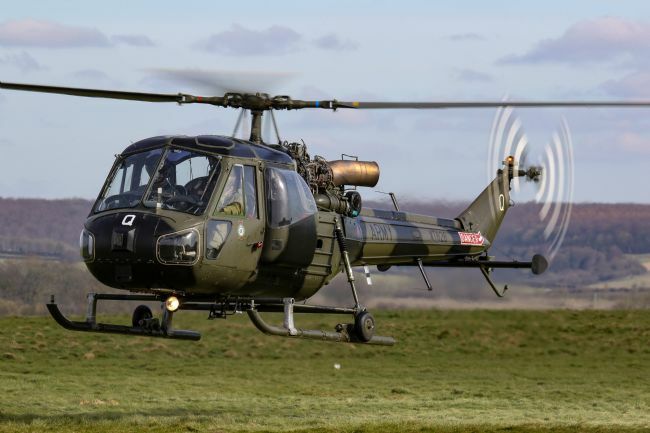 The Westland Whirlwind HAR10 helicopter was a British licence-built version of the U.S. Sikorsky S-55/H-19 Chickasaw. 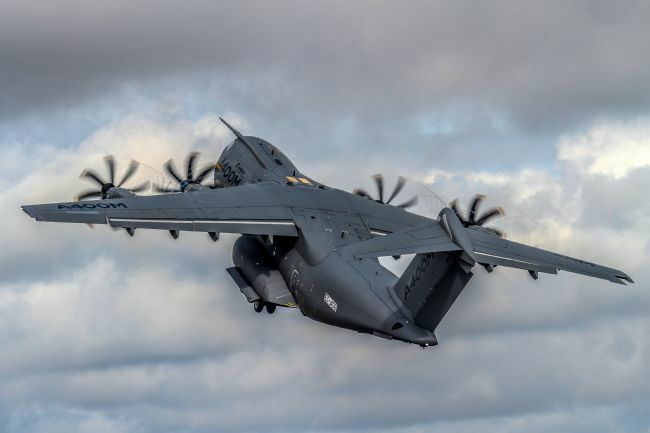 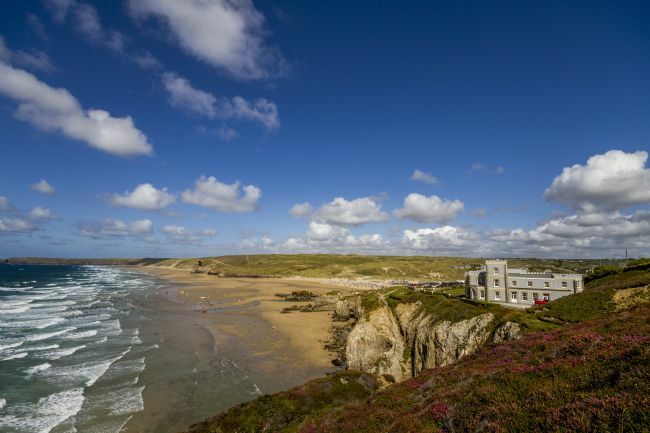 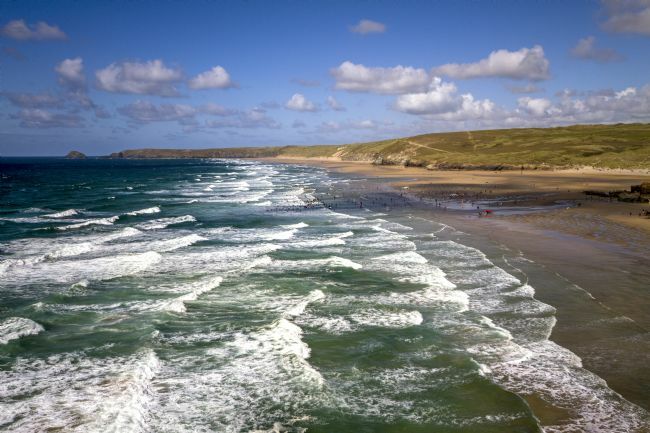 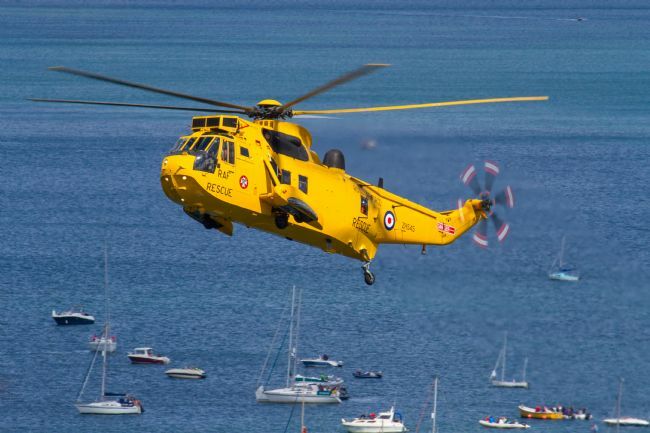 It primarily served with the Royal Navy's Fleet Air Arm in anti-submarine and search and rescue roles. 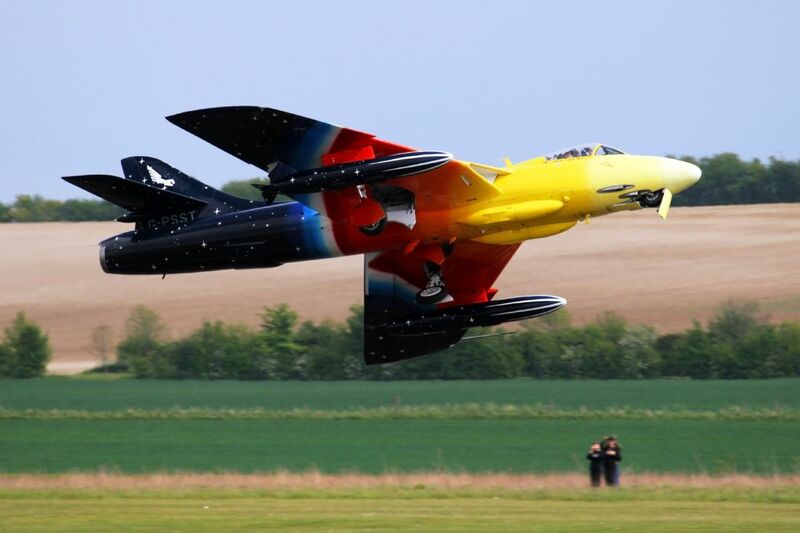 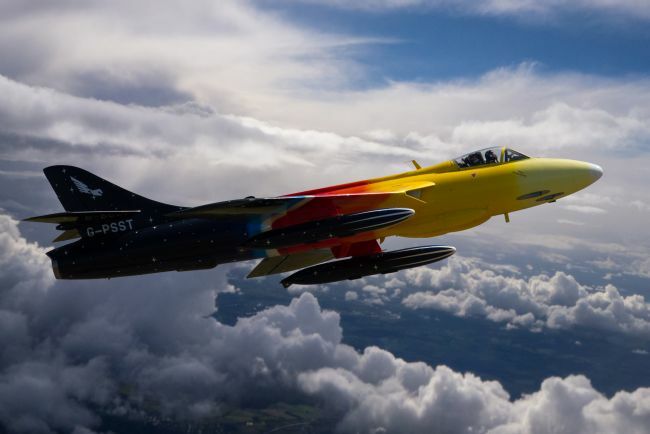 This example being serial number XJ729 formerly RAF SAR photographed near Dawlish air show 2014. 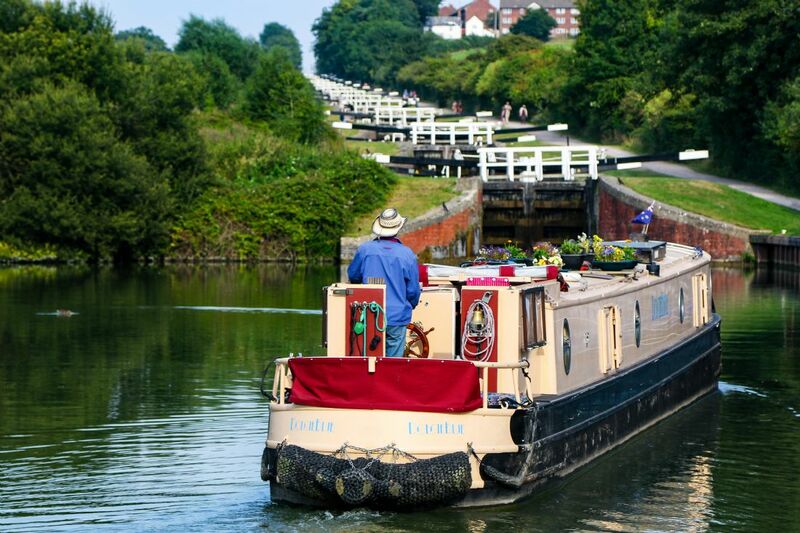 Caen hill Locks with a Narrowboat approaching the Locks, the Caen Hill Locks are a series of 29 Locks running uphill or downhill depending on your direction of trave, I'm told it can take in excess of 5-6 hours to navigate this stretch of the Kennet and Avon canal. 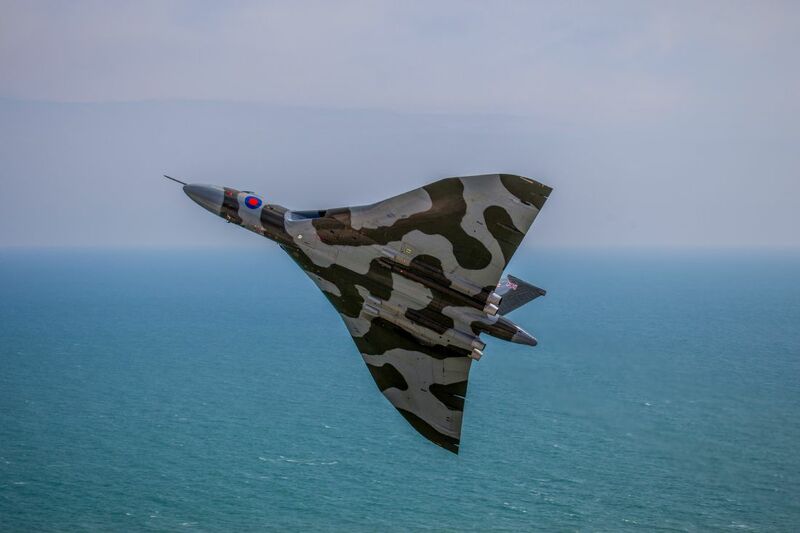 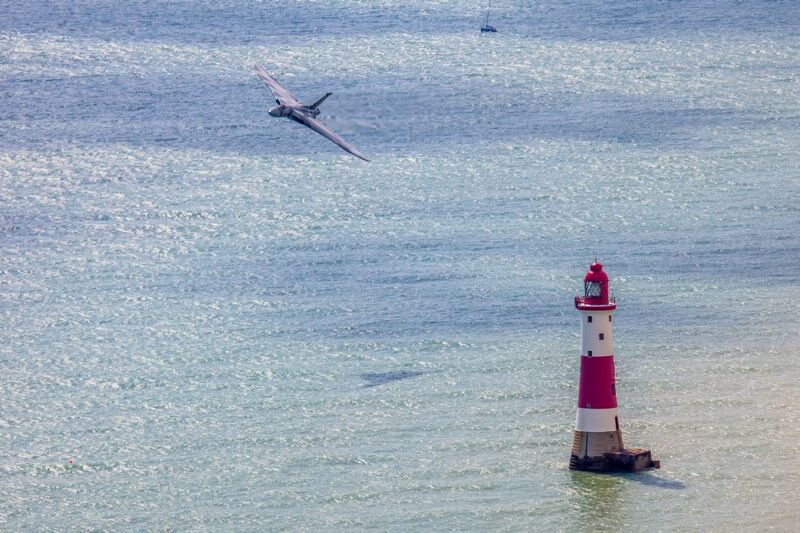 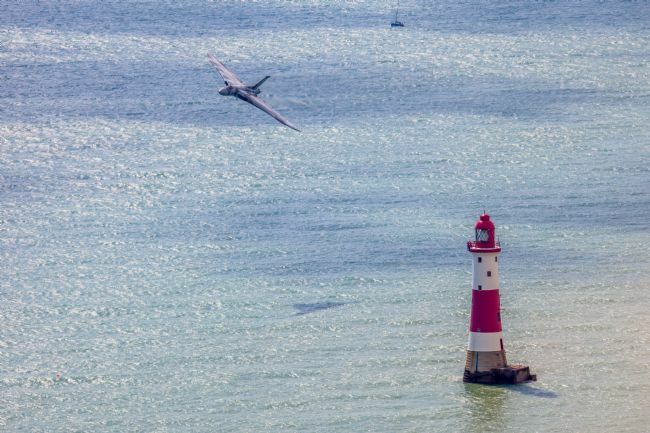 The Vulcan Bomber XH558 banks around to the right after passing the Beachy Head Lighthouse before running in to start her display at Eastbourne Airborne 2015, this is sadly a sight that will come to an end once the display season is over this year. 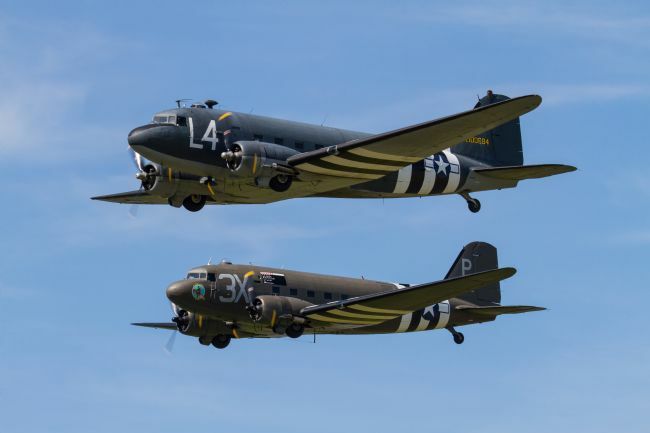 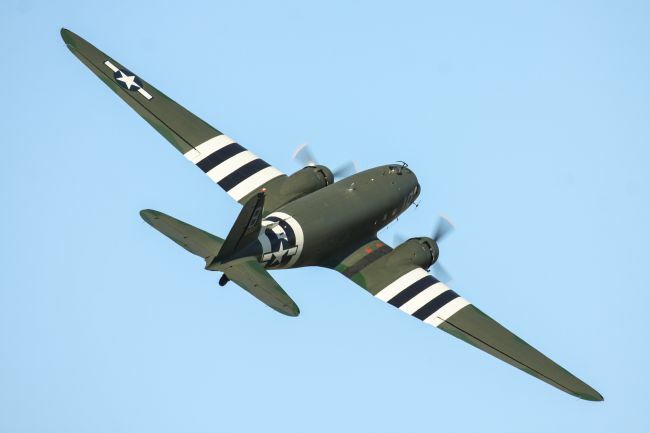 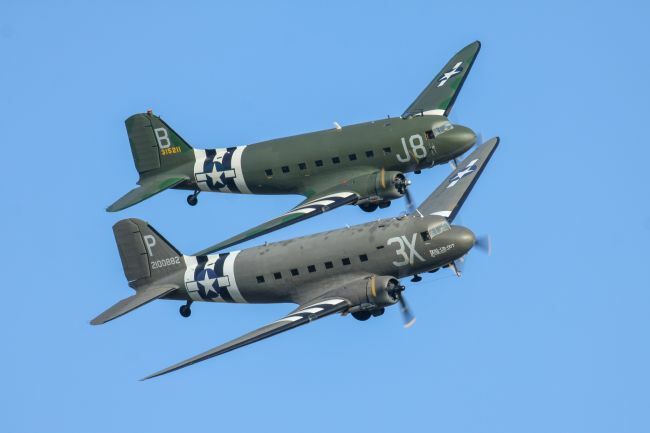 A pair of Dakota DC3 with D-Day invasion stripes, also known as the C47 Skytrain. 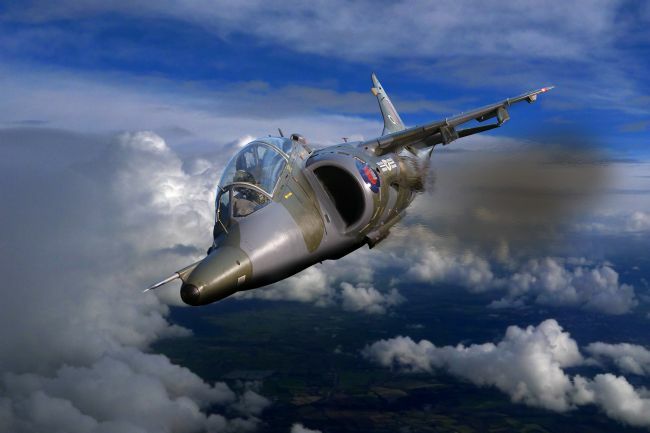 Harrier T4 depicted in flight, this example was a former RAE Harrier which was photographic static and added to a sky background. 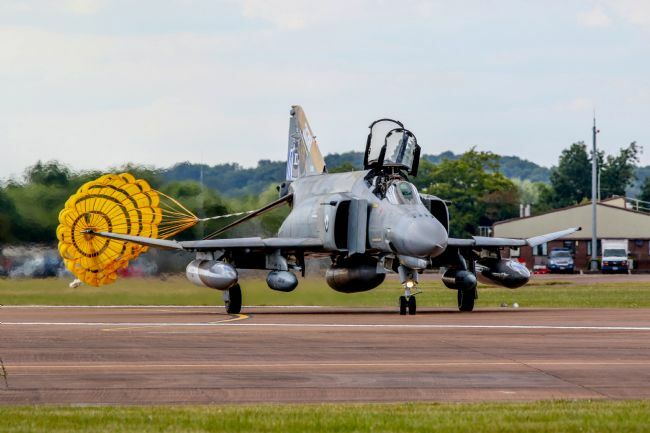 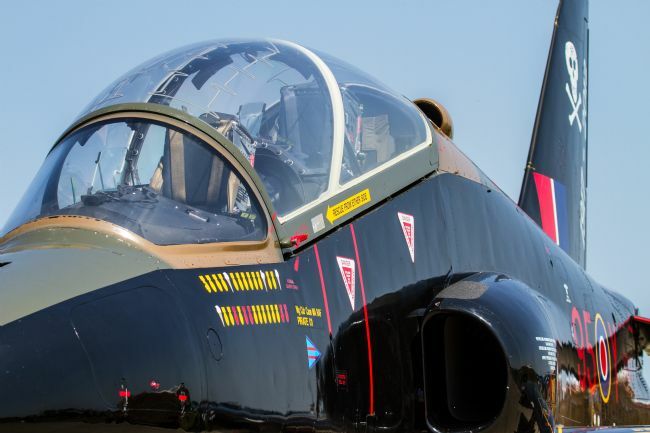 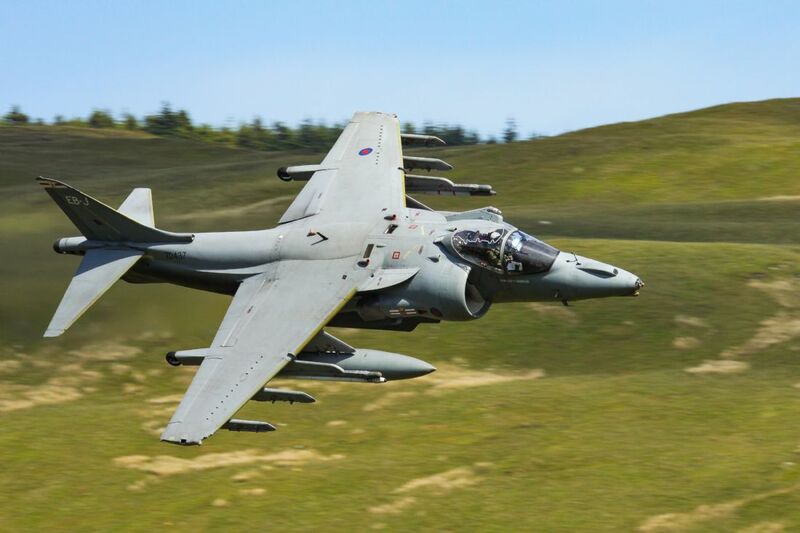 The harrier shown was at RAF Valley in the 1970's and possibly one of the IV Squadron Harriers before being delivered RAE Farnborough in 1990 and was used as an Electromagnetic Compatibility test vehicle. 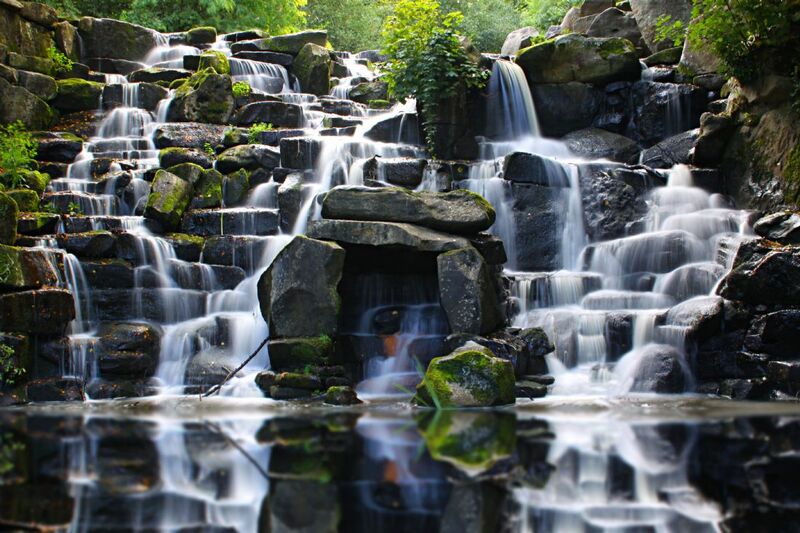 Created with my own images. 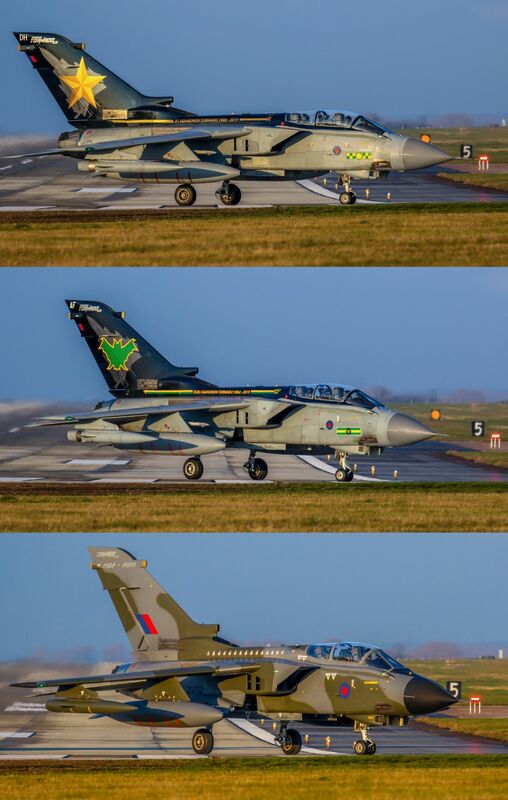 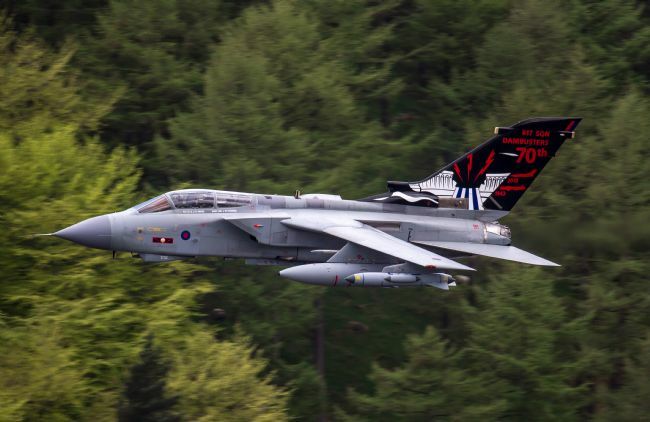 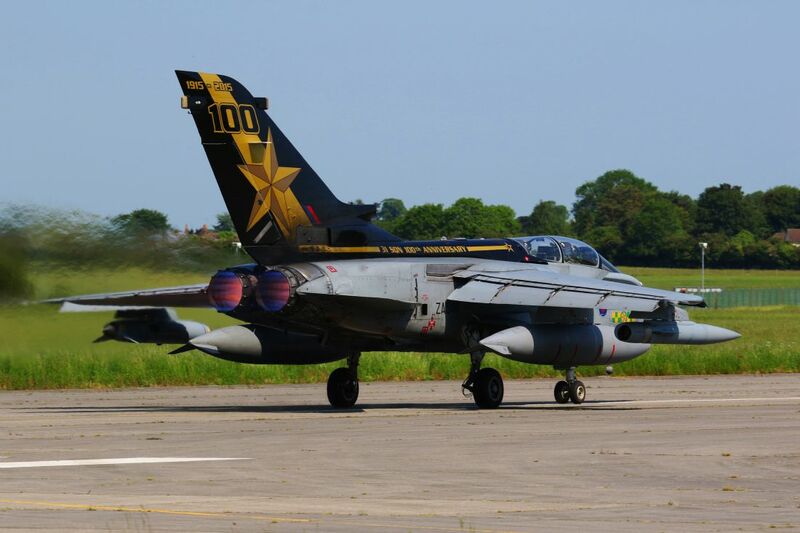 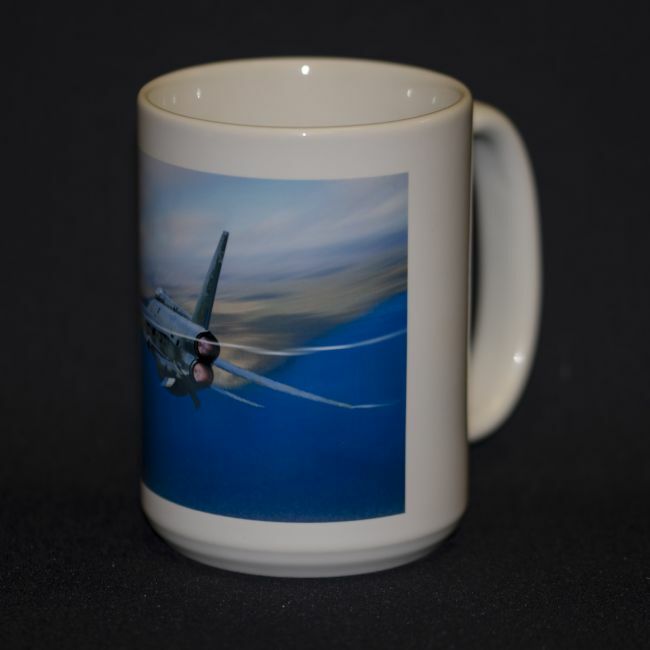 XV Squadron Tornado GR4 Role Demo, created using my own images. 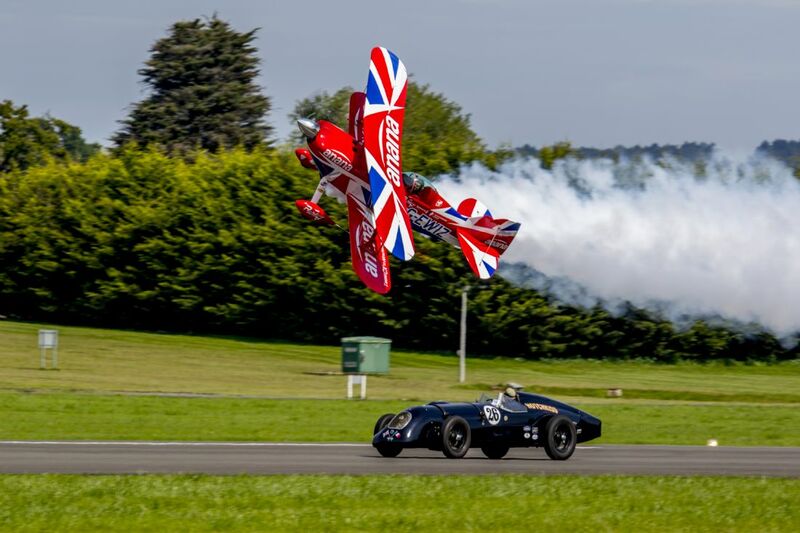 A Pitts S2 Special muscle biplane piloted by Rich Goodwin takes on the Hodgkiss car in a race down the runway at Dunsfold. 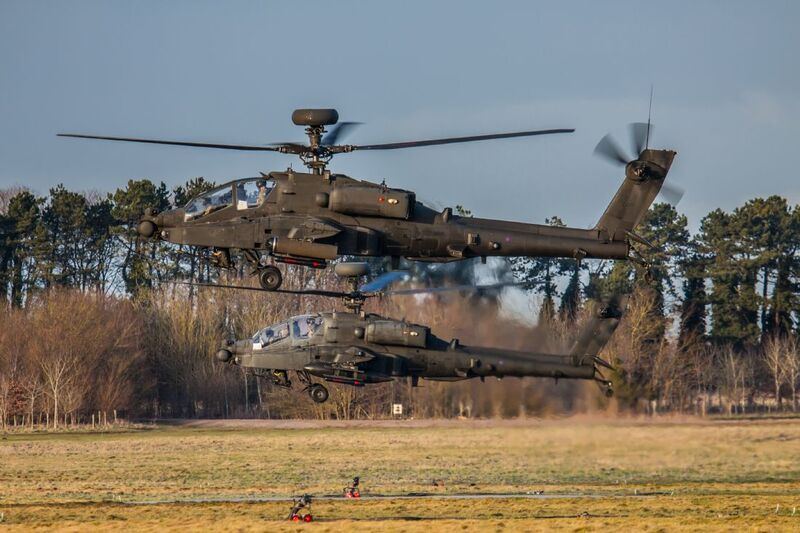 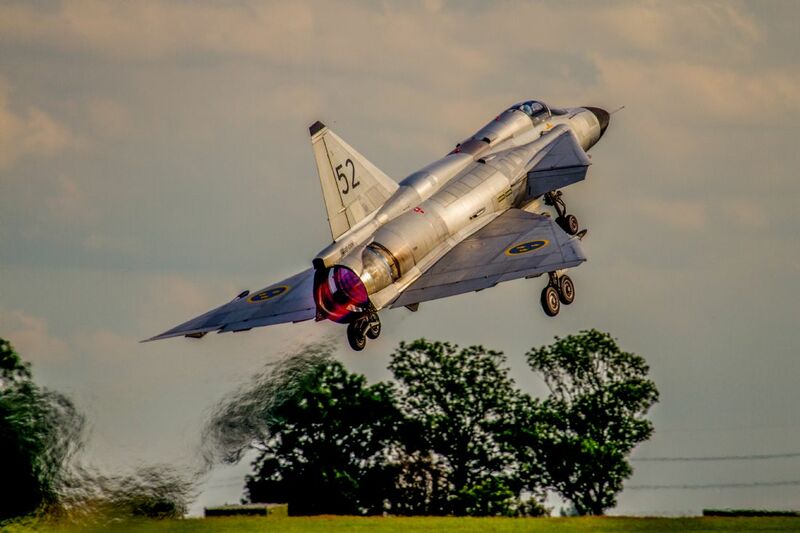 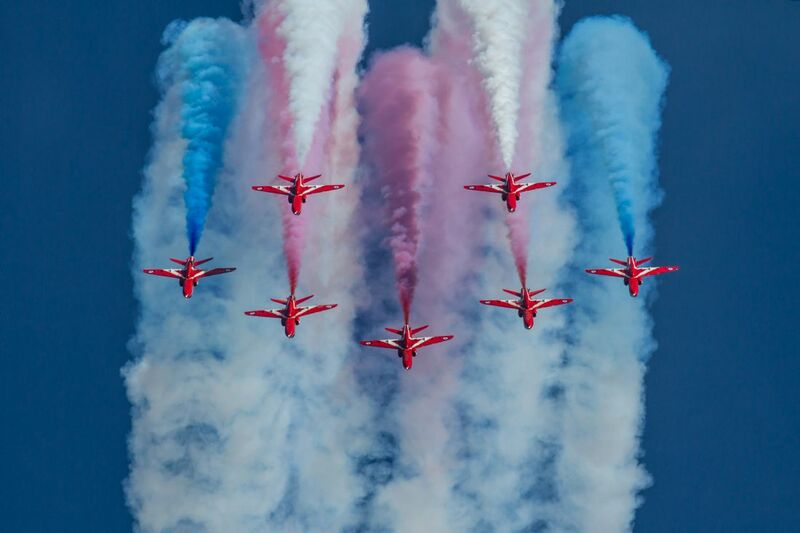 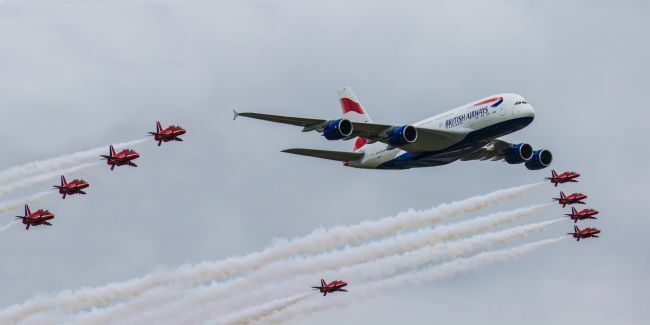 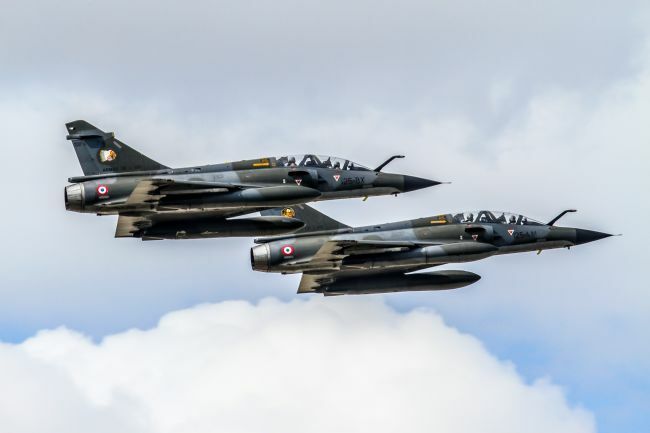 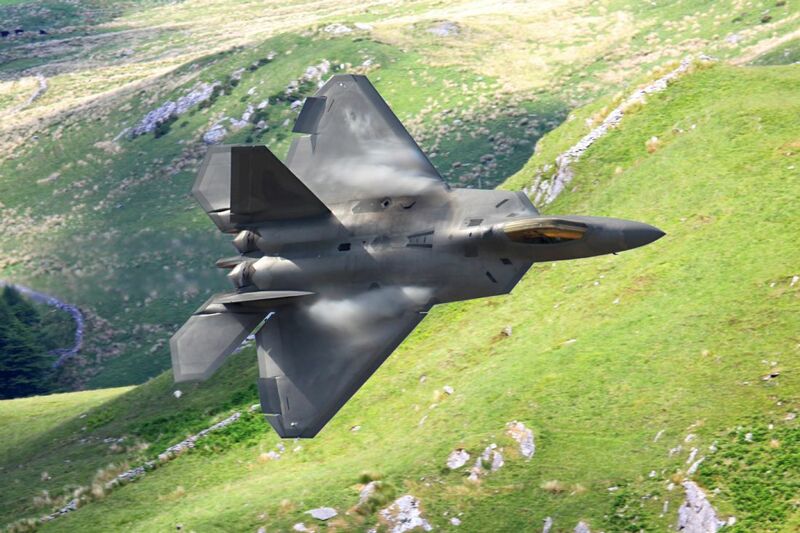 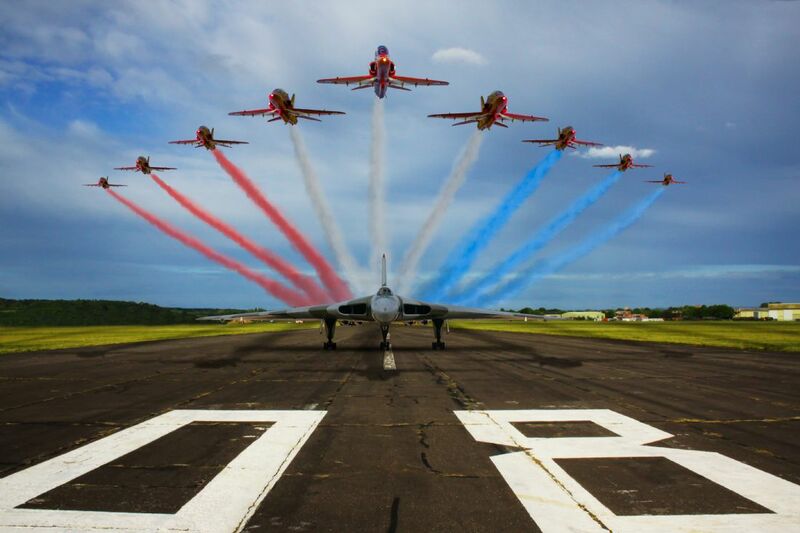 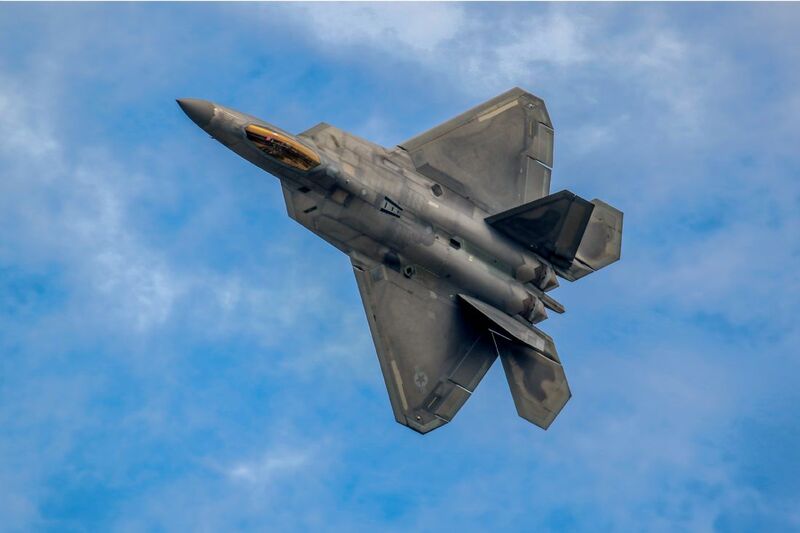 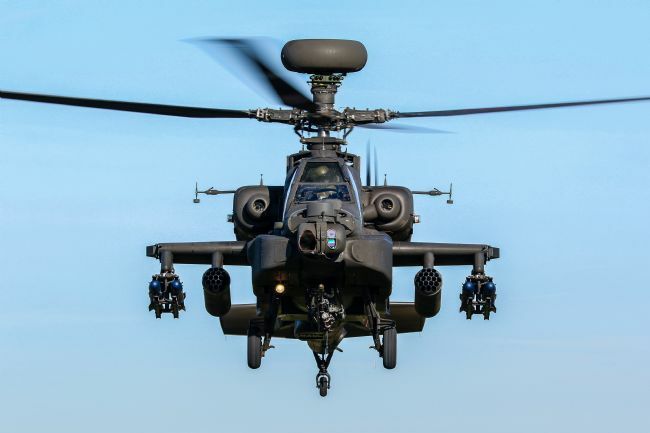 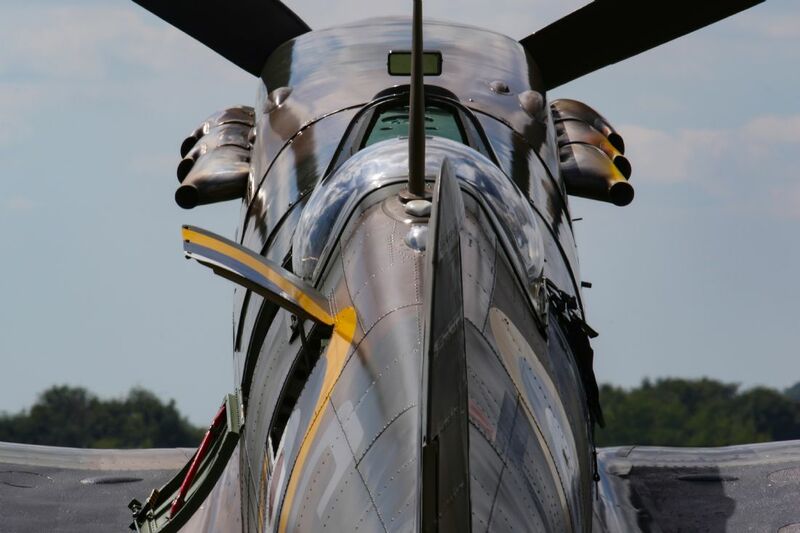 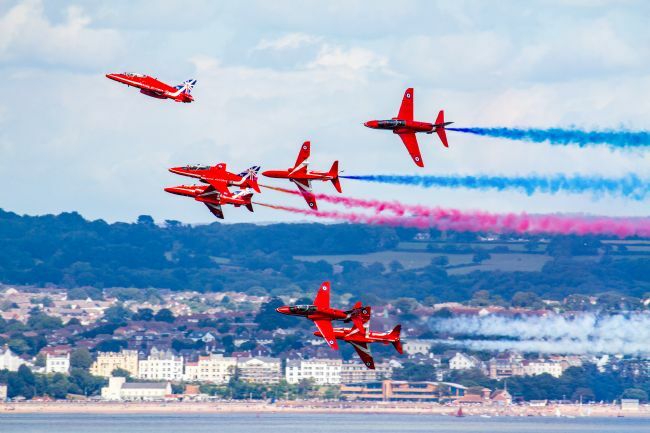 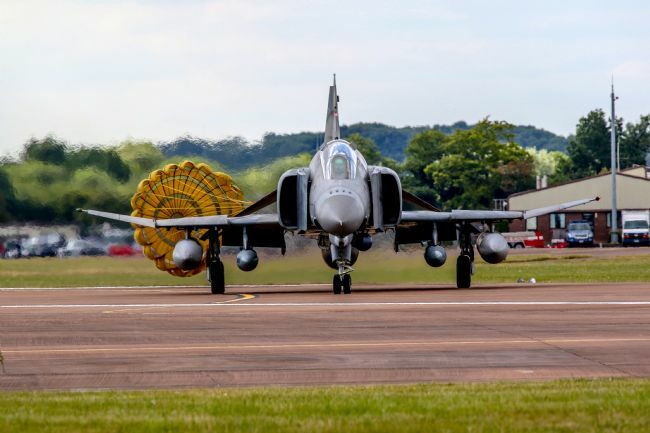 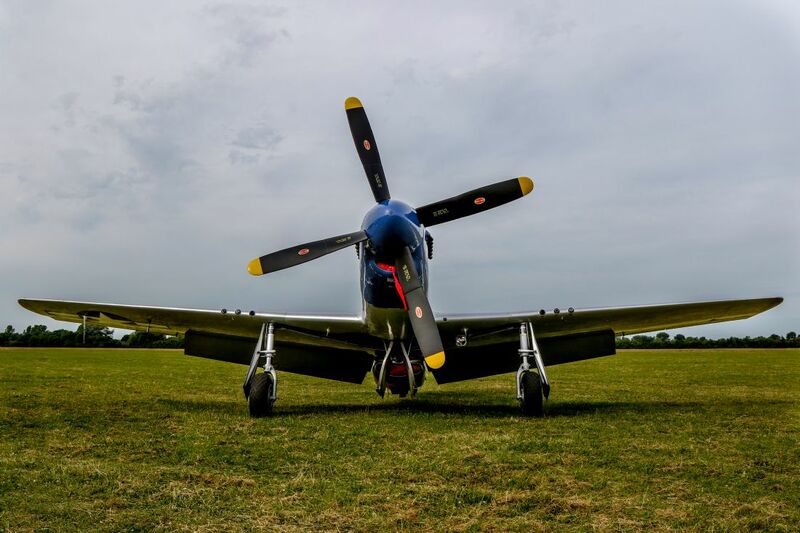 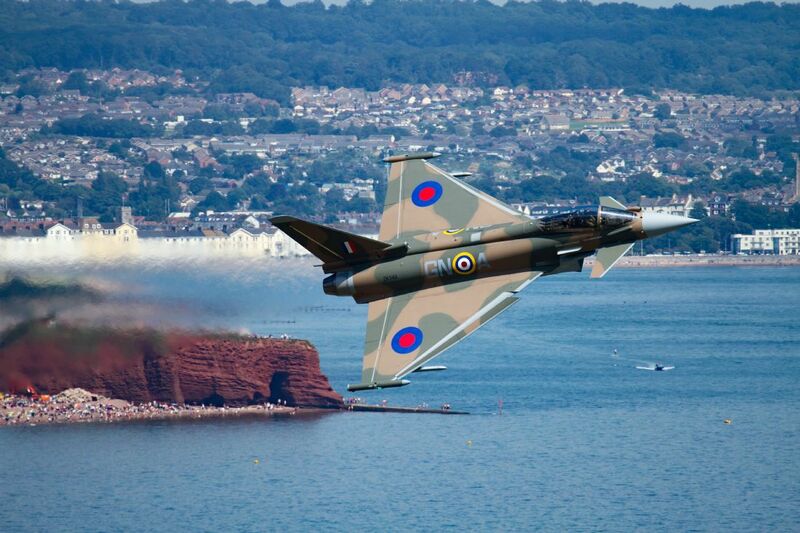 This photograph took 2nd place in the annual airscene photo competition. The A10 Tankbuster or Warthog depicted in flight. 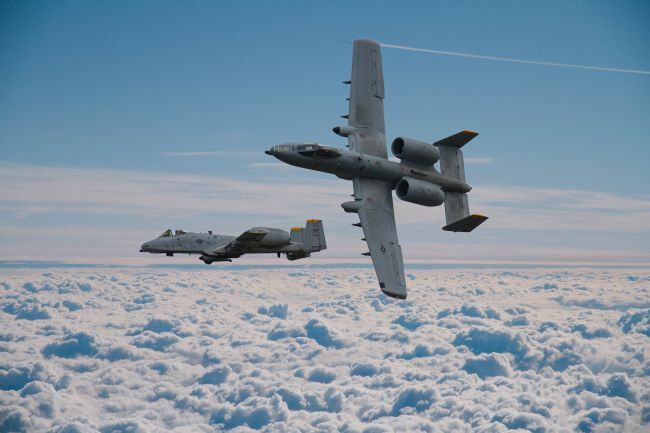 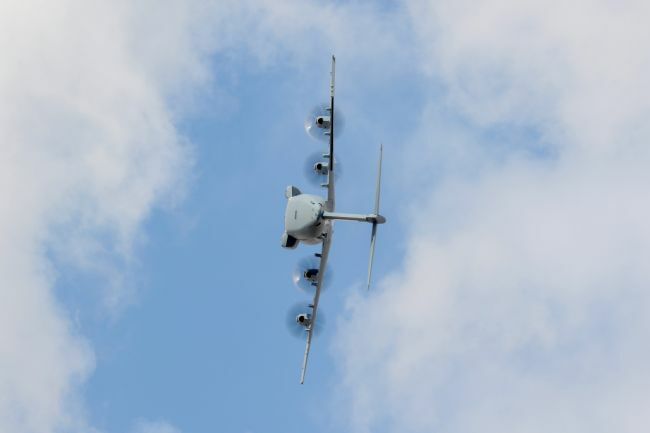 The A10 is a formidable air to ground combat support aircraft due to its ability to loiter for long periods coupled with a ferocious GAU8 Avenger which can penetrate tank armour. Created with my own A10 images and the background with kind permission of PH Images. 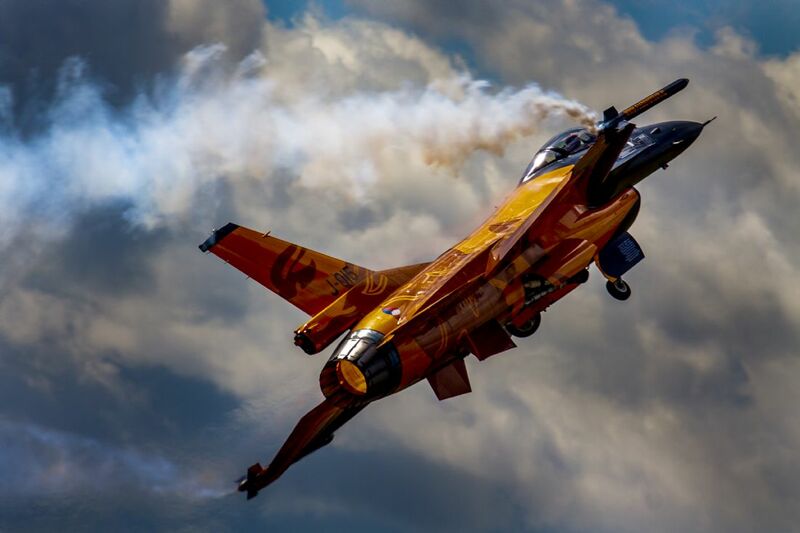 The Dutch display team F16 with its distinctive Orange Livery with the teams motto One Team One Mission takes off for its display at RAF Waddington air show. 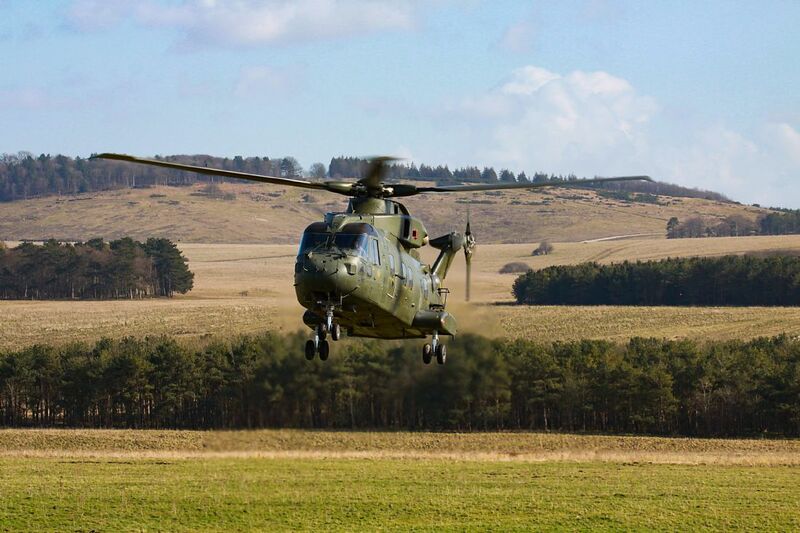 An RAF Augusta Westland AW 101 Merlin medium lift helicopter coming in for fuel on Salisbury Plain Training Area. 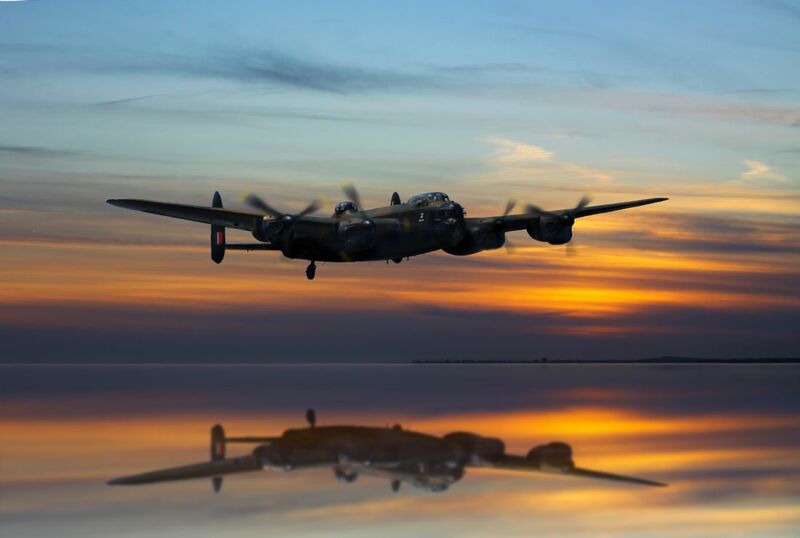 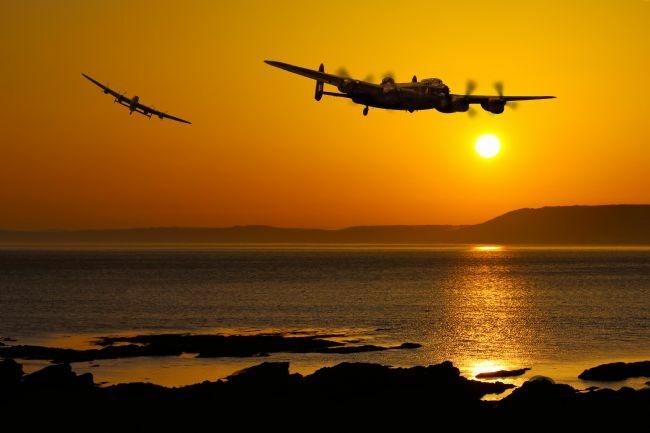 Lancaster Bomber makes landfall at sunrise over a calm sea with Worthing in the distant background in this digital montage using two of my images. 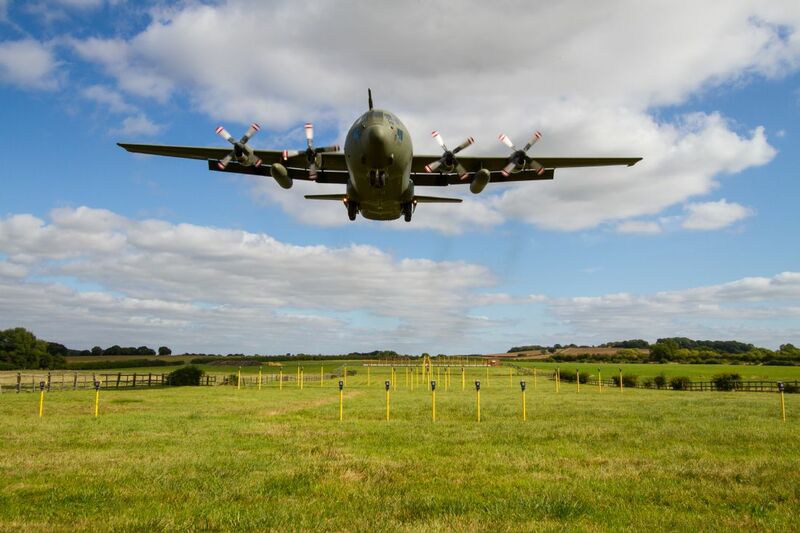 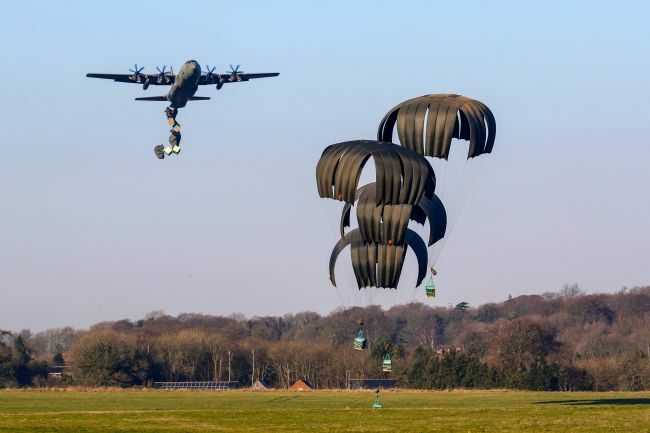 A Hercules C130 running in for an air drop over Salisbury Plain after the previous C130 had done it's drop with the chutes about to touch down. The original photo the Hercules in the background was a bit small and high so have made this composite image to enhance it. A C130 Hercules lands at Brize Norton in the UK, this was to be the last operational flights of the K Series model, this example now retired from service, A wide angle lens was used to capture this moment, this was the closest image with the next being overhead.. 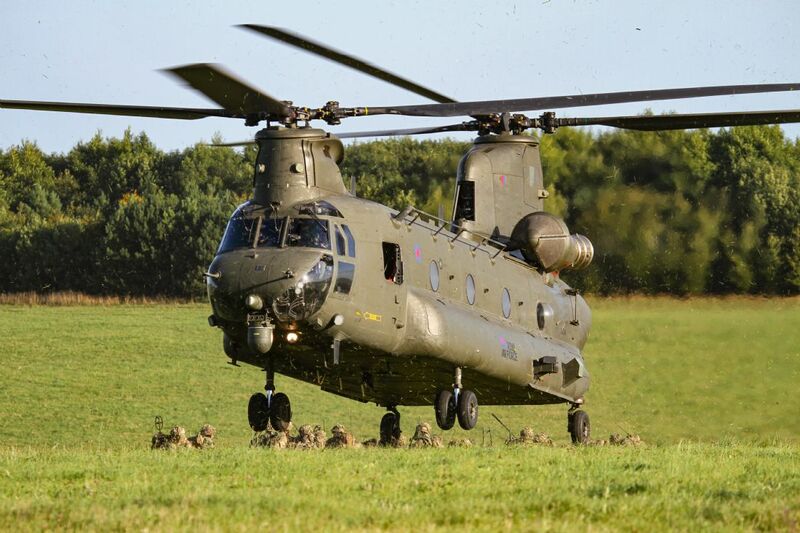 It was a bit draughty. 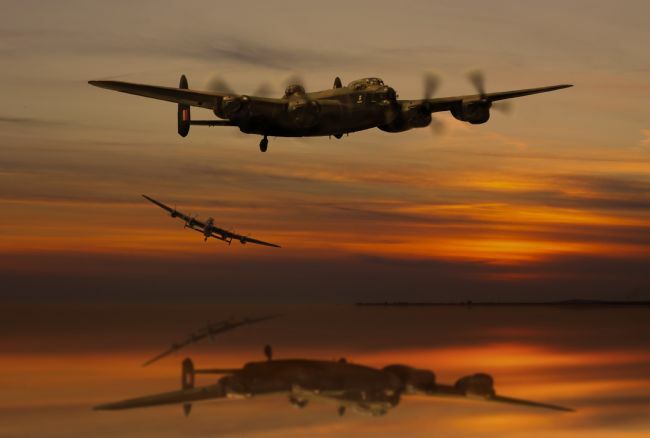 Lancaster Bomber Phantom of the Ruhr makes landfall as the evening sun sets over a calm sea with Worthing in the distant background in this digital montage using two of my images. 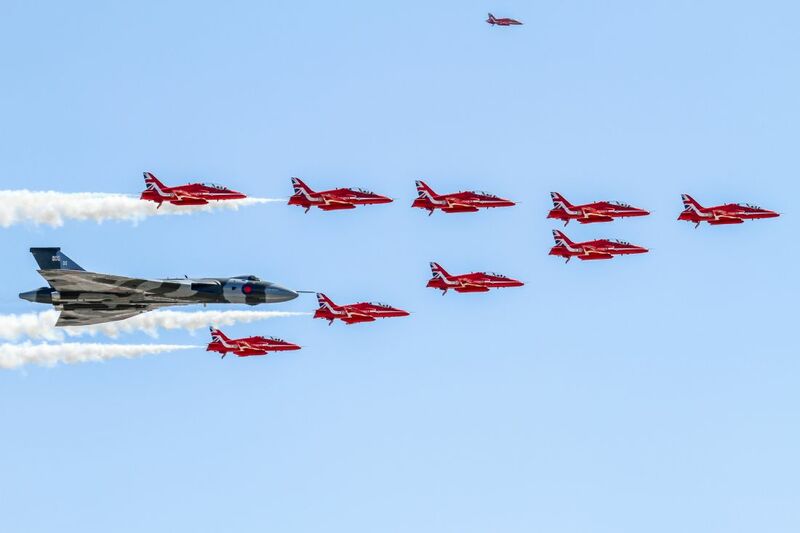 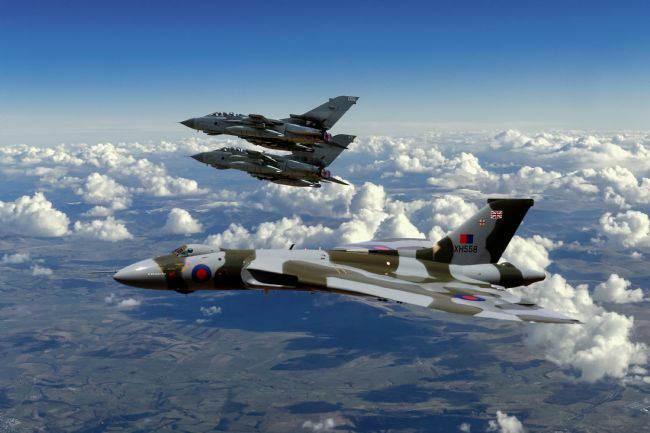 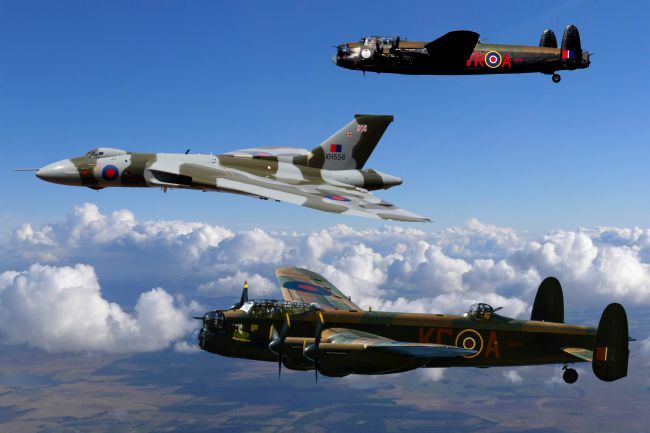 Vulcan Bomber XH558 and Tornados from 12 squadron RAF depicted flying together as they did this year in the Vulcan Bomber XH558 final year of flight in 2015. 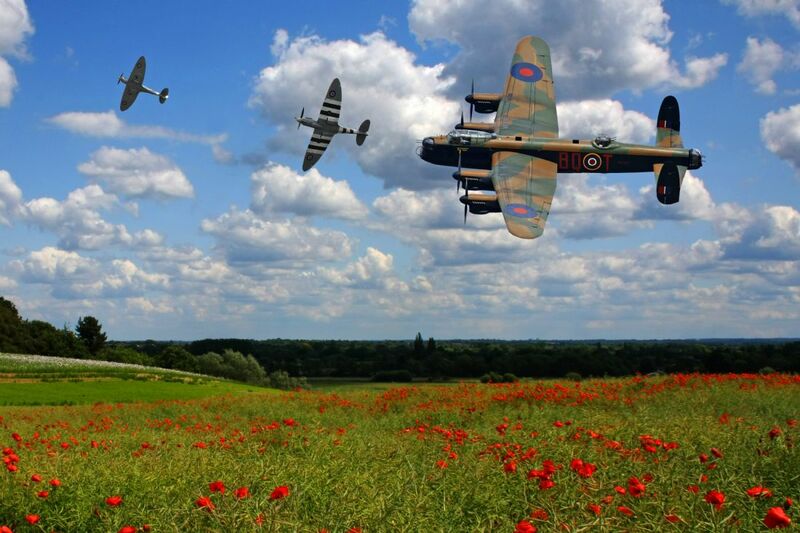 Note: this is a composite image created using 3 of my images and the background with kind permission. 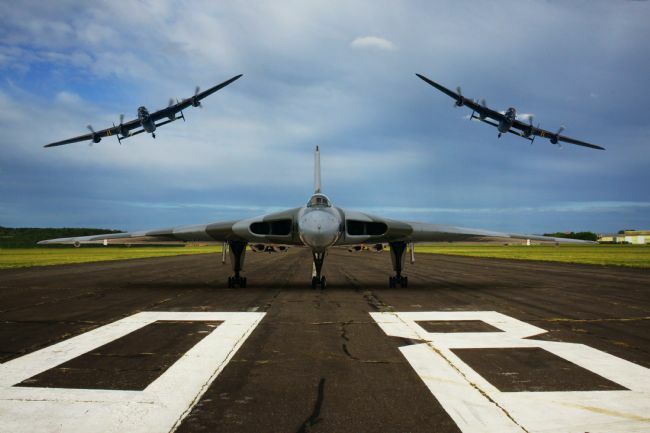 Vulcan Bomber XH558 and Tornados depicted flying together as they did this year in the Vulcan Bomber XH558 final year of flight in 2015. 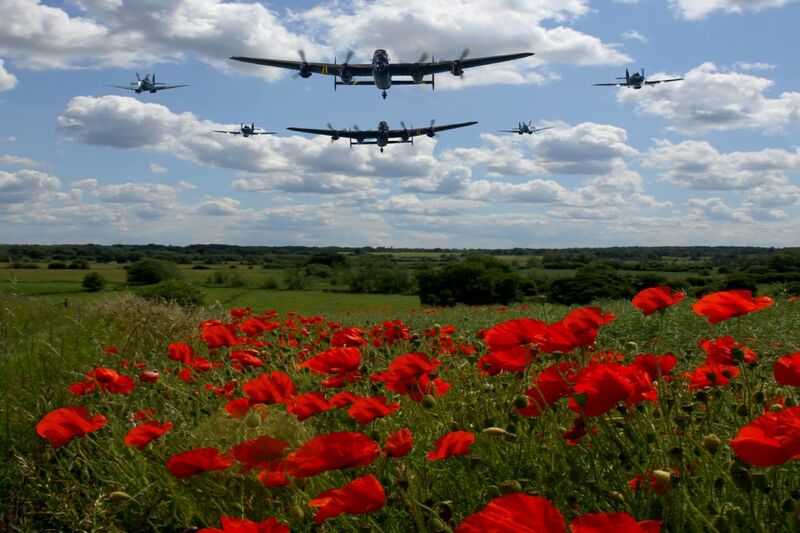 Created using 3 of my images and the background with kind permission of PH Images. 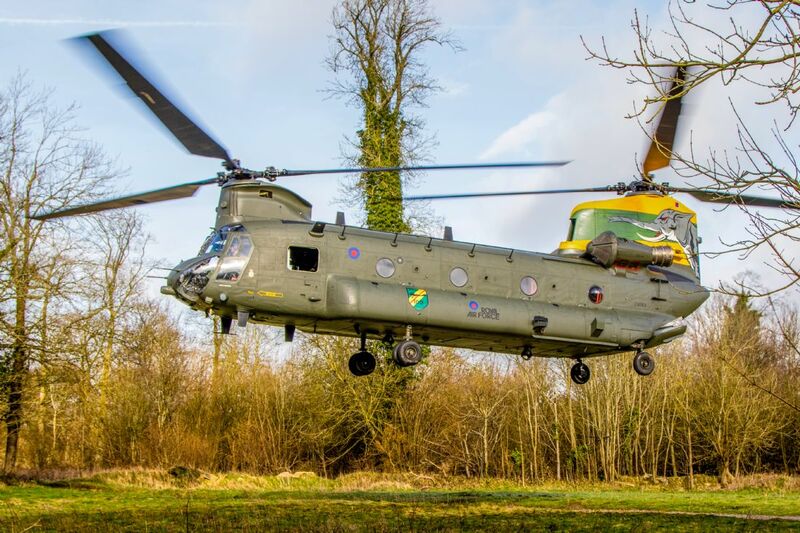 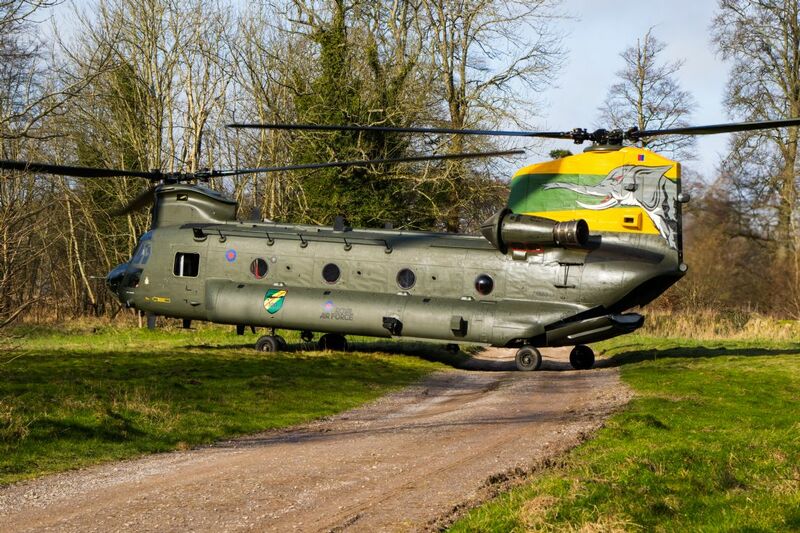 A slightly different angle of the 27 Squadron Chinook tandem rotor helicopter on Salisbury Plain in a woodland area, this chinook sporting a special tail and is affectionately called Nellie by photographers. 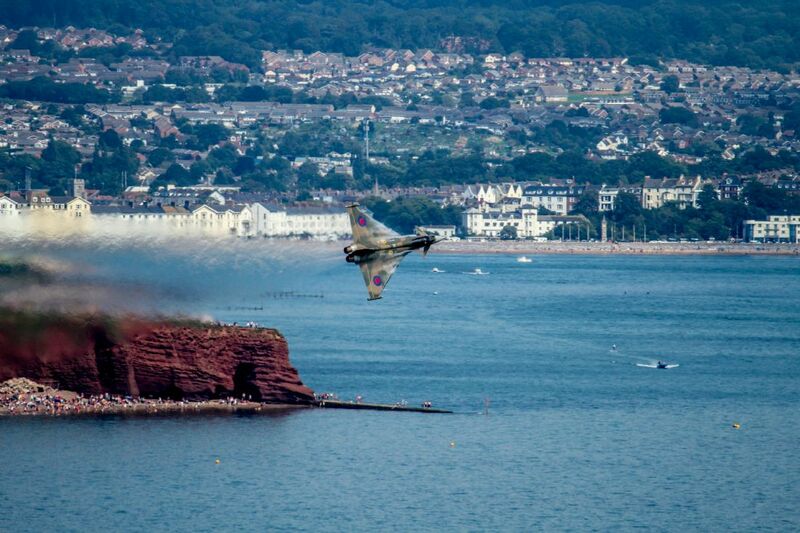 Typhoon Gina at Dawlish air show, I was on smugglers Hill for the show as the Typhoon was performing and it was an epic display of the Camouflage scheme Typhoon which also performs in the synchro pair memorial flight, this image is 2 of my photos combined. 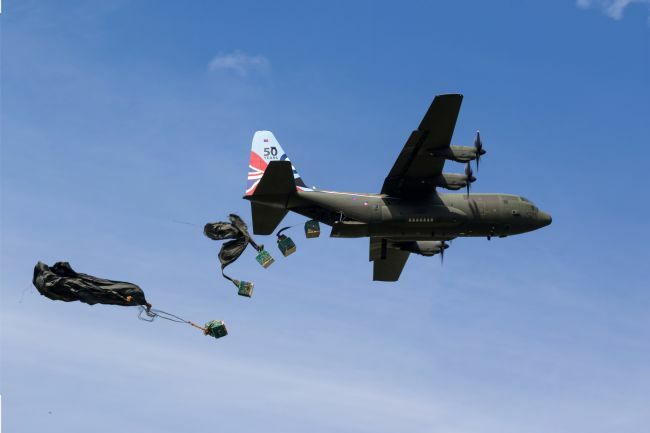 A C130 Hercules from RAF Brize Norton doing an airdrop at the drop zone, this C130 Hercules has the 50th anniversary of RAF Service markings for the Hercules on the vertical stabilizer. 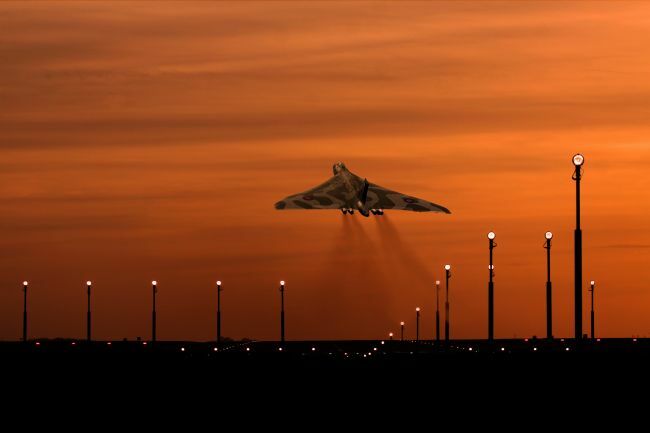 Vulcan Bomber XH558 takes off into a fiery sky during a stunning sunset at a UK RAF airbase. This image was created using images from my own photos as a tribute to the mighty warbird. 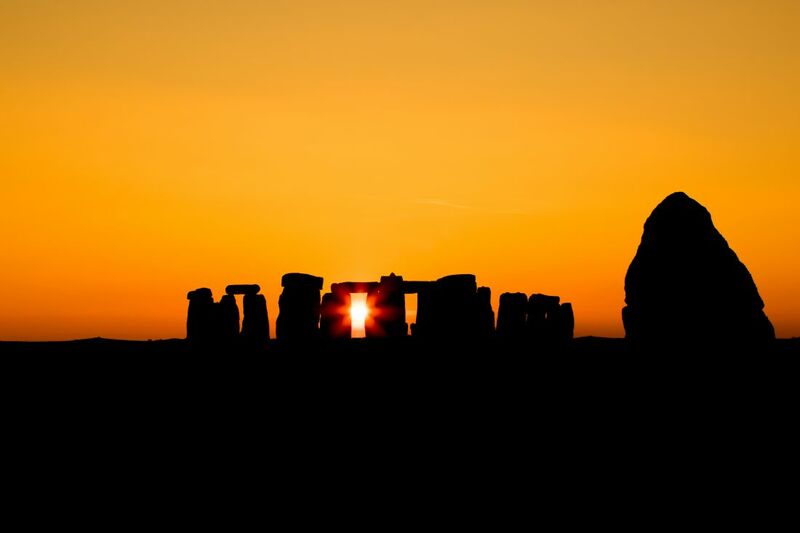 The sun begins to set behind the famous landmark of Stonehenge at Salisbury in Wiltshire. 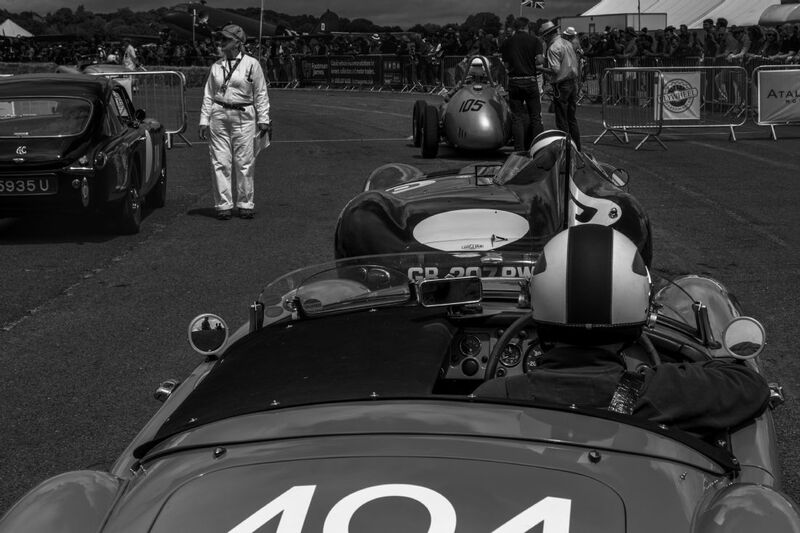 Some classic or vintage cars lining up on the starting grid for their demonstration runs at Bicester Heritage, classics such as Ferrari, Jaguar, Aston Martin, Bugatti and many more historic motors were doind a lap or two around the race track at the flywheel festival at Bicester Heritage.I have been given the kind permission from Bicester Heritage management to host these photographs taken by myself of the race cars in the Historic Bicester Heritage airfield during the festival. 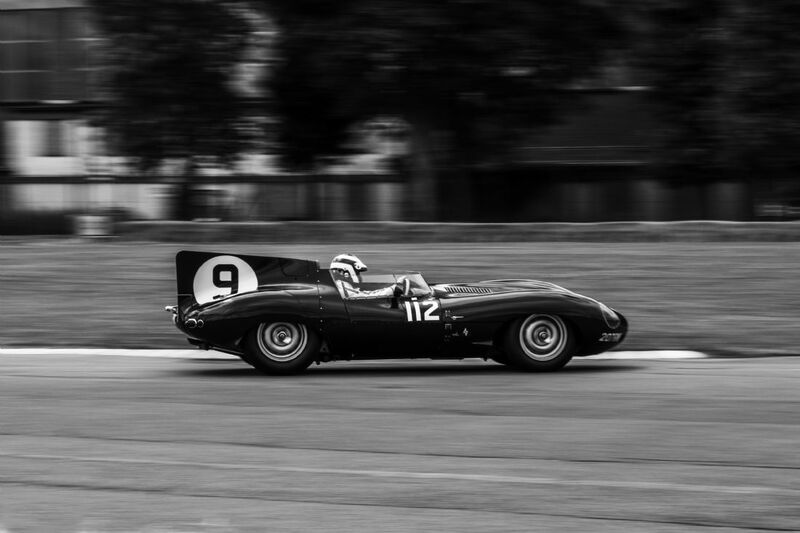 A Jaguar D Type at the Bicester Heritage Flywheel Festival 2017 during a timed demonstration run. I have been given the kind permission from Bicester Heritage management to host these photographs taken by myself of the race cars in the Historic Bicester Heritage airfield during the festival. 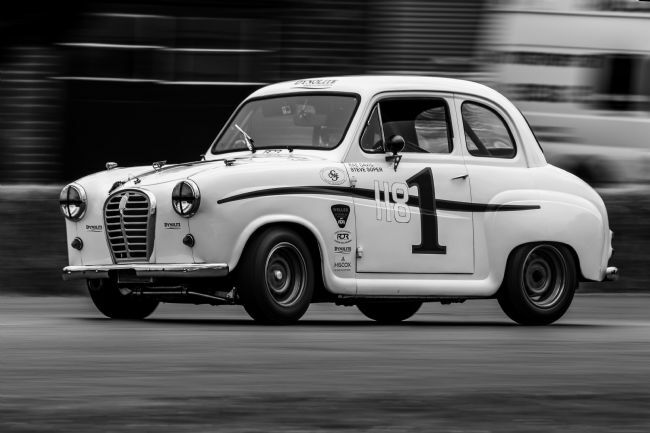 An Austin A35 with Steve Soper and Alex Rae drivers names on the car at the Bicester Heritage Flywheel Festival 2017 during a timed demonstration run. I have been given the kind permission from Bicester Heritage management to host these photographs taken by myself of the race cars in the Historic Bicester Heritage airfield during the festival. 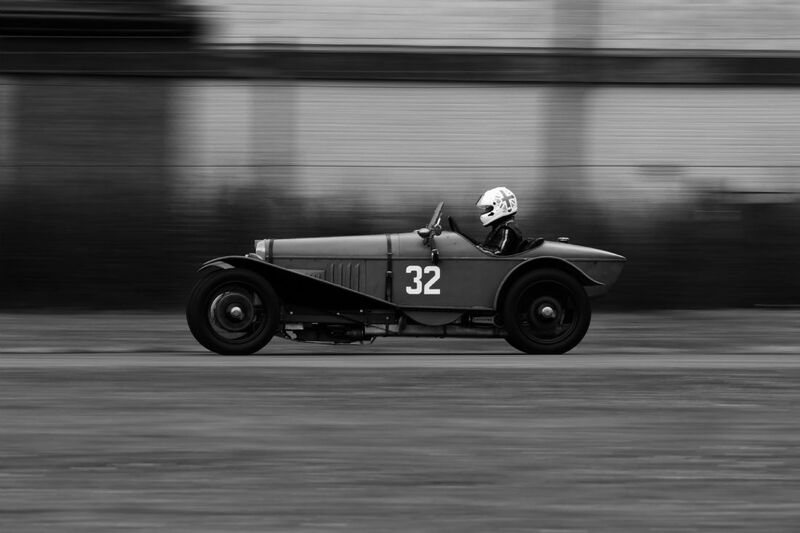 A vintage race car at the Bicester Heritage Flywheel Festival 2017 during a timed demonstration run. I have been given the kind permission from Bicester Heritage management to host these photographs taken by myself of the race cars in the Historic Bicester Heritage airfield during the festival. 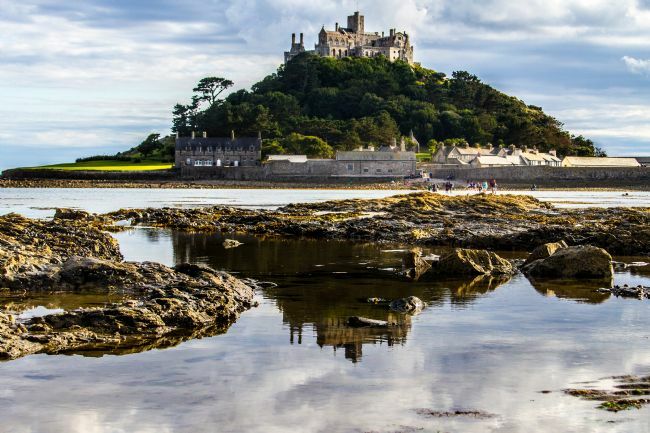 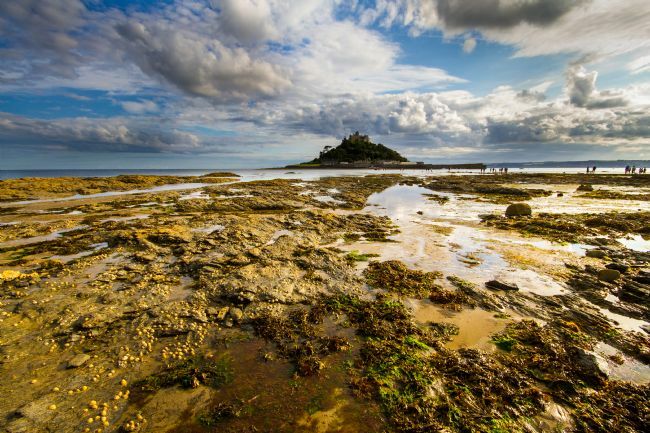 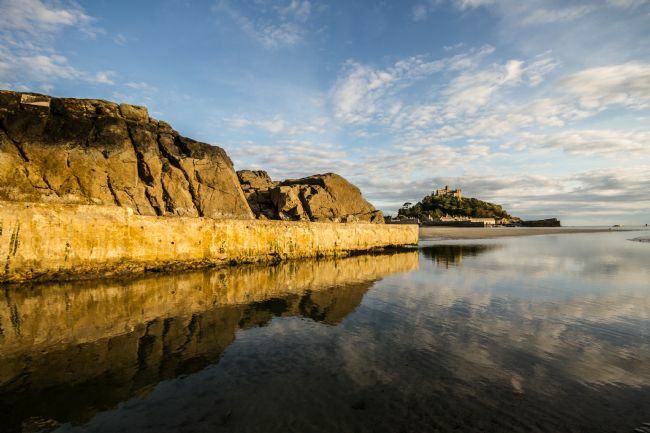 St Michaels Mount in Marrazion Cornwall from the left of the walkway and ferry boat area with St Michaels Mount reflecting in a rock pool. 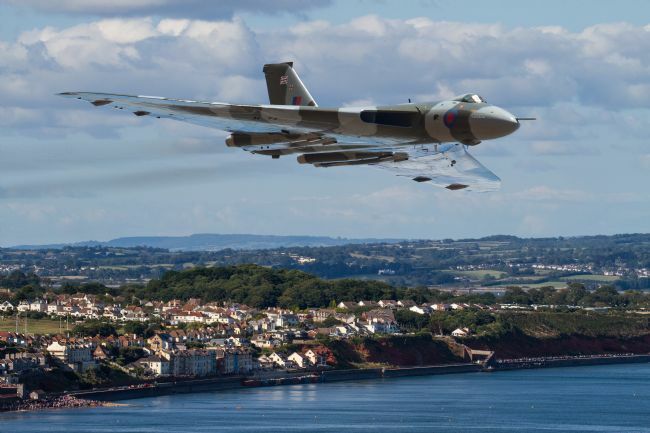 The Avro Vulcan Bomber XH558 makes it's final appearance at Dawlish air show 2015, a memorable display was opened with the famous Vulcan howl from a low and fast full throttle pass which was audible for most of its first pass along the beachfront at Dawlish, due to poor conditions when the Vulcan arrived I have created this image which the background was photographed from smugglers hill near the Smugglers arms pub in Devon and another photo of the Vulcan. 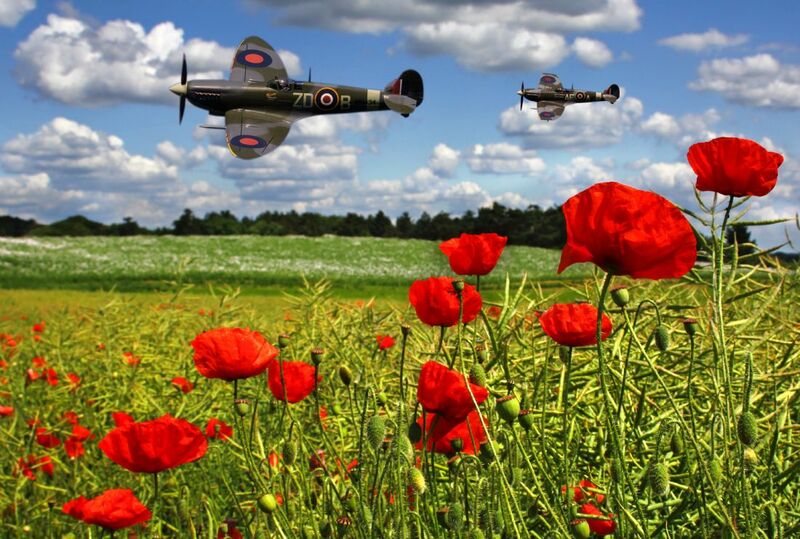 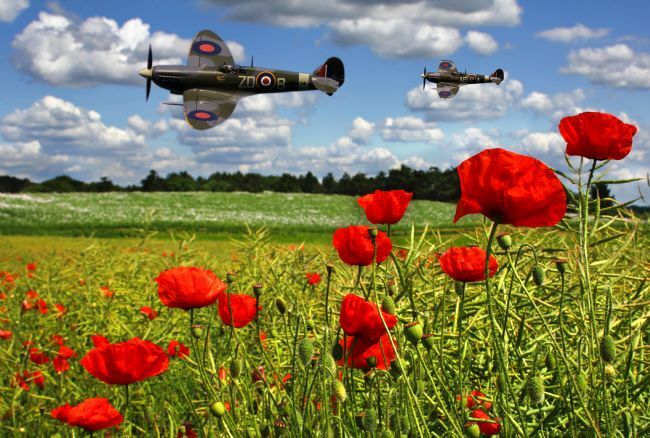 Two Spitfires depicted beating up the South Oxfordshire countryside in this digital montage of my Spitfire shots and a poppy field.